Tigger has taken next week as a holiday from work and, combining this with the two weekends and the Bank Holiday on May 27th, that gives us ten days to get out and about and see the sights. Or to relax and do nothing much, as the mood takes us. Today, though, we are not relaxing but are off to Margate in Kent to meet a friend and renew our acquaintance with the town. 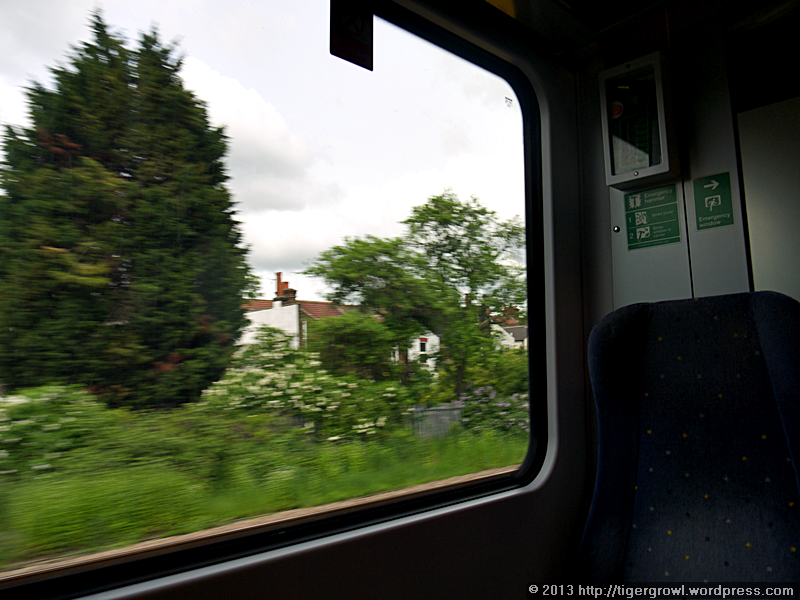 The choice way to travel from the Angel to Kent is to walk or take the bus to St Pancras station and there board an HS1 train. “HS”, as you might guess, stands for “high speed” and these trains benefit by using the special fast railway tracks provided for the Eurostar. 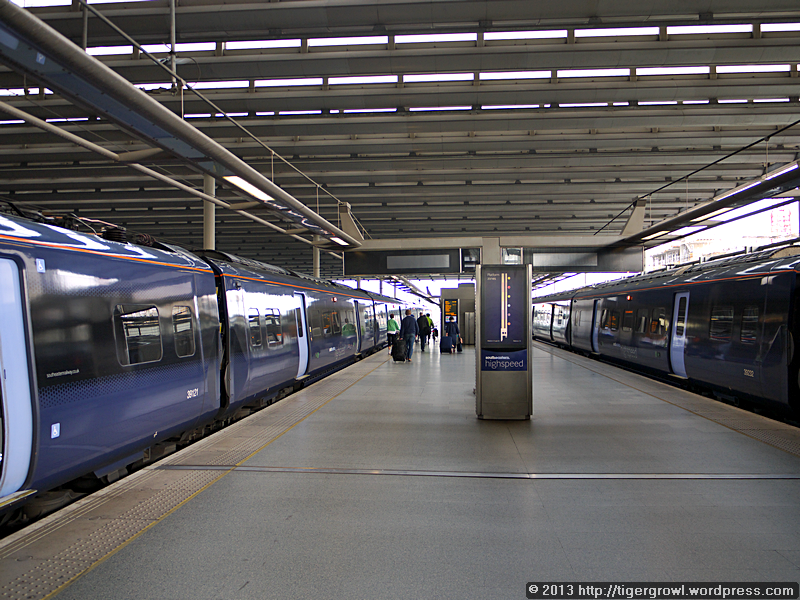 The HS1 runs at up to 140 mph and cuts a slice off the journey time. Tickets are a little more expensive than those for “ordinary” trains, so you have to decide whether the extra cost is justified. When we first travelled on the HS1, there were very few other people using the service but these days the trains are moderately full, showing that the travelling public is being won over. 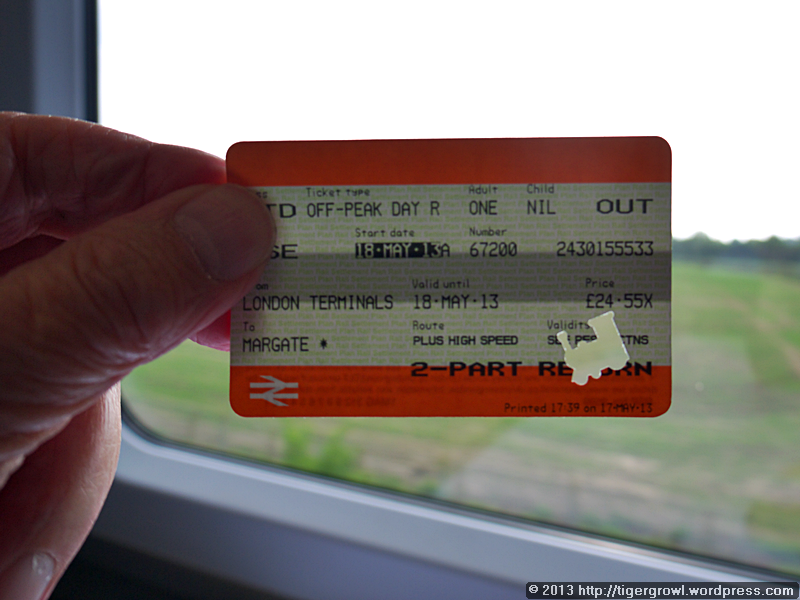 A feature of this route is the unusual ticket punches used by the train staff. It was explained to us that the punches issued by the company break easily and that the inspectors therefore buy their own. Their preferred punches are a novelty brand whose holes make little pictures. Each chooses a punch to suit his or her personality. For example, there is an Australian ticket inspector whose punch hole takes the form of a kangaroo. We had not stopped for breakfast before starting out and had to tighten our belts until we reached Margate. 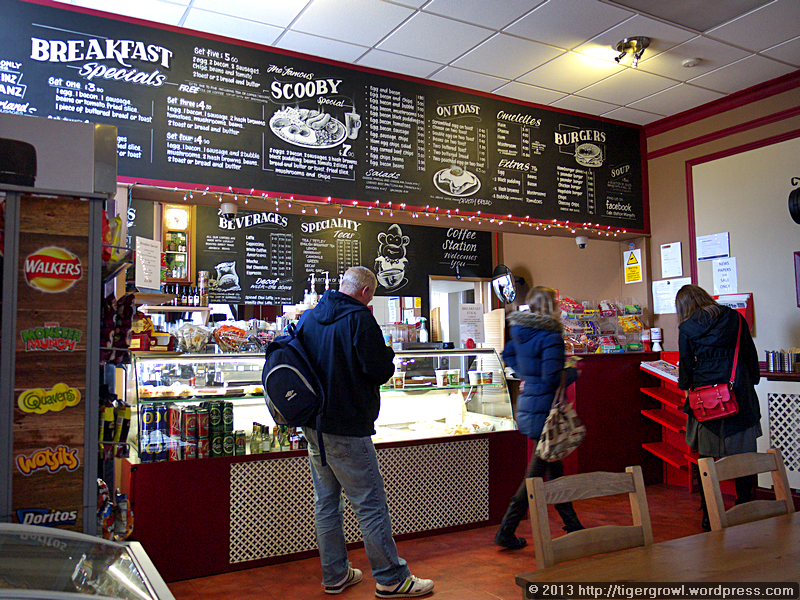 Fortunately, there is a good cafe – called by the slightly odd name of Cafe Station – on Margate station. Having met our friend, we partook of a leisurely brunch here. We set off along the seafront. Margate is famous for its sandy beach which made it a resort in the Victorian era and has kept it a favourite with day-trippers ever since. 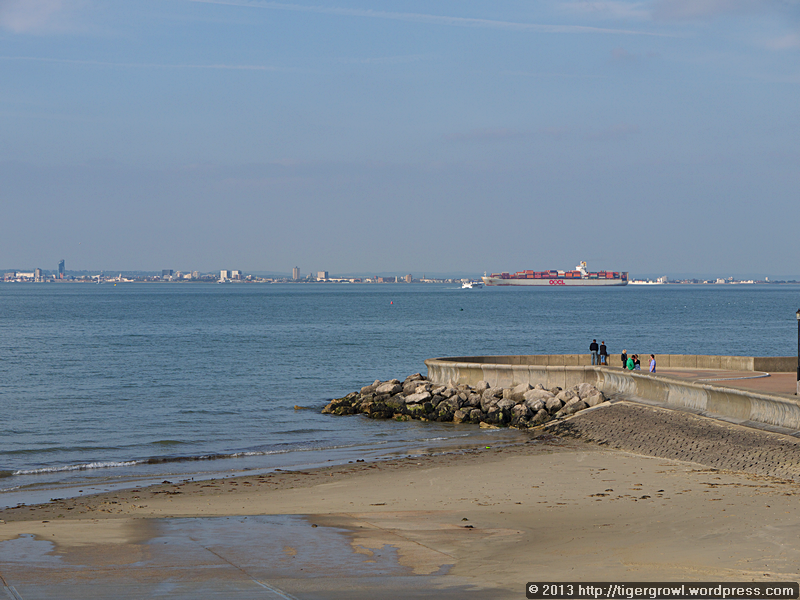 Today the sunshine made the beach look attractive but so far there were few people out enjoying it. Perhaps it would liven up later. 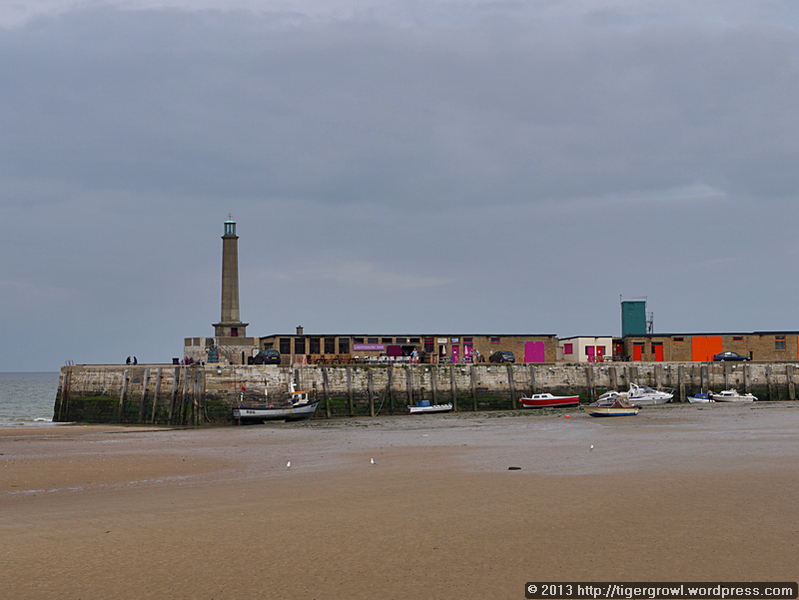 As well as being a beach resort, Margate is also a harbour. Shelter from the sometimes stormy conditions is provided by a structure that is officially called Margate Harbour Arm (built 1812-15) but is also known as “the jetty” or even “the pier”. 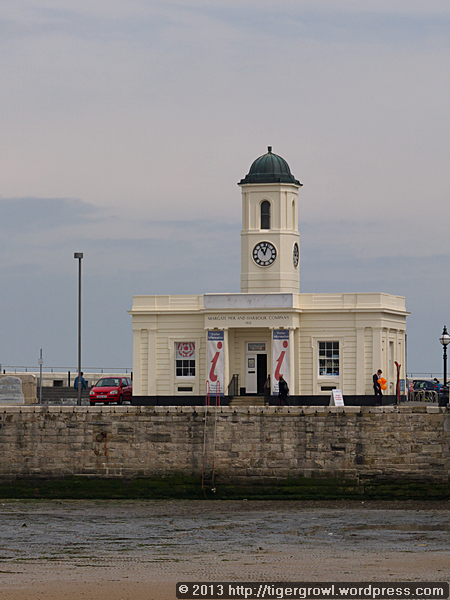 At the seaward end of the jetty is a lighthouse and at the landward end a pretty structure called Margate Custom House but also known as Droit House. This would once have been the office where merchants would have paid dues on their incoming cargoes but today it accommodates the tourist information office. However, it is not quite what it seems. Built originally in 1828, Droit House was destroyed by WWII bombs and was rebuilt to the original plans in 1947. It was refurbished in 2001 when an extension was added. 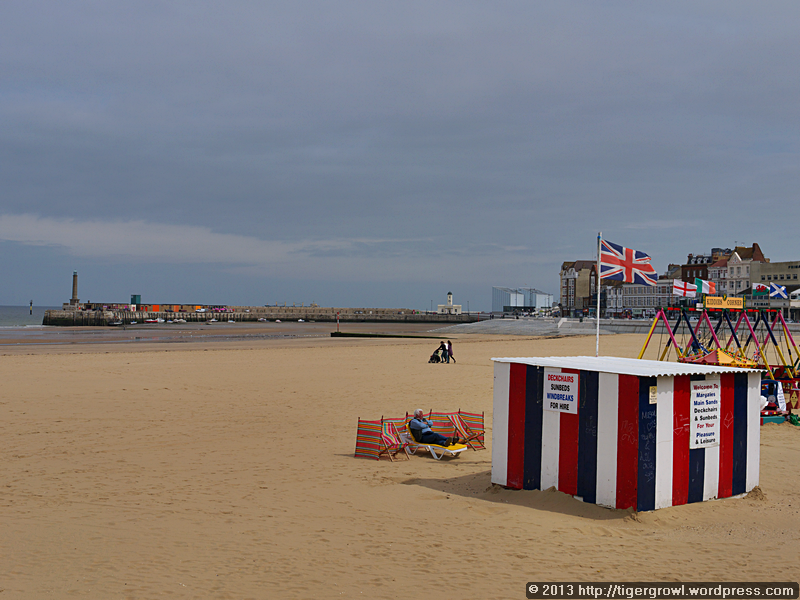 Why does Margate lack that most obvious accessory expected of any self-respecting seaside resort, a pier? It did have one. 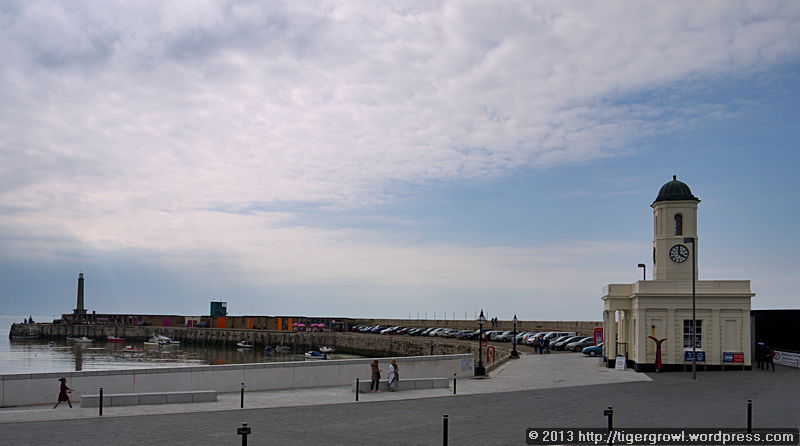 It was built by the Margate Pier Harbour Co and was designed by Eugenius Birch. Work on it started in 1853 and was completed in 1857, though the pier actually opened to the public two years earlier in 1855. Though it was obviously a pier, it was called Margate Jetty to distinguish it from Margate Harbour Arm which was known by then as “the pier”. Damaged several times by rough weather, Margate Jetty was condemned as unsafe in 1976 and two years later the weather completed its destruction. The metal framework still remained and was considered a hazard to shipping but attempts to demolish it were unsuccessful and parts of it still remain. 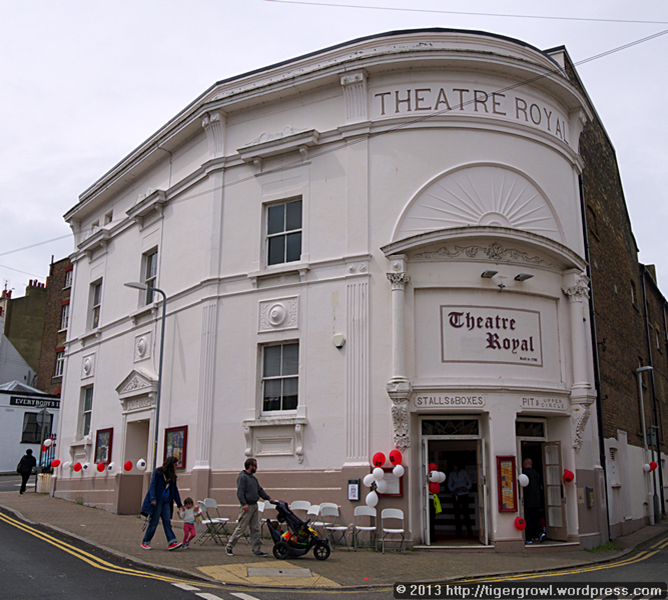 One reason for going to Margate today was to visit the Theatre Royal. 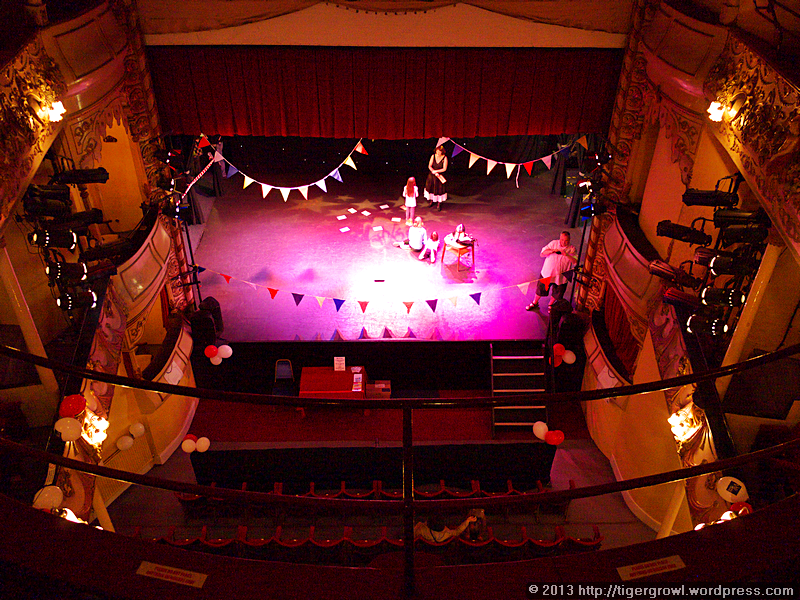 The theatre was holding a “Party Day”, with all kinds of events (talks, tours, workshops, etc) when the public was cordially invited to come in and nose around to its heart’s content. 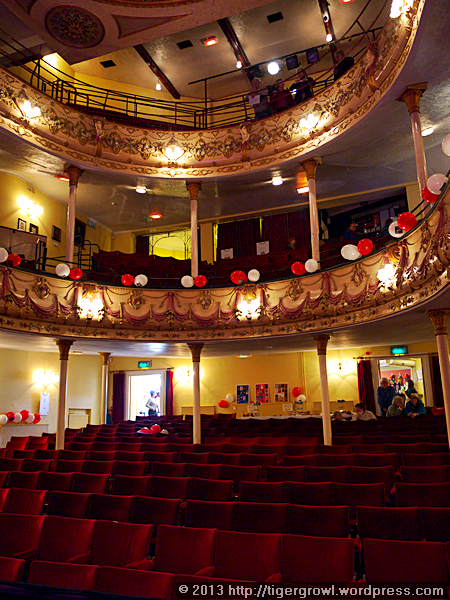 The theatre is of modest size, in fact I think we can say it is decidedly small. It is beautifully decorated, though, in the plush Victorian manner. This reminds us that for 19th century audiences, theatres were not merely places of entertainment but places where one went to see and be seen, to socialize and to enjoy luxurious surroundings. Such are certainly provided here. 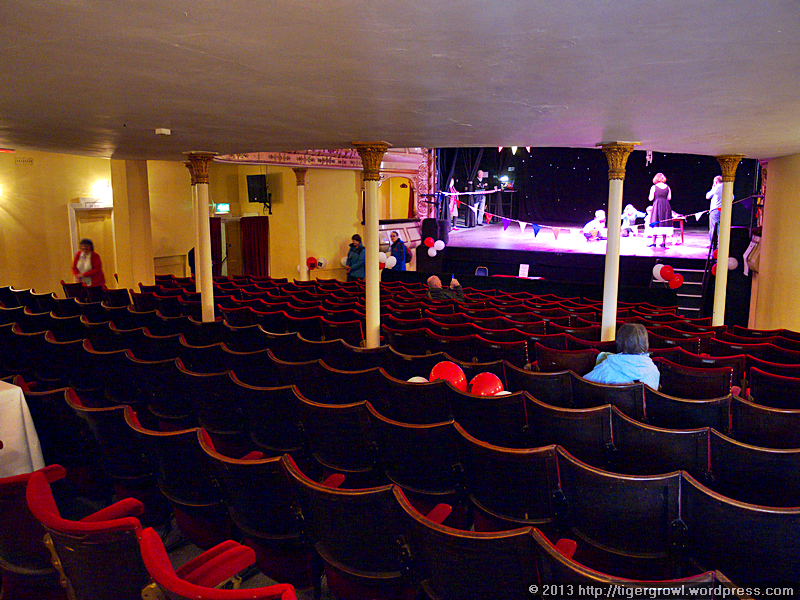 The audience sits on three levels – four, if you count the boxes separately. There are the stalls on the ground and below the level of the stage, the Royal Circle, upstairs and above stage level, and, at the top, the Gallery, or “the gods”, as it was frequently called by those who felt its height placed them in the realm of the Olympian deities. Up here, as the photo shows, the angle of view is very steep and you move along the rows of seats as though on a cliff face. It is a little dizzying until the brain adjusts to it. Topping off the handsome interior is the gorgeous ceiling. 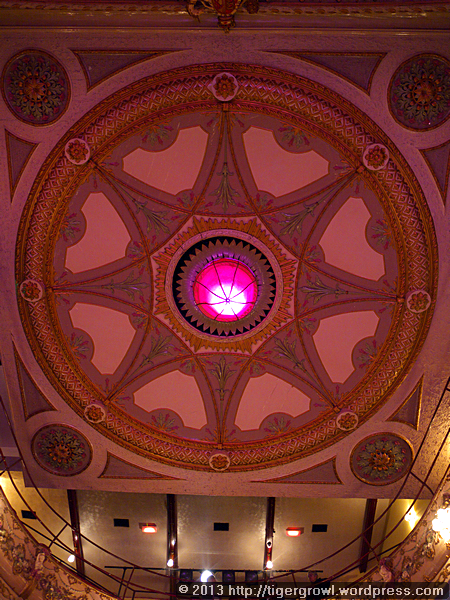 There are no nymphs or naked figures here, as so often in opulent theatre interiors, but an abstract, though colourful, geometric design. It could serve equally well in a church or, for that matter, a mosque. 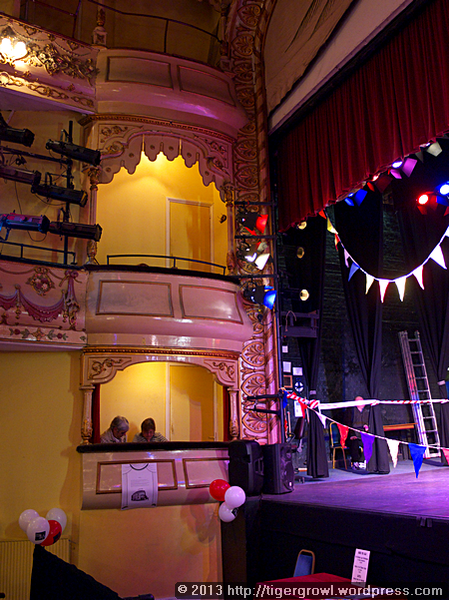 In keeping with the bijou nature of the theatre, the boxes – two on either side of the stage – are tiny. You could at most squeeze three chairs into a box but even two gives a somewhat intimate feeling. The doors to the boxes are also small and I had difficulty entering through the one in the photo. 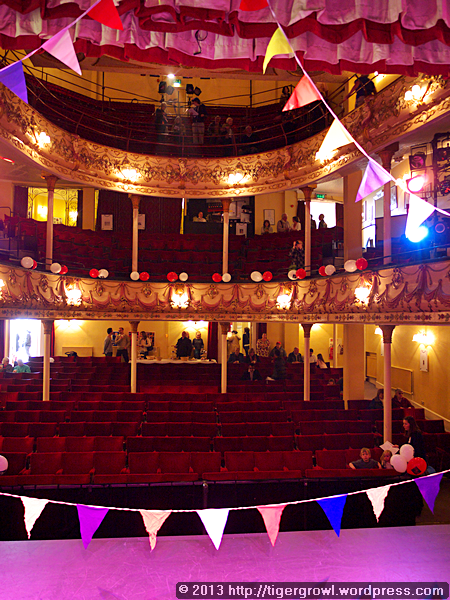 And finally, for the star-struck among you, here is an actor’s view from the stage. If if makes you feel a little dewy-eyed, perhaps that is because of all those lamps flooding you with their photons. 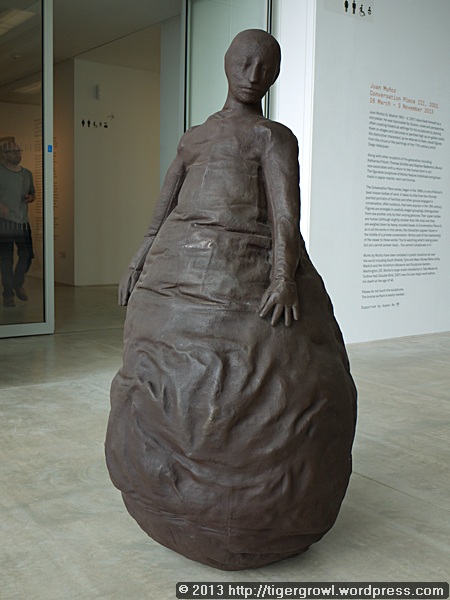 After the theatre, we strolled along to the Turner Contemporary, Margate’s premier art gallery. 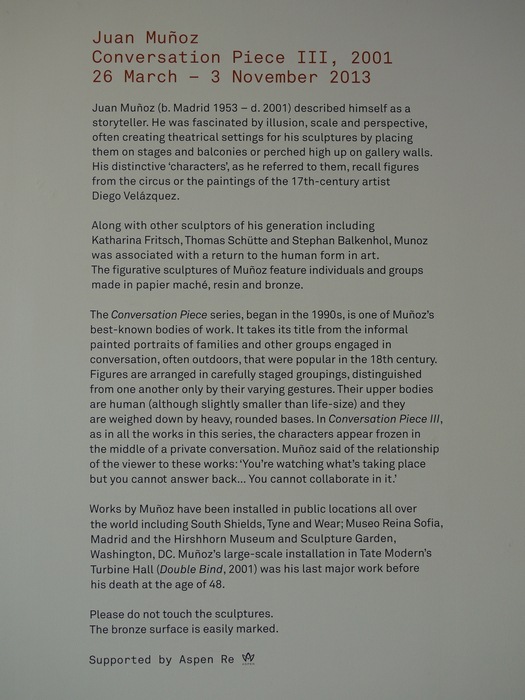 In addition to other works, there was an exhibition of Conversation Piece III by Juan Muñoz. 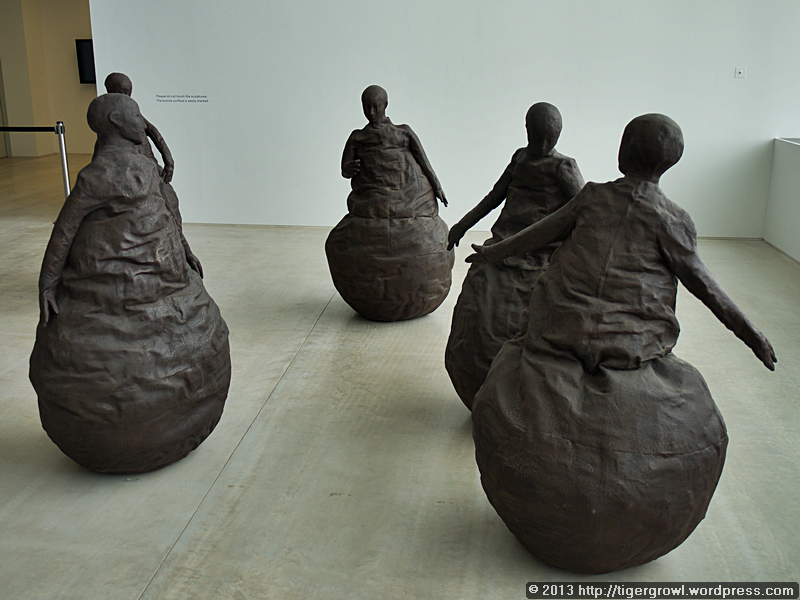 This consists of a number of figures which seem human and yet remote or alien. Are they in conversation as the title suggests? It doesn’t seem so. Rather each seems locked within his own thoughts. The figures both attract me and repel me. Their rounded base or skirts remind me of those clown dolls that right themselves each time you knock them over. A work like this invites you to wander in among the figures, and people were doing so, making a sort of live sculpture as a result. More information on this work here. 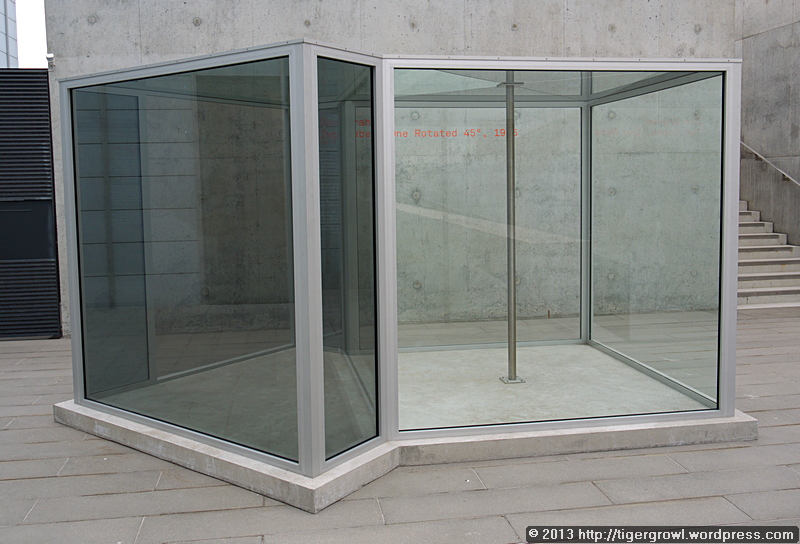 As we left the gallery, we came across this intriguing structure. What might it be: is it a bus shelter? A small conservatory? 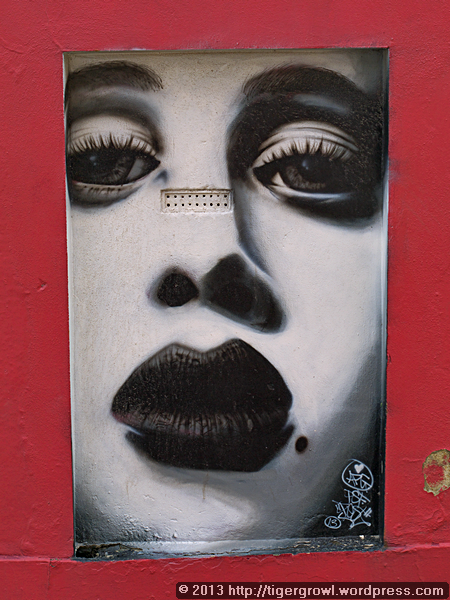 Or even a work of art? 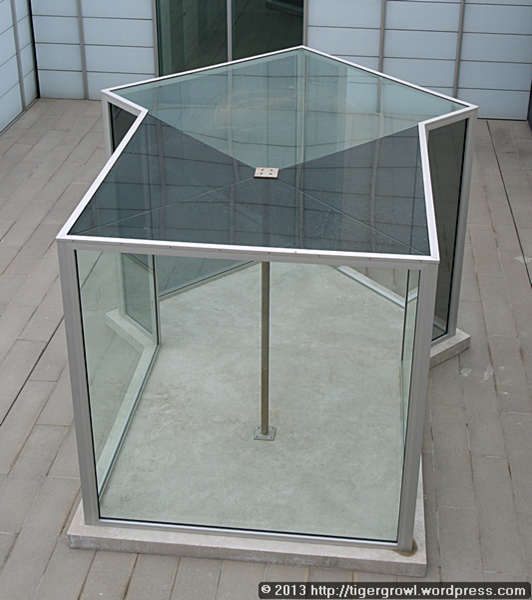 The structure has an opening and so you can easily enter. Here I am inside it. Looking down on it from a nearby terrace shows that its shape is perfectly symmetrical and that it is formed from two cubes. This suggests that it might be a work of art and that is the correct guess. 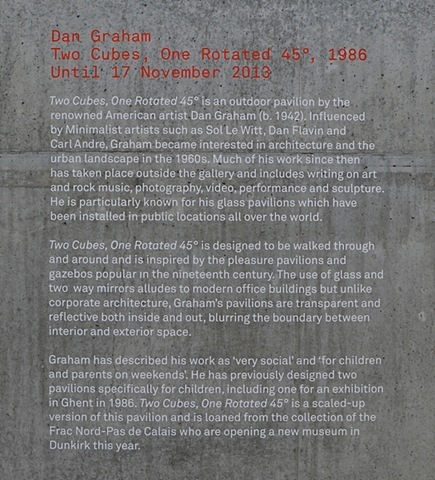 An inscription on the wall beside the structure tells us that it was made by Dan Graham and that it has a rather prosaic title: Two Cubes, One Rotated 45°, 1986. There is also a description of the work which you can see here. 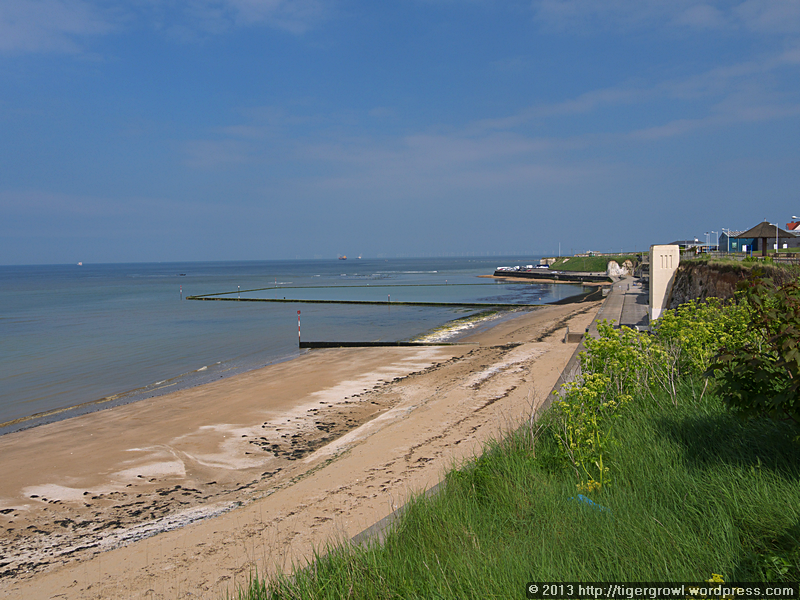 We set out to walk along the cliff top to Walpole Bay, through Cliftonville. 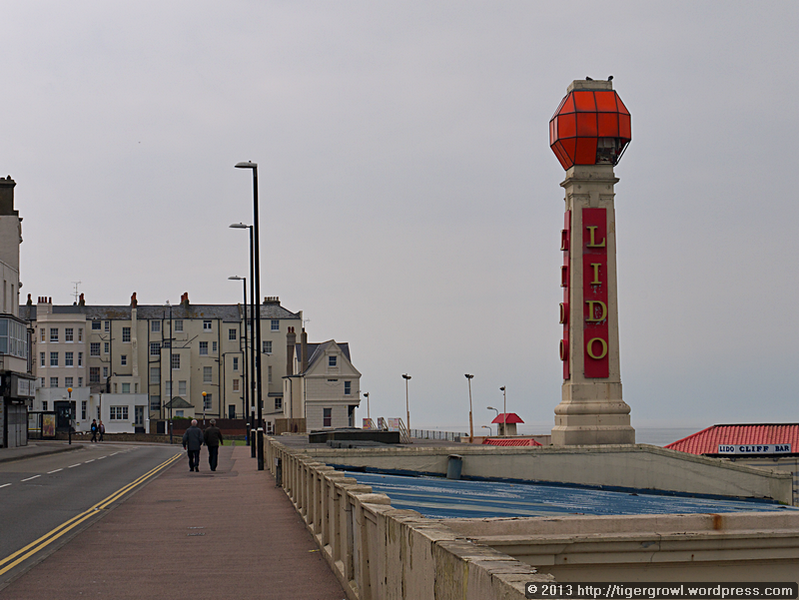 The picture shows the top of the now sad-looking Lido. This came into being in 1926 as a remodelling of the pre-existing Clifton Baths. Lidos – enclosed seawater bathing facilities with amenities such as cafes – were popular and this one remained successful into the 1960s. In 1978, however, the same storms that put paid to Margate’s pier also wrecked the Lido’s outdoor pool and did other substantial damage. The Lido was never repaired or rebuilt and now sits there derelict while redevelopment plans come and go. It is quite a pleasant walk along the cliff top on a fine and sunny day. You have views of the beach, the sea and sky, and the distant coastline. Again, though, I was surprised at how few people there were about. The beach was virtually deserted. Perhaps this is because of the relatively limited access to the shore from the cliff top and the lack of facilities demanded by day-trippers and sunbathers such as cafes, ice cream stalls and shops selling silly hats. 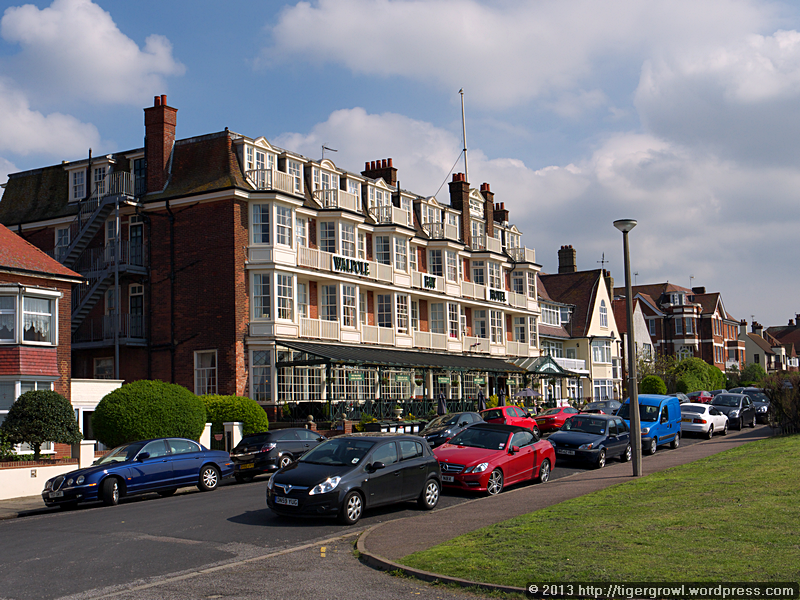 Enjoyable as the walk was, we had come for a purpose, namely to visit the Walpole Bay Hotel. On the outside it is fairly typical seaside hotel of its period (1914) and inside there is a feeling of time standing still. The first hint of this is the rather venerable lift that is an prominent feature of the entrance hall. The lift was installed in 1927 and, according to the hotel’s flyer, has worked perfectly ever since, except once when there was a failure caused, not by a mechanical fault but by (unspecified) “human error”. The flyer invites you to “take a ride to the top, up to the third floor, where, if you alight and look up, you can see the original workings in action”. 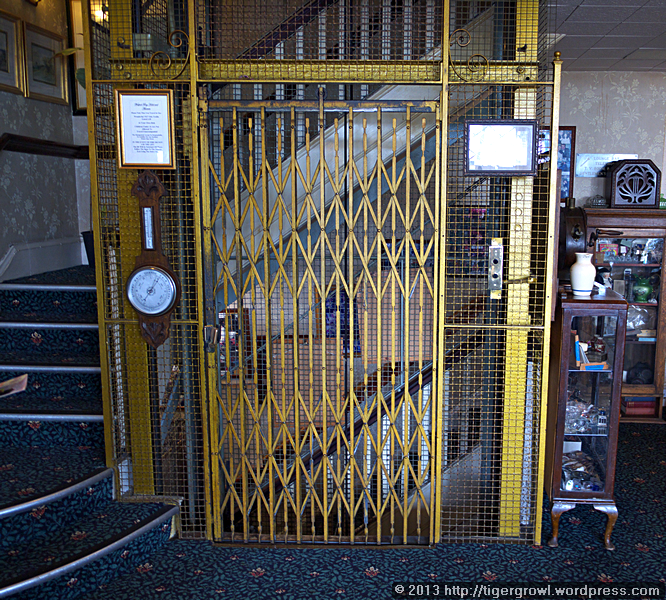 However, a notice on the lift itself (top left, above the barometer) tells a different story: “Please Note That You Travel In Our Wonderful Otis 1927 Trellis Gated Lift At Your Own Risk” and “The Management Accept No Responsibility Or Liability For Any Incident Which May Occur”. Well, would you take the lift in such circumstances? We preferred to walk up the stairs! The reason for our visit was that the hotel boasts a museum (referred to in somewhat grandiose terms as a “Living Museum” in the flyer) and we were curious to see it. 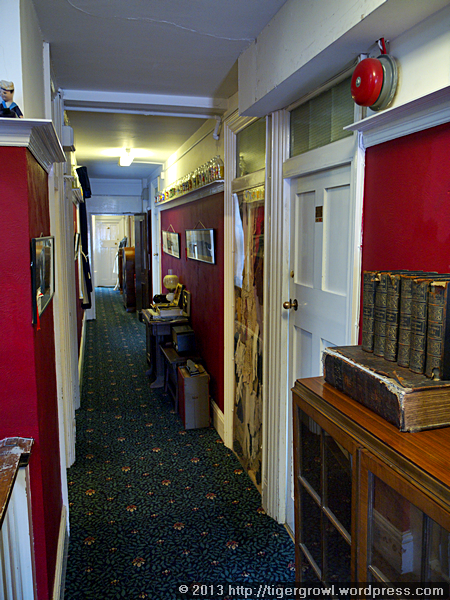 What with its ancient lift and a couple of remaining gas lamps in the reception area, we might even say that the hotel is a museum of sorts. There are exhibits everywhere: in cupboards and disused service rooms (including at least one toilet), in odd corners and in and on top of furniture in the corridors. a certain amount of clutter. It is this clutter and lack of order that is the most disconcerting aspect of the museum. Very little is labelled and it is therefore often difficult to know what you are looking at or what its relevance is to the hotel. (I suspect a lot of its has no relevance at all.) 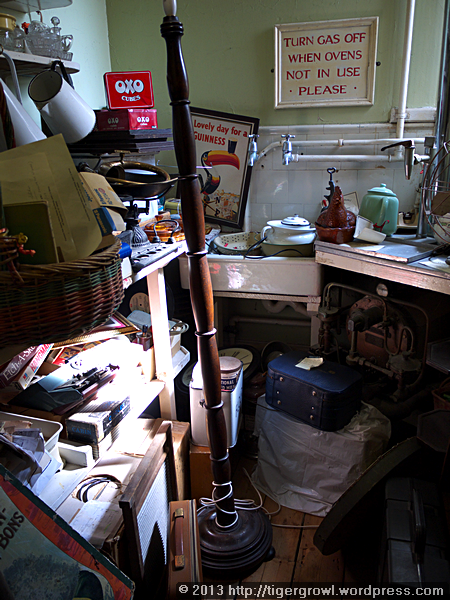 Objects tend to be gathered in groups of similar items but the result is more reminiscent of a jumble sale or a junk shop than a museum. One gains the impression that collecting more and more objects, and desperately stuffing them in here and there, takes precedence over organizing and explaining them. 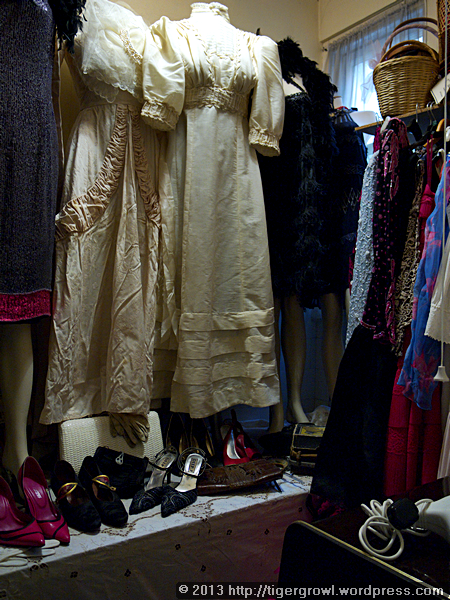 The collection needs to be taken in hand by a professional curator who will throw out the rubbish and arrange and label to rest to best effect. On that slightly disappointing note, we returned townwards and eventually caught a train back to London. It had been a good day out nonetheless and Margate had succeeded once again in combining the charm of the familiar with spice of novelty. Today’s jaunt is taking us first to Portsmouth to meet a friend, and then to the Isle of Wight where we hope to visit Osborne House, the “country retreat” of Queen Victoria and her family. The best way to make this trip is to buy a combined train and hovercraft ticket. 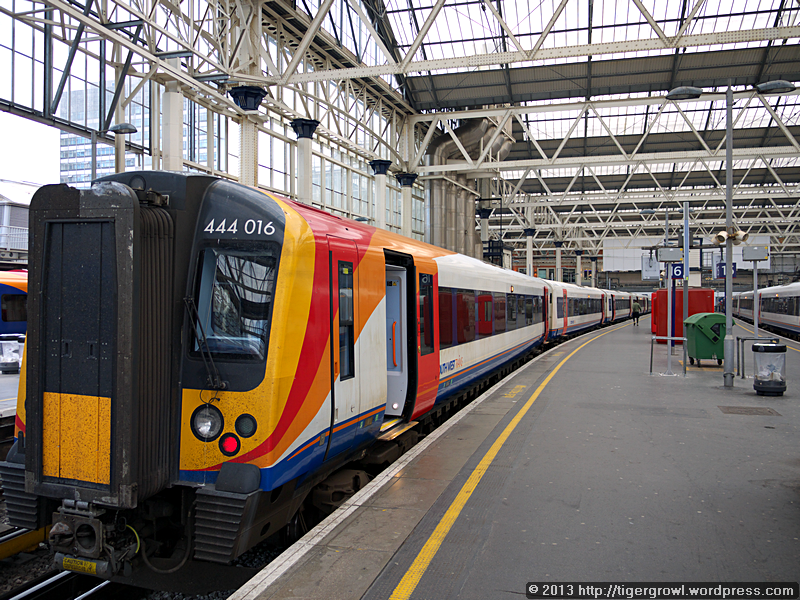 A South West Trains service takes you from Waterloo to Portsmouth Harbour where you can take a bus – or walk – to the hovercraft terminal. Your combined ticket provides a two-way journey on the hovercraft though you are asked to nominate a specific return flight. At Portsmouth Harbour we just had time to take a quick photo of HMS Warrior before hurrying on the the hovercraft terminal. 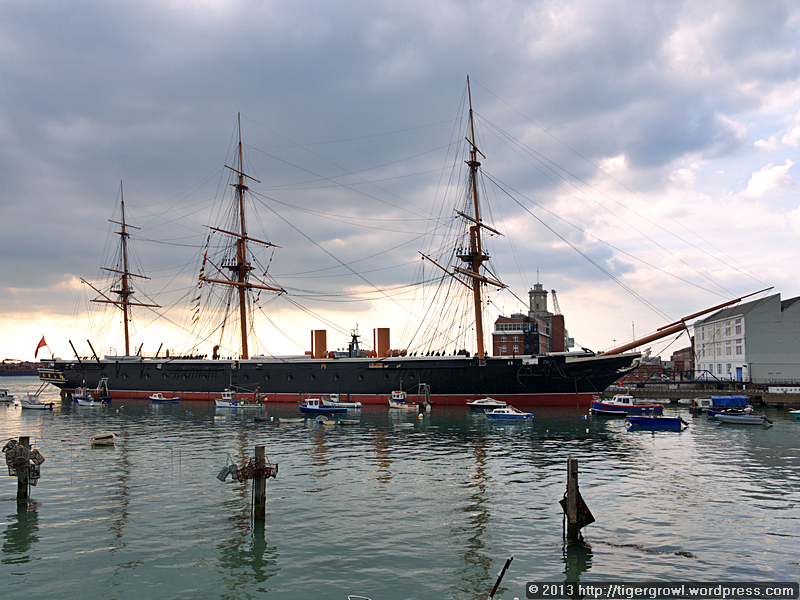 This ship, built between 1859 and 1861, was the first iron-hulled and armour-plated warship. Today it is a museum ship and is certainly worth a visit though I would recommend you visit Nelson’s ship, HMS Victory, first in order to appreciate how much had changed in warship design and how much remained essentially the same. Unfortunately, the weather had closed in, making for dark and miserable conditions with poor visibility. 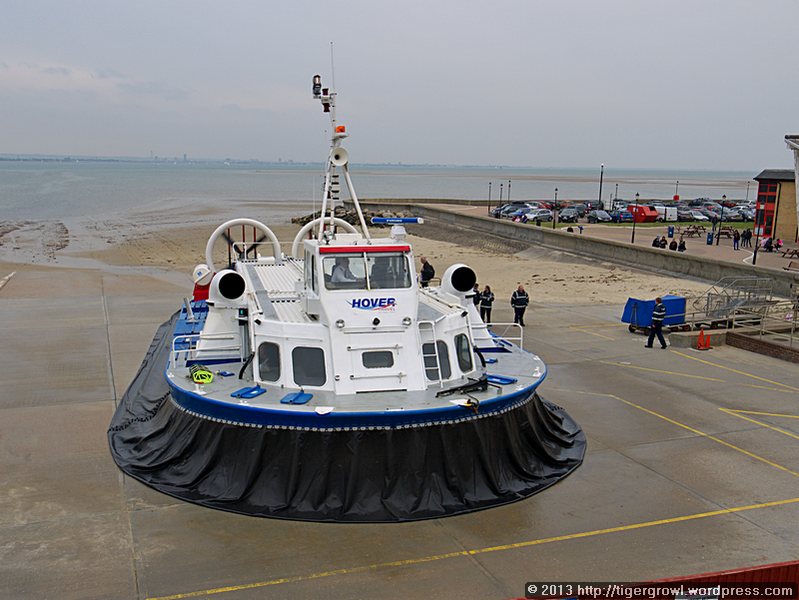 Hovertravel claims to be “the only commercial hovercraft service in Europe”. They might have said “The last commercial hovercraft service…” because the heyday of this particular mode of transport has passed. Some of us remember when it was an adventure to cross the Channel by hovercraft, taking only 45 minutes instead of the hour and a half it took by conventional ferry. 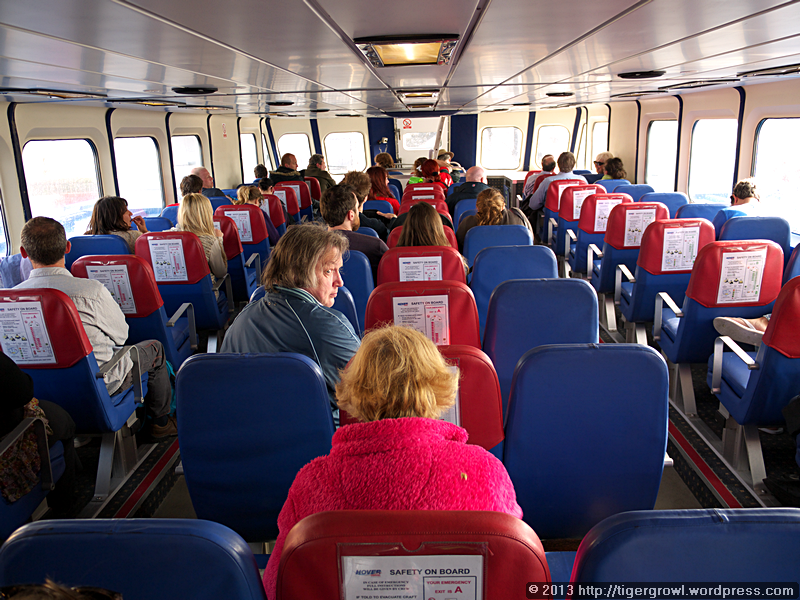 We also remember the green-faced passengers staggering ashore after a choppy crossing…! The cross-Channel hovercraft service ended in the year 2000 because of competition from the Channel Tunnel, and elsewhere hovercraft have been replaced by other means of transport, such as the hydrofoil. The hovercraft service from Portsmouth to Ryde seems still to be going strong, however, and as the crossing takes only about 10 minutes on a calm day, it’s hard to see how any other vehicle could do any better. We had a while to wait for a bus to take us on the next stage of the journey. We Londoners, used to frequent round-the-clock bus services, are apt to get a shock when we go elsewhere and find a much skimpier service in operation. That’s especially true on a miserable day like today when even a 30-minute wait can seem interminable. I took very few photos despite having plenty of time. 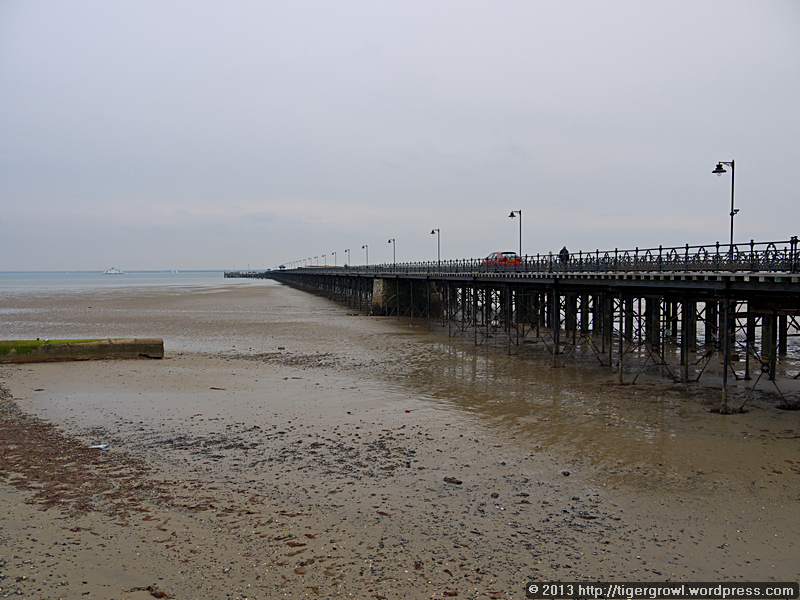 The one above shows Ryde Pier which is a terminal for the ferries. It first opened in 1814 and was subsequently modified and enlarged several times during the 19th century. A tram pier was added alongside the original one. After repairs and refurbishment, it is still in use, nearly 200 years later. Ryde, or at least the part of it where we were stuck waiting for the bus, did not impress me and I took few photos. I’d better say no more than that because it was probably the weather and my mood rather than Ryde itself than sapped my enthusiasm. 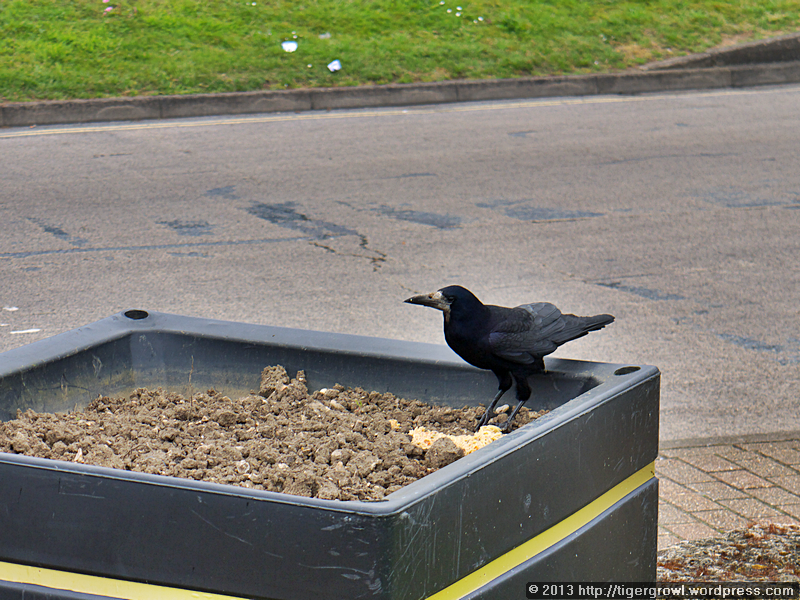 Instead, I concentrated on photographing this crow who had found the remains of a take-away meal and was tucking in with gusto. I was able to get quite close to him. As you know, I am rather fond of crows and admire their intelligence. 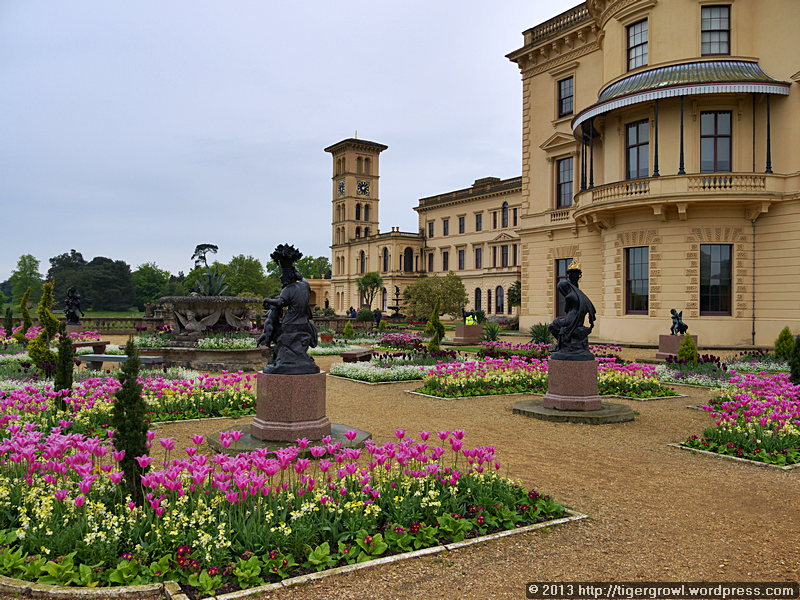 The bus dropped us off near the gate to Osborne House. 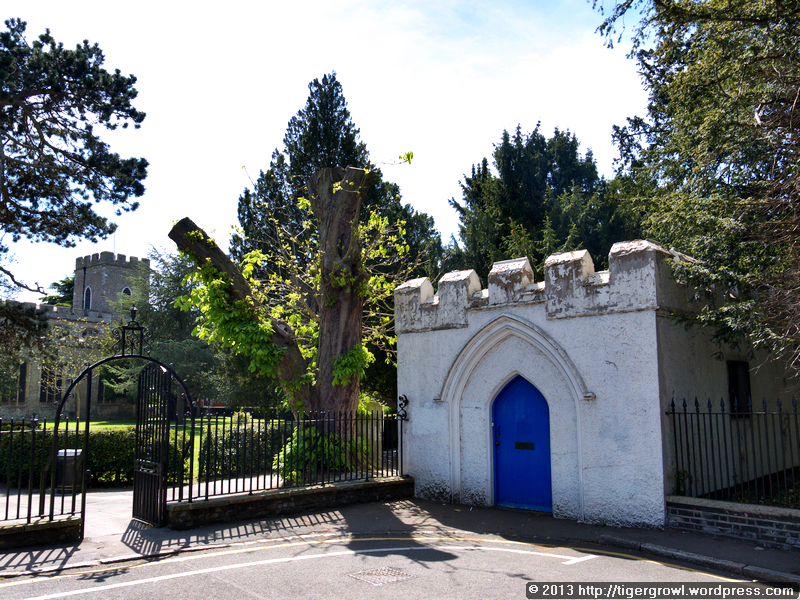 Considering that this property was, after all, a Royal residence, the gate is quite understated. Beside it is a rather fine lodge which I for one would be quite happy to live in! 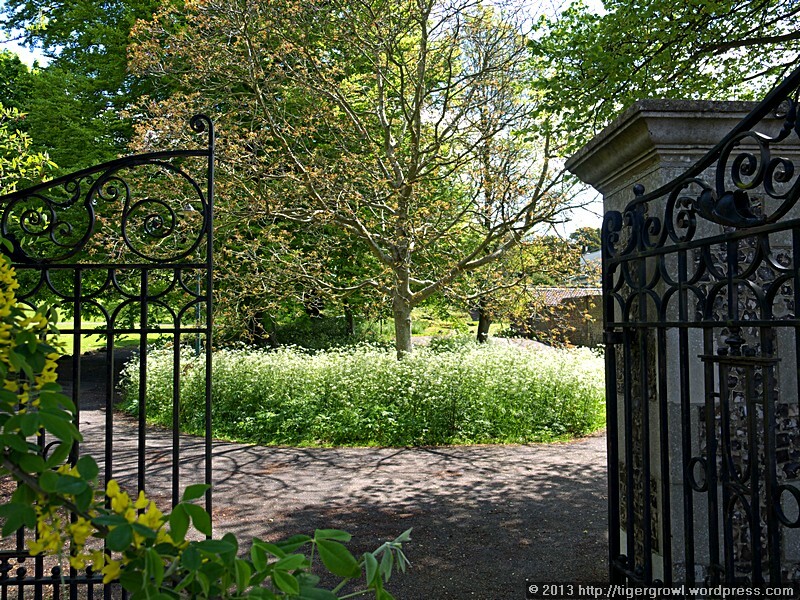 The gateway, however, is only the start of the journey to the house. It is quite a walk to the house, or so it seems on a wet day. You glimpse various buildings on the way though none are open to visit. I assume they housed offices for the running of the estate though some are of substantial size. 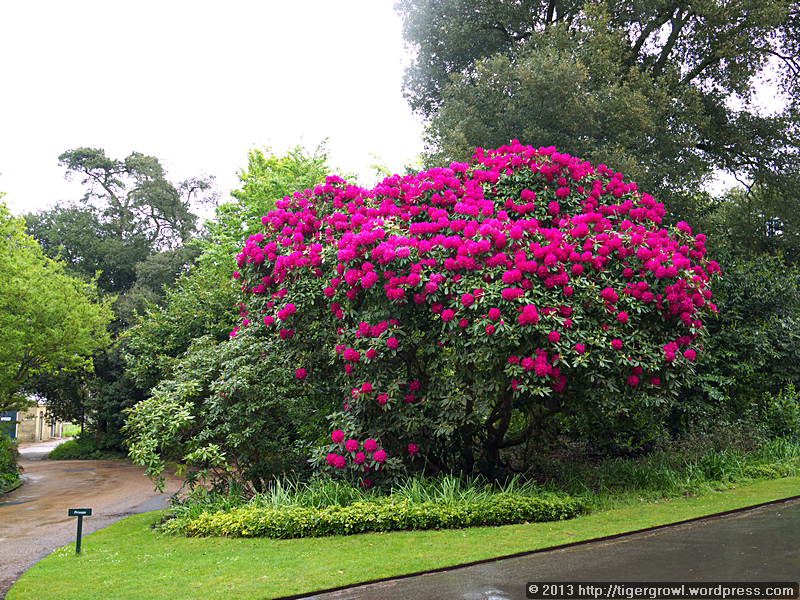 Fortunately, there is landscaping and gardens with colourful flowers to admire on the way. 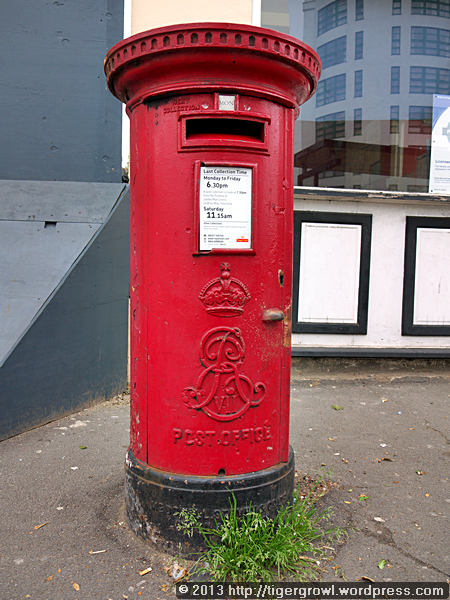 I spotted this pillar box near the visitor centre and, yes, its Royal cipher is that of Queen Victoria, though I doubt whether that lady ever posted any letters here. 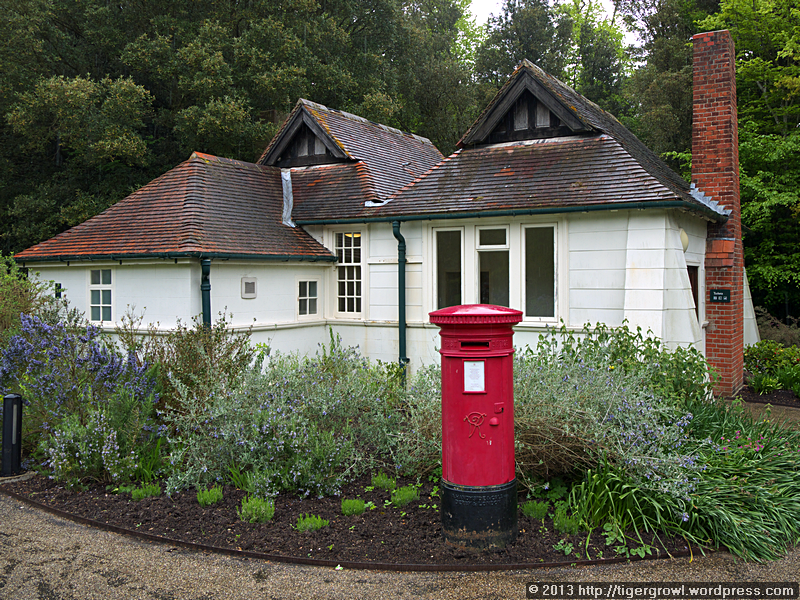 I would guess that it was brought here in modern times for tourists to send their postcards. Top marks, though, to whoever thought of installing a genuine Victorian one here. 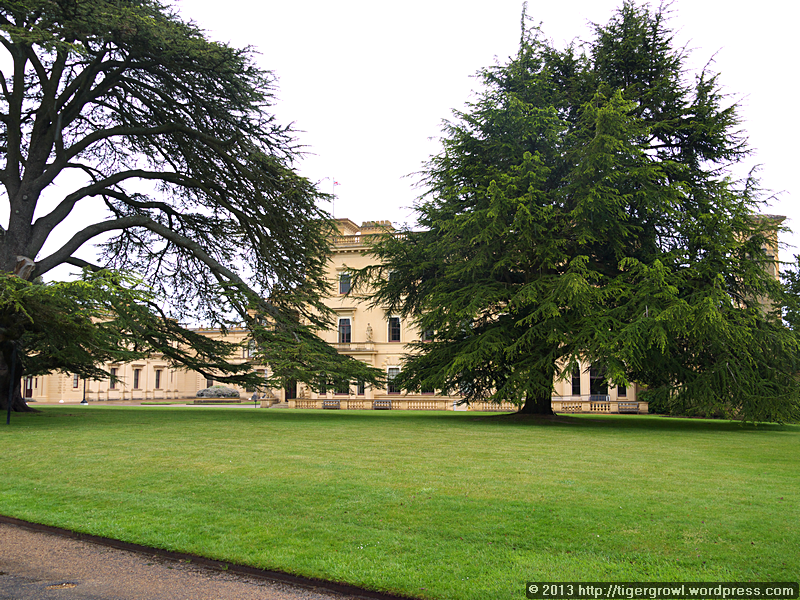 After a trudge through the wet, we were glad to glimpse Osborne House through the trees at last. When I saw it, I was in for something of a surprise. I remember reading how much Victoria loved the Isle of Wight and her retreat there. Somewhere she writes about how nice it would be to live here “as an ordinary person”. This had led me (admittedly without good evidence) to form a mind’s-eye picture of Osborne House as a relatively small property, not exactly a cottage, but perhaps more what you might call a bijou mansion. 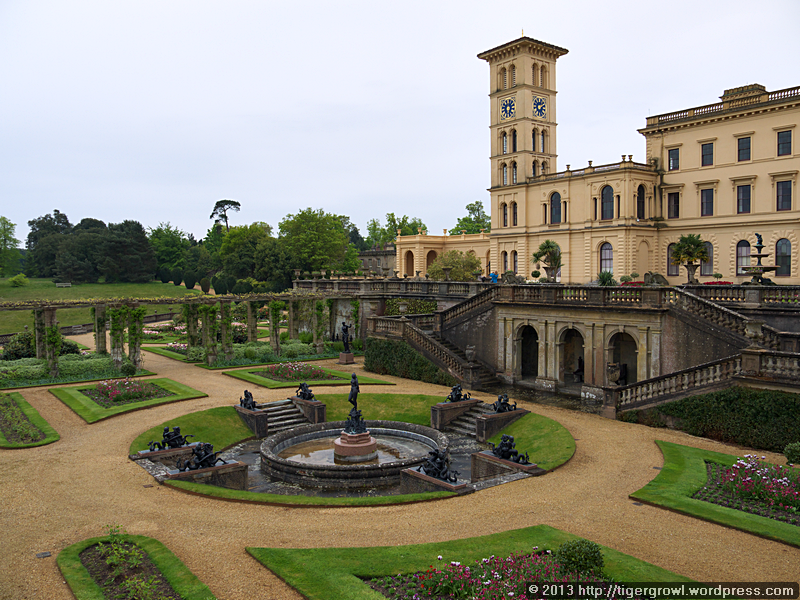 I was quite wrong about that: Osborne House is huge. Not many people below the rank of Royalty could think of financing a house and estate on this scale. So much for dreaming of living like “an ordinary person”. The house is far too big to include all of it in one photo from our position. You would need to roam around the grounds looking for a good angle, something we couldn’t do because of the weather and the time restrictions (we were booked onto the 6:15 hovercraft crossing). I can only give an impression of it. Unfortunately, photography is not allowed inside the house, so I cannot show you anything of it. Built between 1845 and 1851, Osborne was designed by Prince Albert himself. Queen Victoria died here in January 1901 and after this the house ceased to be a Royal residence and was given to the nation. Some rooms, however, were kept private as a museum accessible only to members of the Royal family and the gates closing off that section of the house are still in place though the rooms are now open to the public. The house is furnished to give an impression of what it was like when Victoria and Albert occupied it with their children. 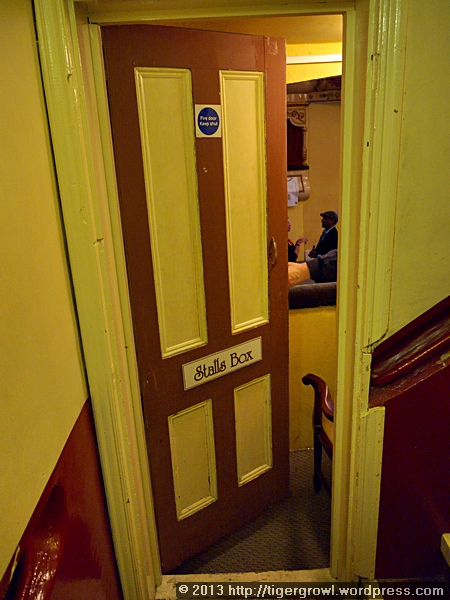 Visitors enter by a small door to one side. 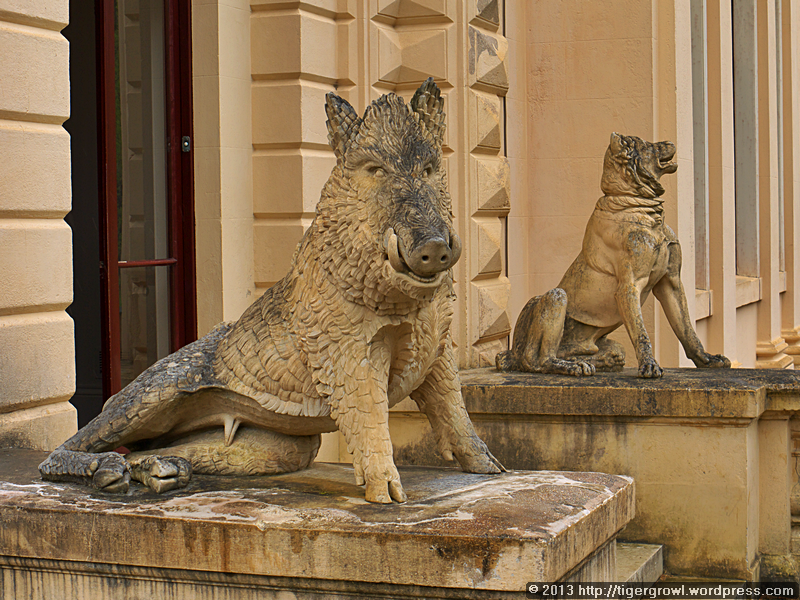 It is flanked by a pair of animal sculptures, a dog and a wild boar. They are both very detailed and I especially liked the boar who looks very friendly and cheerful despite his fearsome tusks. 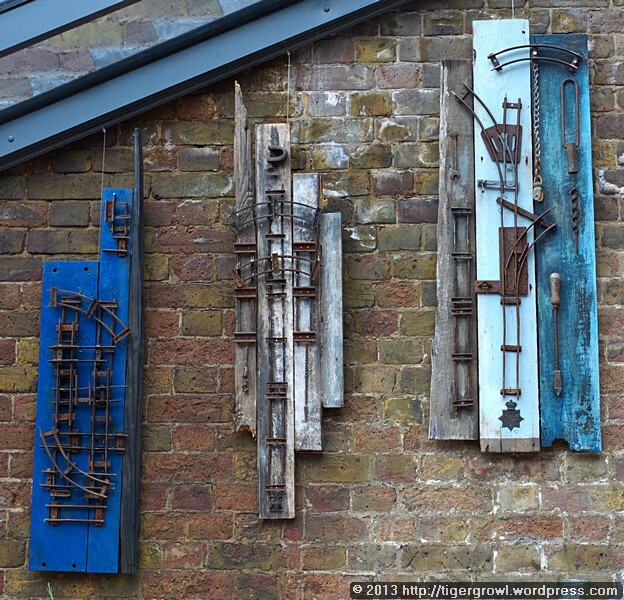 …with architectural elements. 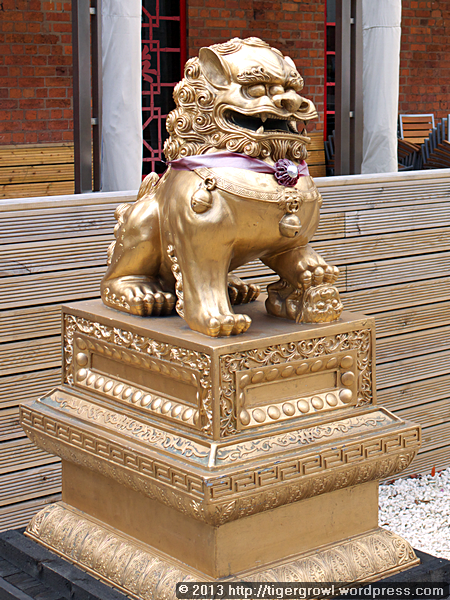 Statuary abounds, mostly of human figures – often with a mythological theme – but occasional animals also appear. Note the Italianate tower which helps establish the style of the building. 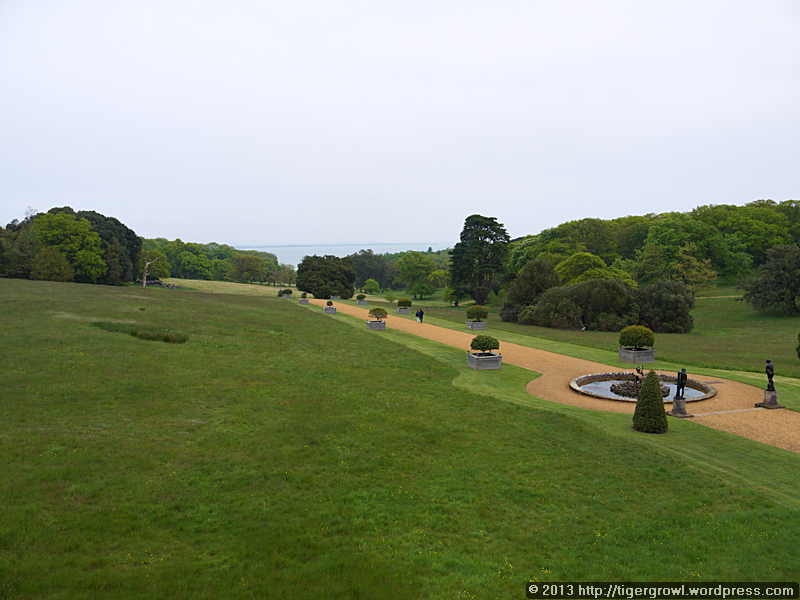 Beyond the formal gardens stretches a broad expanse of parkland. 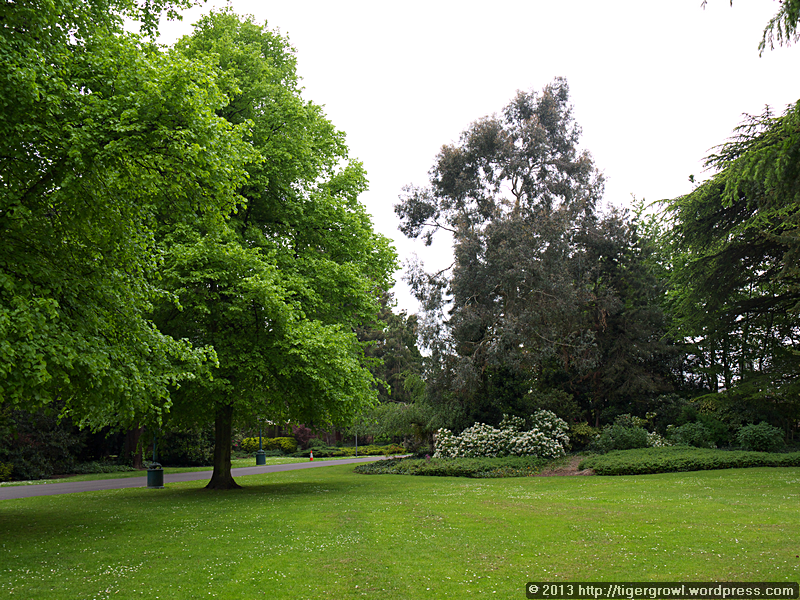 Here one could stroll, ride, picnic, sketch and paint and engage in every sort of outdoor activity. In the distance the sea glitters (or no doubt does when the sun shines!). 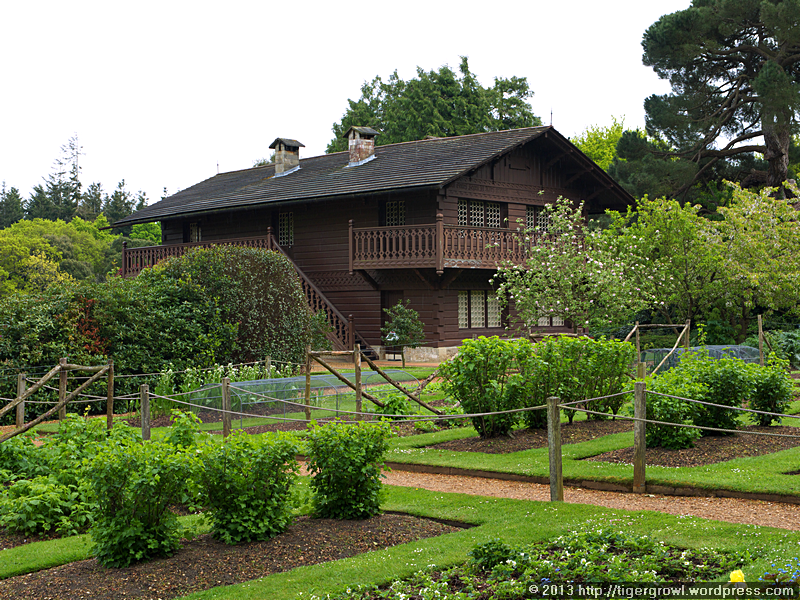 The Swiss Cottage was built for the children of Queen Victoria and Prince Albert in 1853-54. The building followed the form of a traditional Swiss alpine farmhouse and was designed to play a central role in the recreation and education of the children. Here they learned about housekeeping and cookery, entertained their parents and established a museum for their collections of shells, minerals, butterflies and flowers. 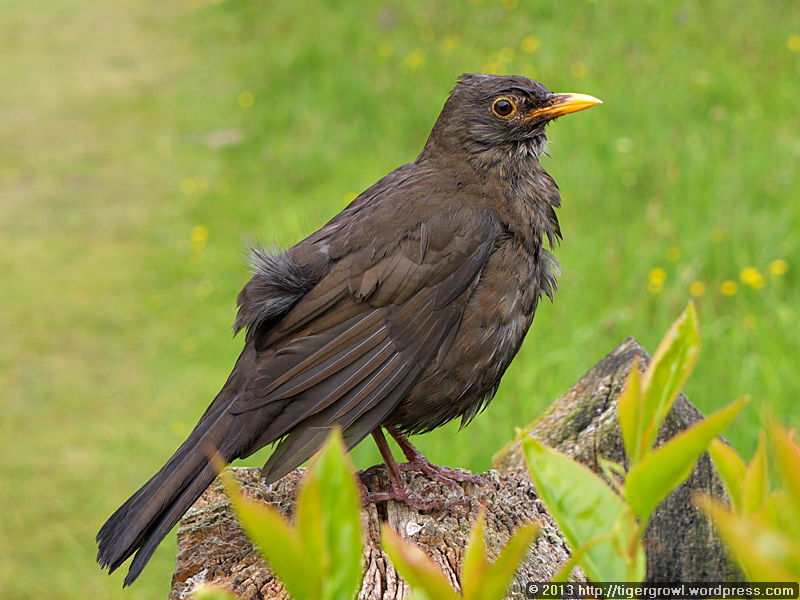 Unfortunately, photography is not permitted inside the cottage but this slightly scruffy bird was happy to offer a photo opportunity. A second wooden building was established in 1862. 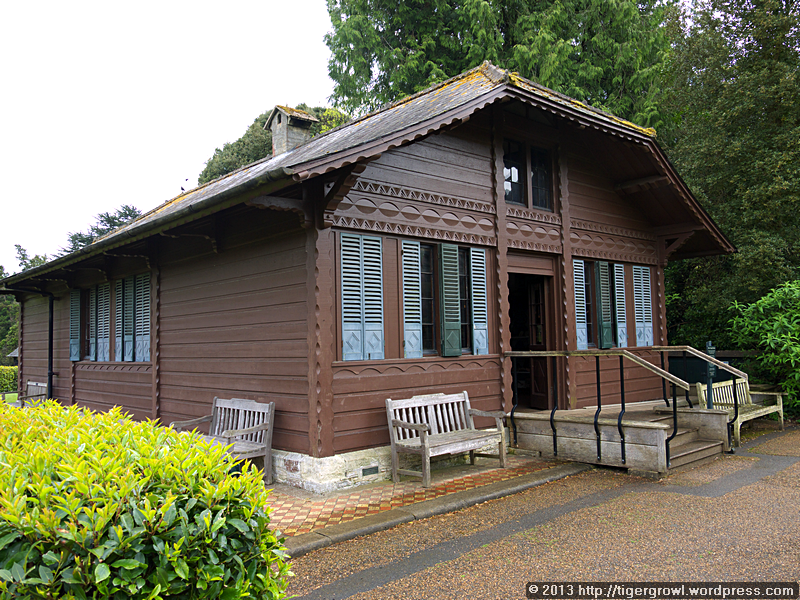 It is the Swiss Cottage Museum which was needed to house the children’s collections when these outgrew the Swiss Cottage. The collections as they stand are not original. 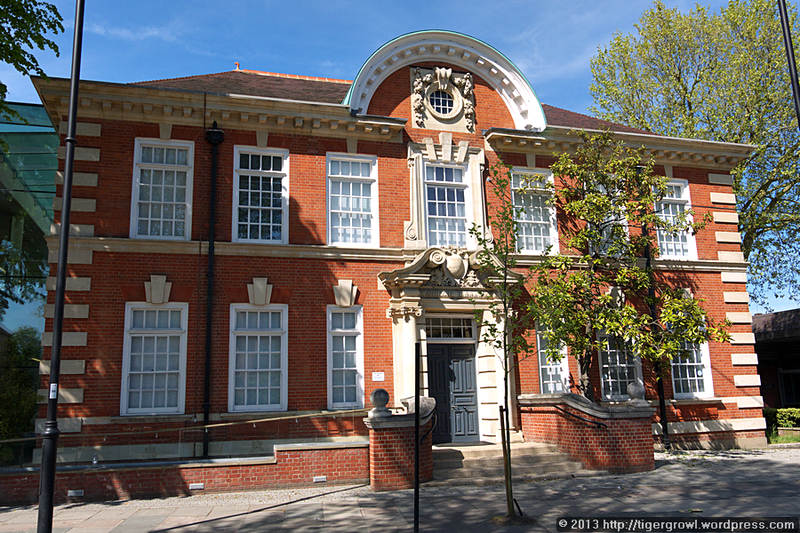 The museum was arranged in 1916 by Guy Laking, keeper of the London Museum. We caught a bus back to Ryde and walked down hilly Union Street. 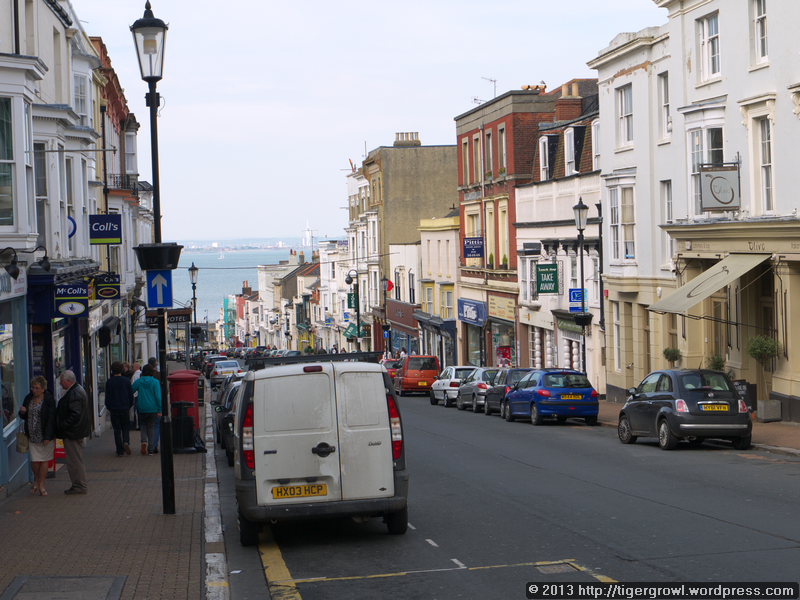 We didn’t have a lot of time left so could not explore Ryde, or even Union Street, thoroughly. We did find one interesting place, though. This pretty building, which is Grade II listed, was built in 1835-36 and named after the then Princess Victoria, whose coat of arms tops the façade. The iron gates were closed but not locked. Perhaps the cleaners were at work inside. We decided to risk going in. We visited the interior without seeing anyone. 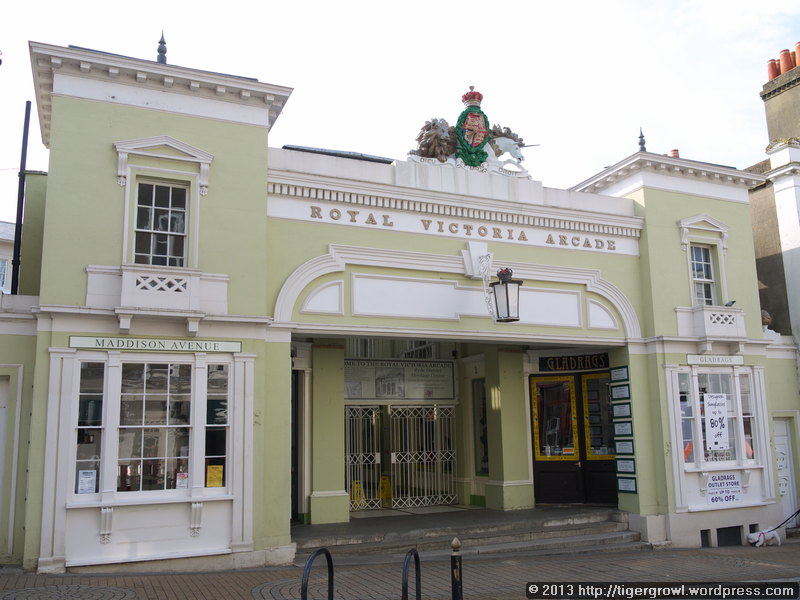 The arcade provided accommodation for 14 shops and I assume that the same number are still present today. 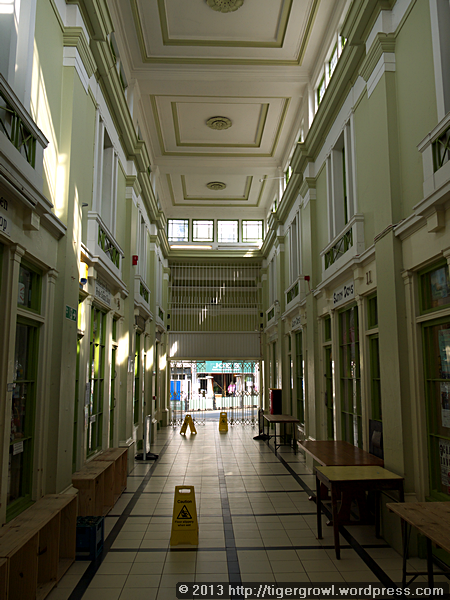 As the arcade was closed, it was difficult to know what it would be like when open and operating. I imagine it then presents quite a lively scene. 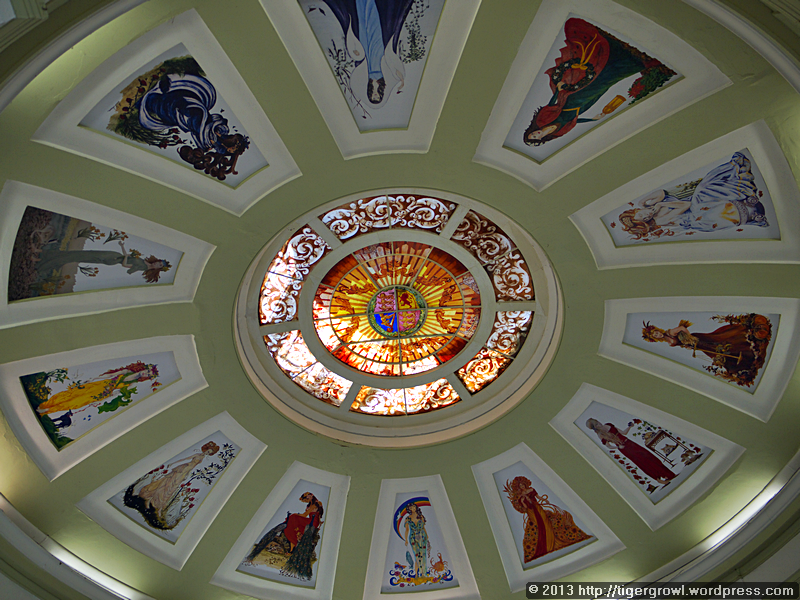 The interior is decorated with paintings and stained glass and the centrepiece is perhaps this splendid domed ceiling with a circle of painted pictures surrounding a stained glass skylight. 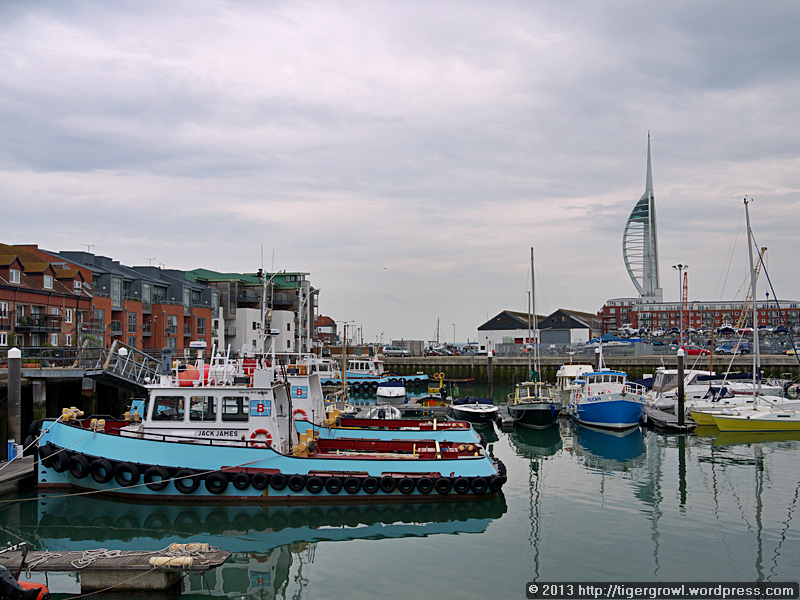 After a quick pub meal, we made our way down to the seafront and the hovercraft terminal. The crossing was uneventful and at Portsmouth Harbour station we were able to catch a train to St Pancras (fortunately, our tickets were endorsed “London Terminals” and not just Waterloo). It had been a busy day and I was happy to rest during the train ride. 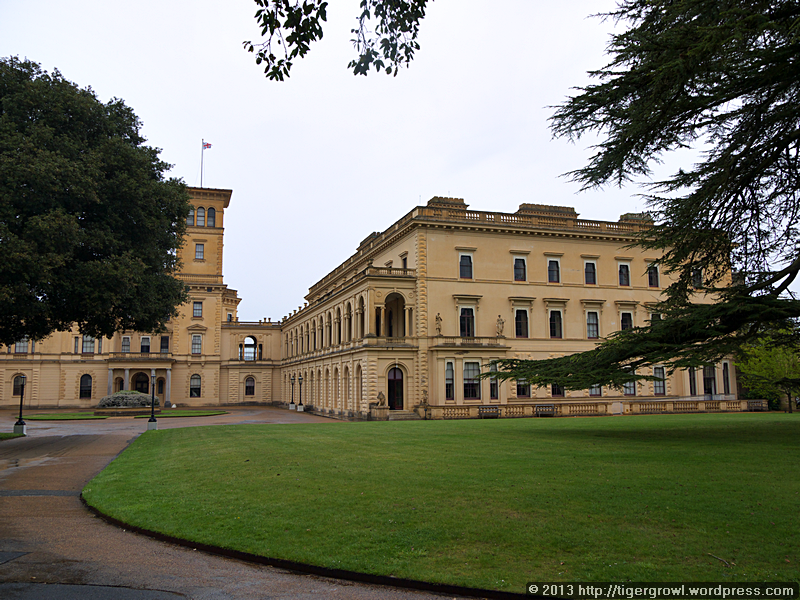 I am glad to have seen Osborne House, having read so much about it and of Queen Victoria’s love of the house and the island, but I doubt whether I shall feel the desire to return. It is a Royal residence but not particularly beautiful or interesting and for me one visit is enough. 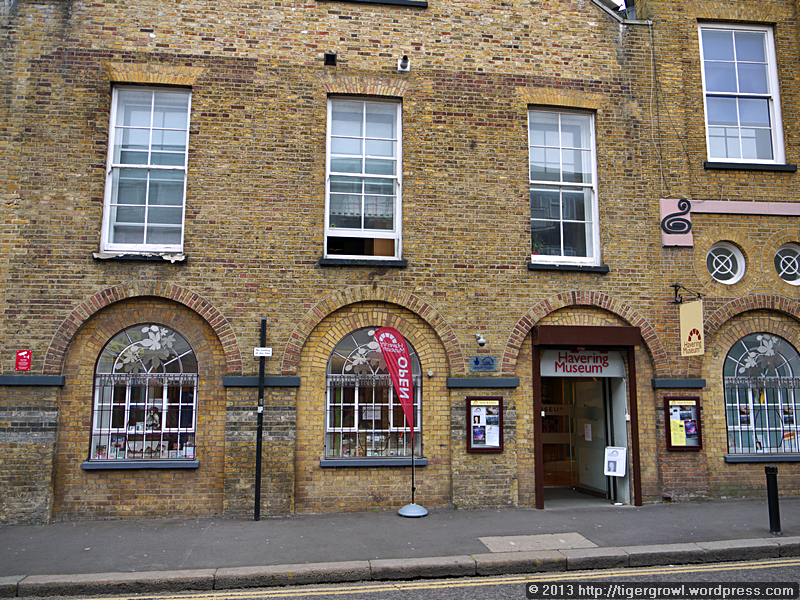 Today we had arranged to meet friends for a visit to the Musical Museum at Kew Bridge in Brentford. We were to meet at Waterloo station in the Costa coffee bar there. The Costa chain was started in 1971 by two Italian brothers. Though it is today owned by the Whitbread restaurant and hotel company, it retains its unique character and has a strong following. 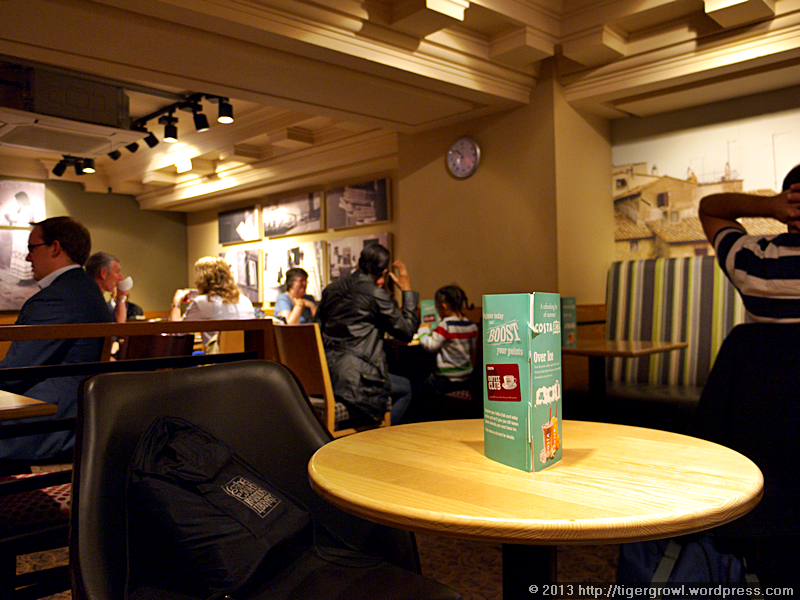 The beige and brown decor may not be exciting but it is restful and the atmosphere is relaxed. The counter-service or “queue-and-sit” model is now standard for coffee houses and is used by our other favourite, Caffè Nero. 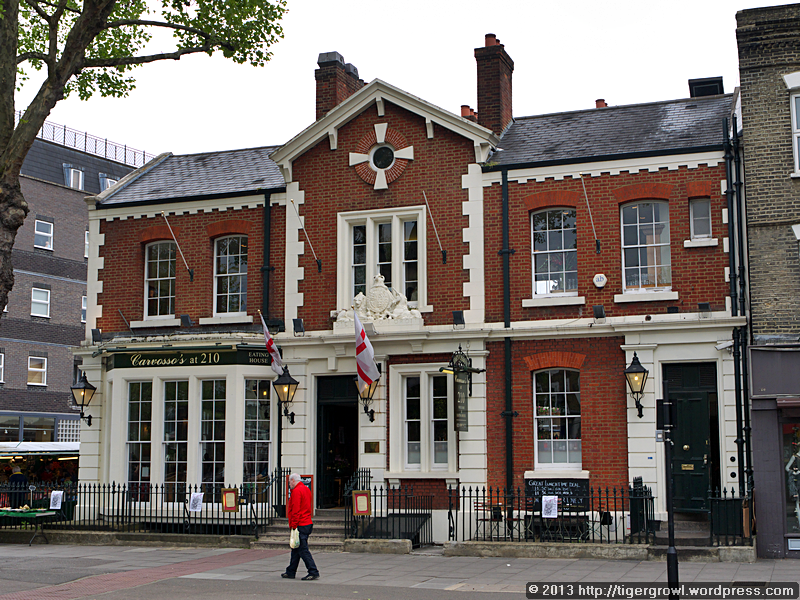 We took the train from Waterloo to Kew Bridge in Richmond (for map, see here), and walked along the High Street which runs just north of the Thames. Near the station we snapped this pillar box. The Royal cipher is that of King Edward VII and while posting boxes with his cipher are not rare, there are relatively few of them because this monarch’s reign was short, lasting from 1901 to 1910. I always feel rather sorry for Edward, who was actually named Albert after his father. The son of Queen Victoria and the Prince Consort, “Bertie” was continually the target of his parents’ disapproval, especially after he had an affair with an actress, a circumstance considered by them to be a heinous fall from grace. Worse still, Victoria blamed Albert’s death on her son, alleging that the stress caused by his bad behaviour rendered fatal the illness from which his father might otherwise have recovered. A notable feature of the environment here is an Italianate style water tower. 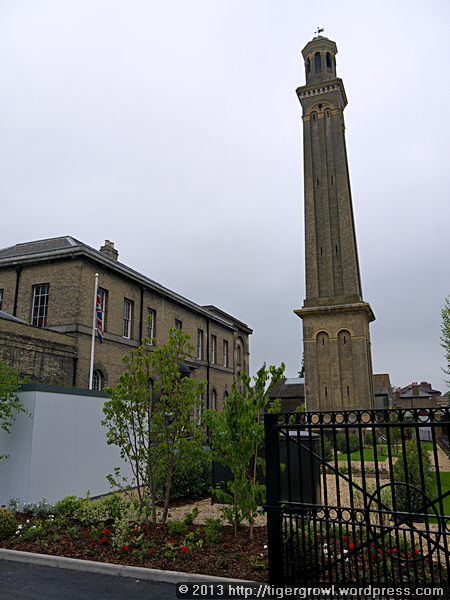 Built in 1867 and and measuring 60 metres tall, it is a stand-pipe tower used to equalize pressure in the water mains when the buildings to which it belonged formed the Kew Bridge Pumping Station. 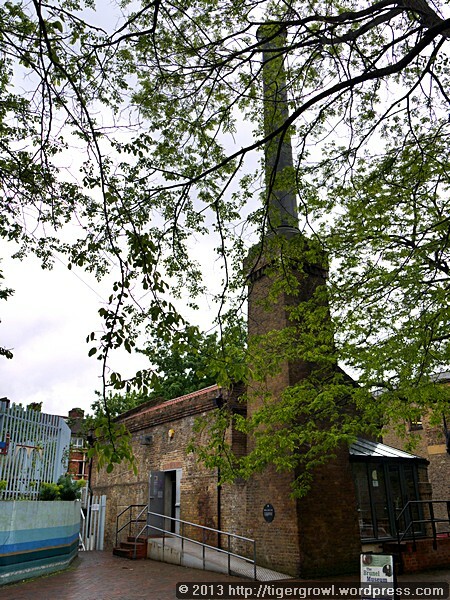 No longer used as part of London’s water supply, the site is now the Kew Bridge Steam Museum, which we hope to visit one of these days. We reached the Musical Museum and found it… closed! Yes, they close on Mondays and we should have checked before setting out. When will we ever learn? Visit not cancelled; merely postponed. 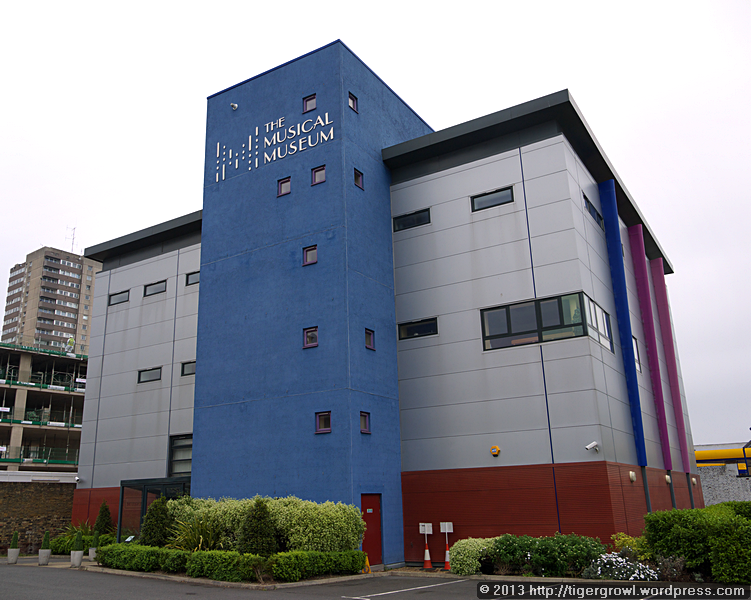 You can read about our previous visit to this interesting institution in The Musical Museum. 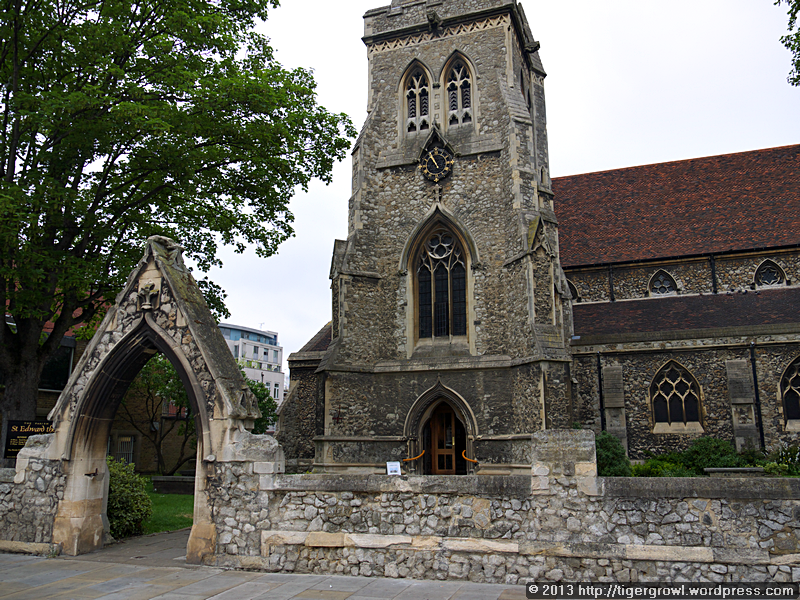 We walked to the bus stop beside St George’s Church. Built in the 18th century, this was the original home of the Musical Library until 2006, having been declared redundant as a church in 1958. 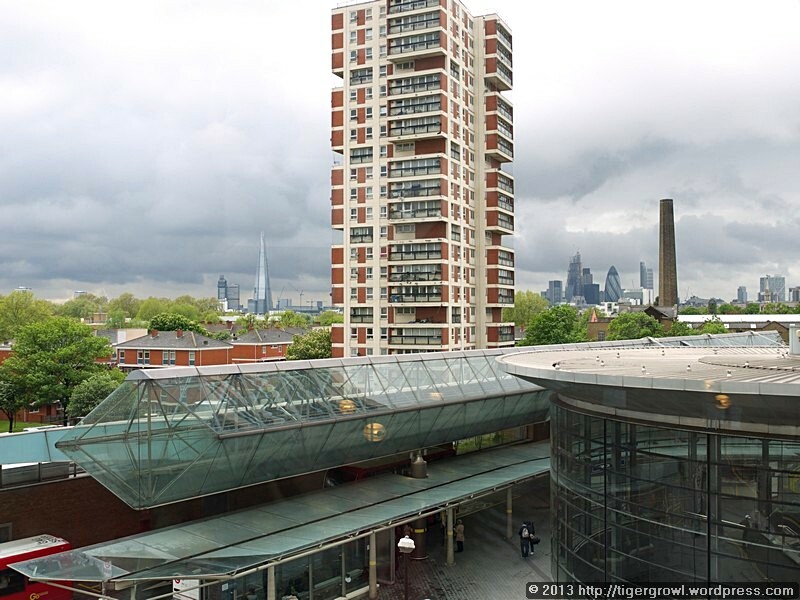 There are plans to demolish St George’s and replace it with a block of flats. 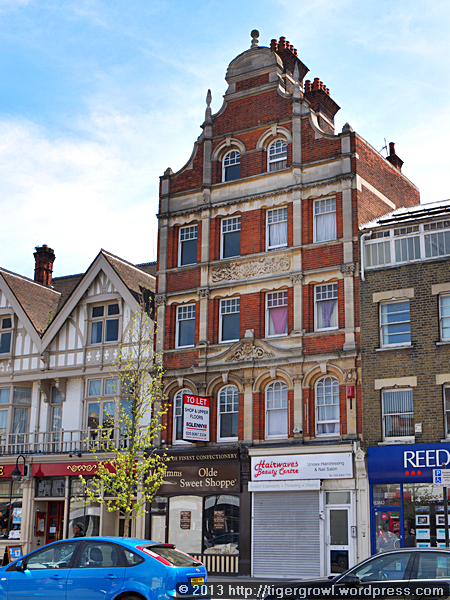 Groups including the local Victorian Society are campaigning to save it. The question, as always, is what can be done to preserve it and put it to good use if the campaign is to succeed. We await the result with interest. 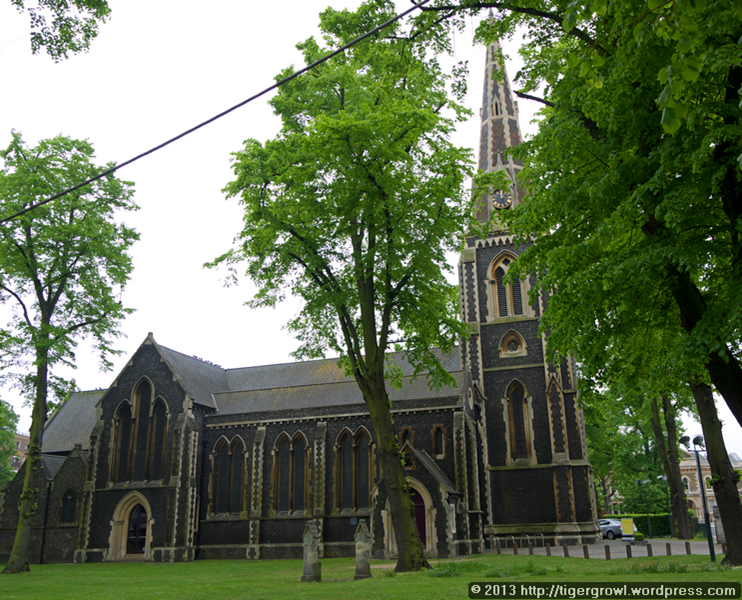 The bus carried us from a defunct 18th-century church to an active Victorian one, Christ Church Turnham Green. We didn’t visit the church, though, or spend much time in the area as we were heading for a park and an elegant old house. 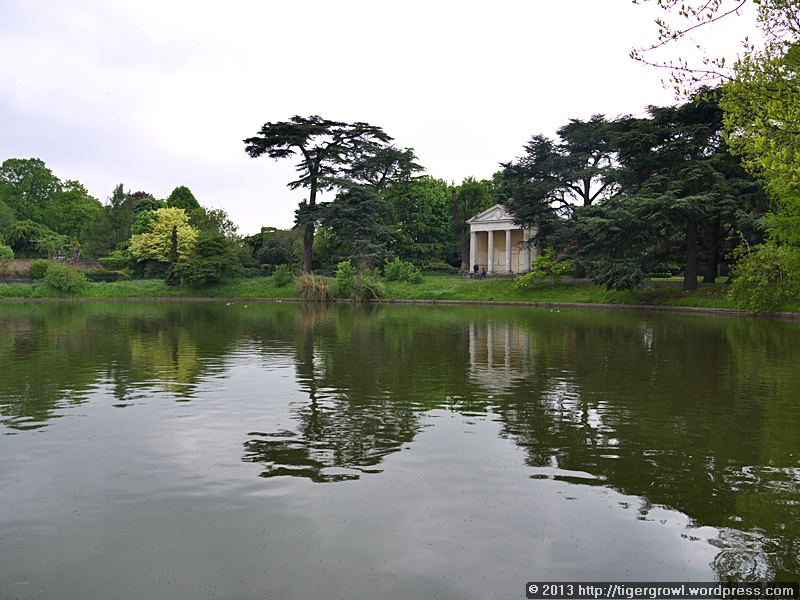 The elegant house is Gunnersbury Park House set in grounds that today form the park of the same name. This is thought to derive from that of King Cnut’s daughter Gunhilda who once lived hereabouts. In the 18th century, another daughter, George II’s daughter Amelia, had a fine house here in which she entertained the celebrities of her day, including members of the Royal families of Britain and Europe. 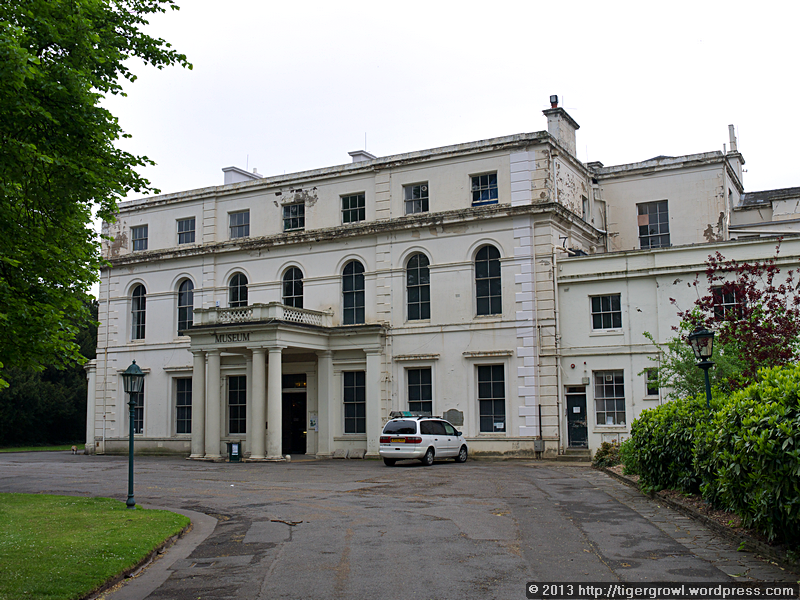 Amelia’s house was demolished in 1800 and replaced by two mansions, a larger called Gunnersbury Park House and a smaller called Gunnersbury House. In 1835 the Rothschild family bought the larger mansion and made it their home until 1925 when it was sold to the local councils, Hounslow and Ealing. The park has been developed with sports pitches, picnic areas and children’s playgrounds, while the house has become a museum of local history. The Rothschilds and their time in the house of course form part of this history. Today we can only imagine what the grounds of the house would have been like in their heyday. They make a beautiful park with public amenities today and are enlivened by the presence of two bodies of water, the Round Pond and the Potomac Lake, respectively. Similarly with the house, in order to gain an impression of its glory as a family home, we need to use our imagination. The house has suffered, both in terms of the wear and tear of time and in terms of being converted into a museum. Photography is allowed but the low light levels sometimes make this difficult. The foregoing remarks are not intended as criticism: the management have to run the house as a museum and are doing a creditable job (though it is obvious that money needs to be found to repair the ravages of time) and the low illumination is necessary to protect fragile objects from light damage and the fading of colours. 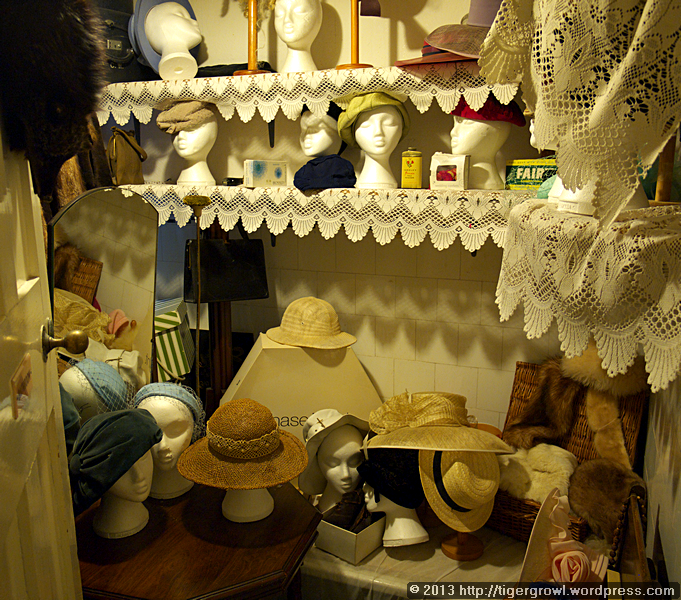 The museum contains various kinds of exhibits and I think there are two main categories. Firstly, are those to do with the history of the area, both industrial and social. 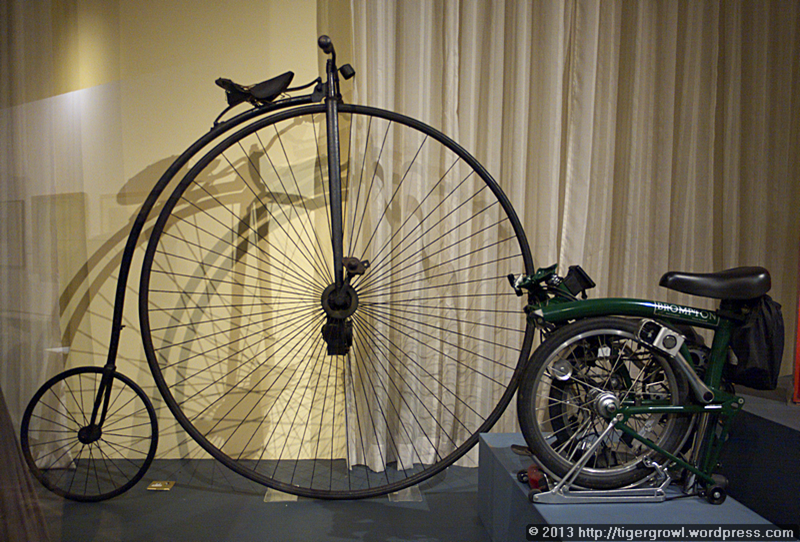 As an example, this exhibit shows a penny-farthing bicycle from the 1880s together with a photo of one of its owners, Albert Dallory, taken in 1884, and a modern folding bicycle that was designed locally and manufactured by Brompton Bicycle Ltd of Brentford. Secondly, there are displays relating to the house and the life of the Rothschild family over the 90 years of its occupancy. Like all big houses of the time, a staff of servants was employed to clean and run the house. 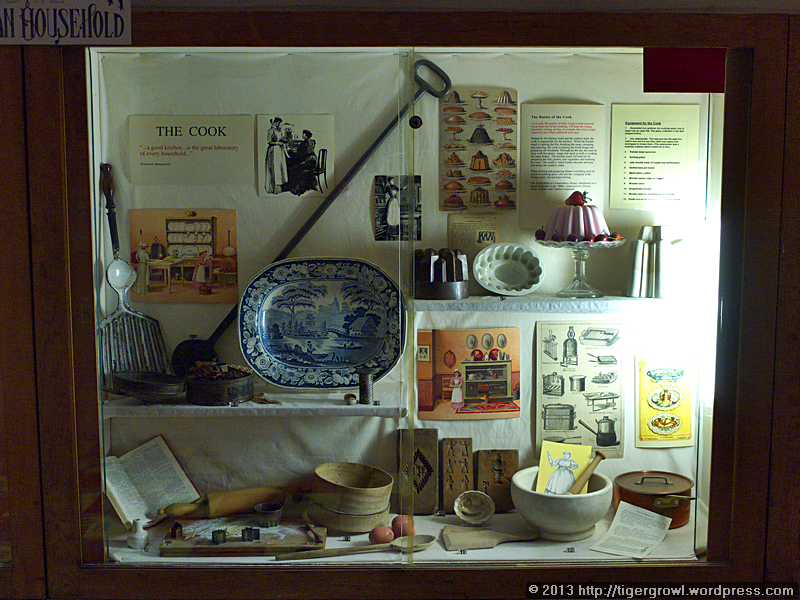 Displays show us the typical tools and implements that were used. This one illustrates the work of the cook, one of the three most important members of staff (butler, housekeeper and cook), with authority over the lower ranks of servants such as the scullery maids. Interesting as these displays were, I was more interested in the house itself and tried to see past the exhibits to gain an impressions of the rooms and how they fitted together to make a home. It both excited and saddened me because the house, as a house, felt partially eclipsed by its present state. 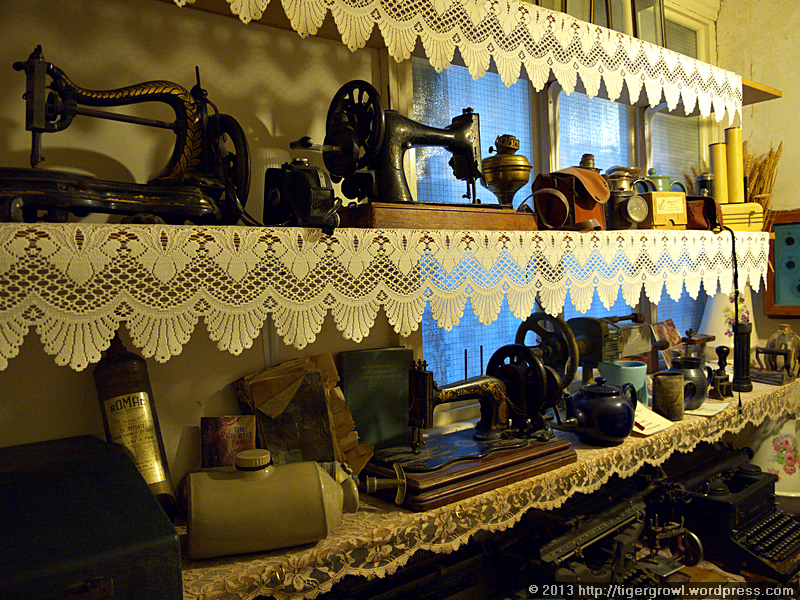 Though the museum is actively curated, the house itself exudes a feeling of neglect. 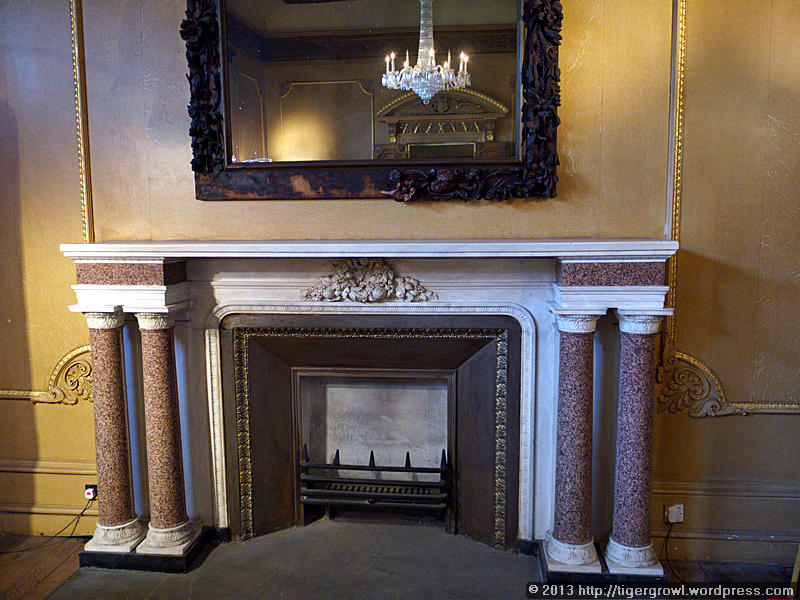 The fireplace, with a mirror above it that reflects the chandelier, is made from several different types of stone. I can imagine people gathering around it to warm themselves on a cold day. The decor now only hints at the rich furnishings that once graced these rooms. 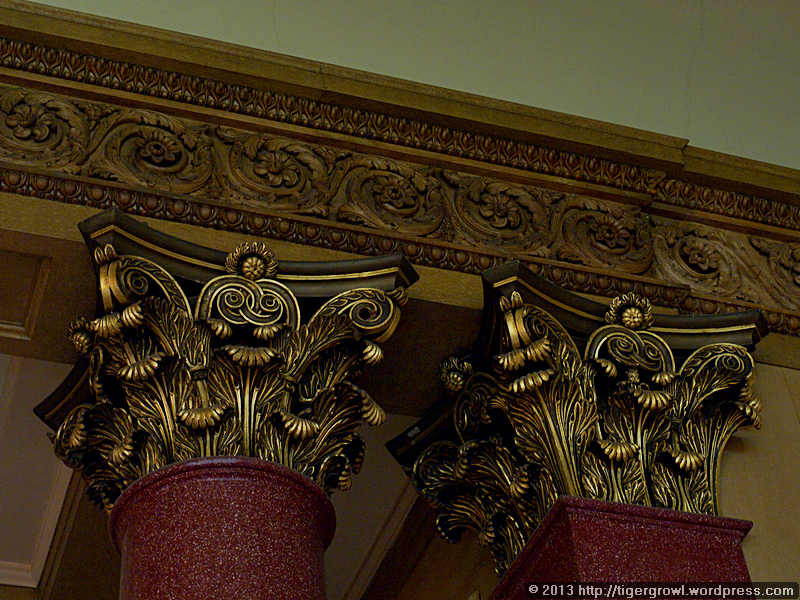 The design of the decor is “Classical” in the sense that the patterns tend to be geometrical and symmetrical. The general impression is of restraint and good taste “(“taste” is an 18th-century invention) but a closer look shows intricate detail and elaborate carving and moulding, albeit on a small scale. 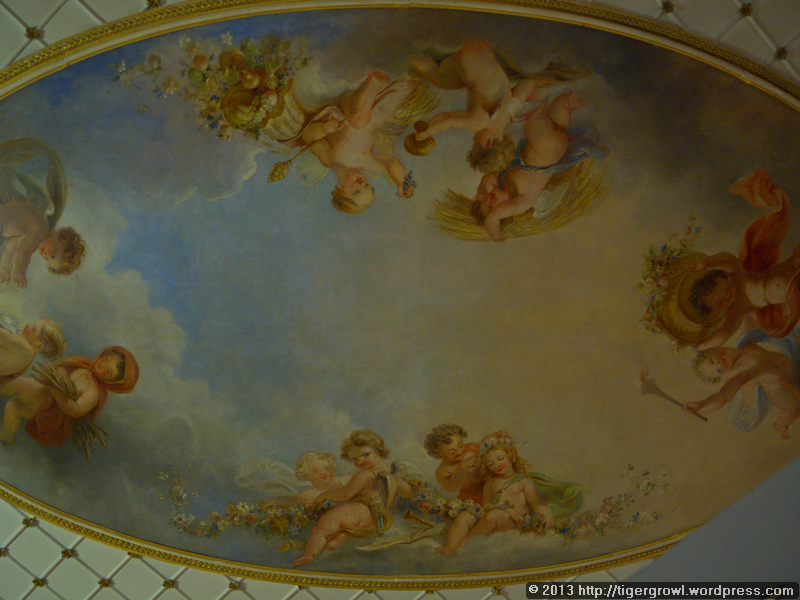 However, one does find more exuberant pieces of decor, such as the centrepiece to the ceiling in the Long Gallery. Its size and the layout of display cases etc made it impossible to photograph it whole. Executed in oils on canvas, the design represents the Four Seasons, each group of figures wearing clothes and engaging in activities representative of the season they symbolize. It was painted by Edmond Thomas Parris (1793-1873), a painter of landscapes, fairy scenes and portraits (he painted Queen Victoria among other notables), and is signed and dated 1837. 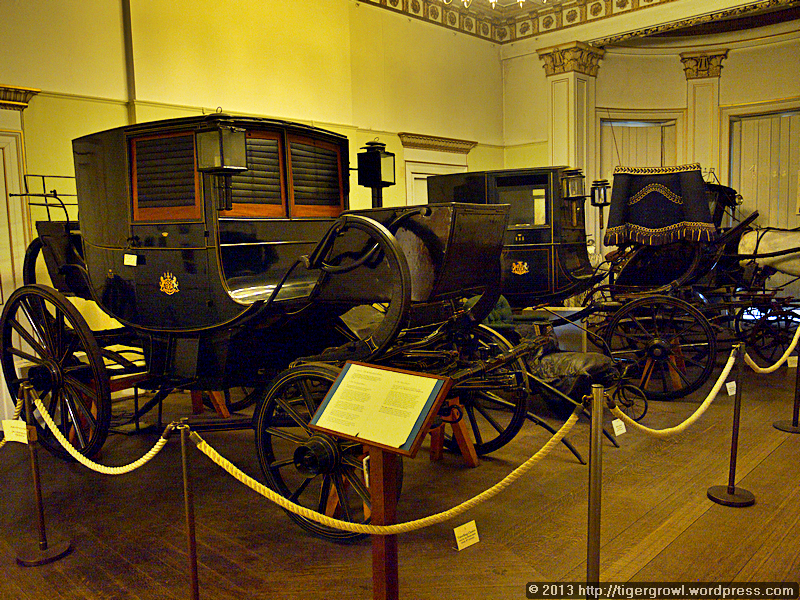 A collection of carriages, including a Bath chair, shows the vehicles in use by the Rothschild family in the early 19th century. They are comfortable, evidently designed with luxury in mind, and the accompanying description calls them “the Rolls Royces of their age”. This view through the trees shows the house known as the Small Mansion or Gunnersbury House (not to be confused with Gunnersbury Park House). After the death of Amelia, Gunnersbury Park eventually came into the possession of John Morley, a manufacturer of floor coverings. He demolished Amelia’s house and in 1801 sold off the land divided into 13 plots. Twelve plots were bought by Alexander Copland who built the large mansion that was later bought and modified by the Rothschilds as their family home. The second owner of the 13th plot was Major Alexander Morrison, and the Small Mansion was completed there in 1809. From 1828 to 1869, the house was owned by Thomas Farmer and his family but was then bought by the Rothschilds who united the two estates and used the mansion as an annex to house guests, including Edward VII. 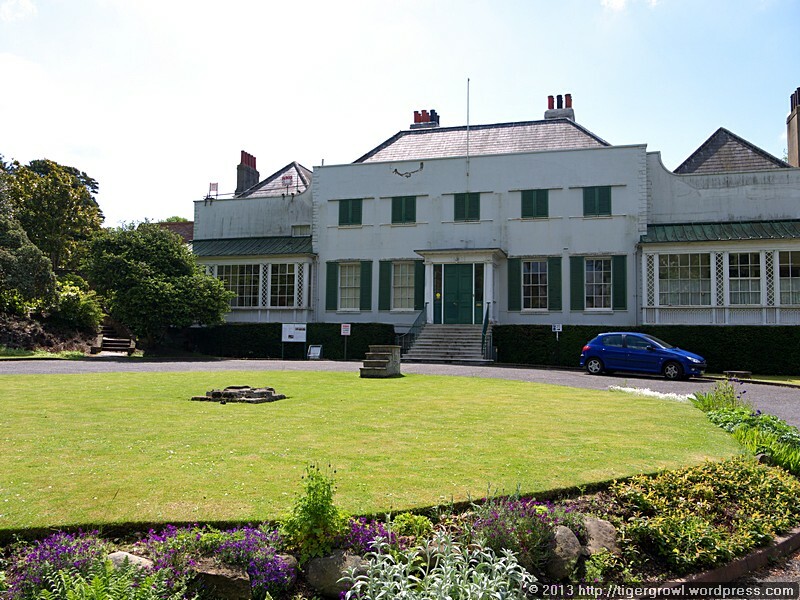 The two councils who jointly own the park are planning a refurbishment of the Small Mansion with a view to possibly using it as an extension for The Falcons, a local independent school for girls. 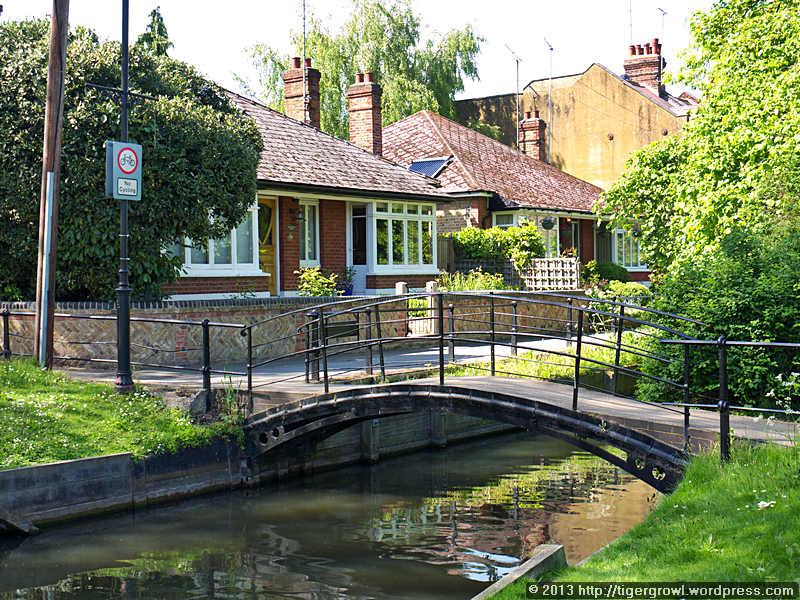 We returned home via Chiswick, where we had a little look around before catching a bus. 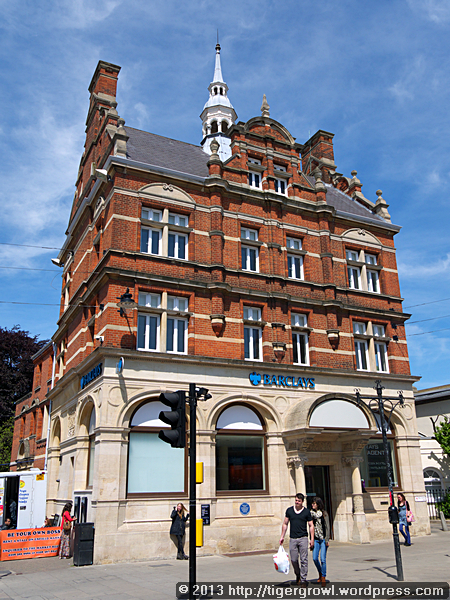 In Chiswick High Road we spotted this pretty late Victorian (1891) police station. Replaced by a more modern facility, the old building has been put to other uses, including a restaurant. As it is locally listed, the exterior seems relatively safe from “development” though interior remodelling has taken place. Apparently, the original police cells have been retained as a “feature”, though I don’t know whether they can be visited. 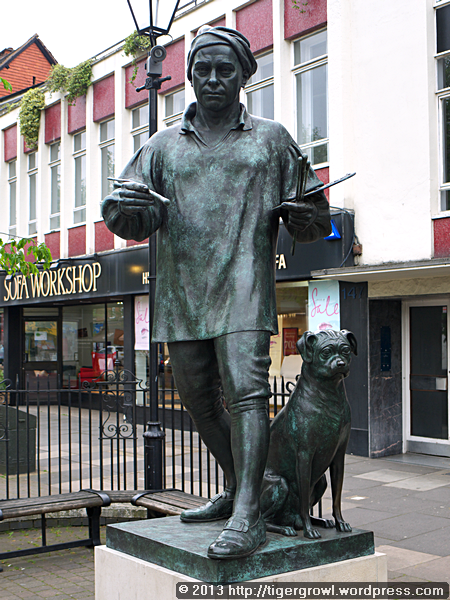 One of Chiswick’s more famous one-time residents was the painter William Hogarth (1697-1764) who lived locally from 1749 until his death. 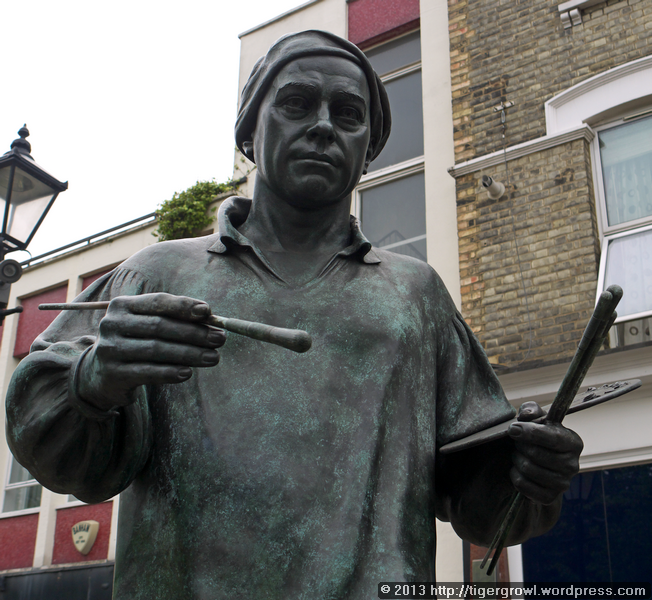 Hogarth’s House still exists and we visited it last year (see Hogarth’s cat and a few other people). Whatever I say about this much loved and celebrated artist will be insufficient so I will leave you with a few snaps of a sculpture erected in his honour in Chiswick High Road. 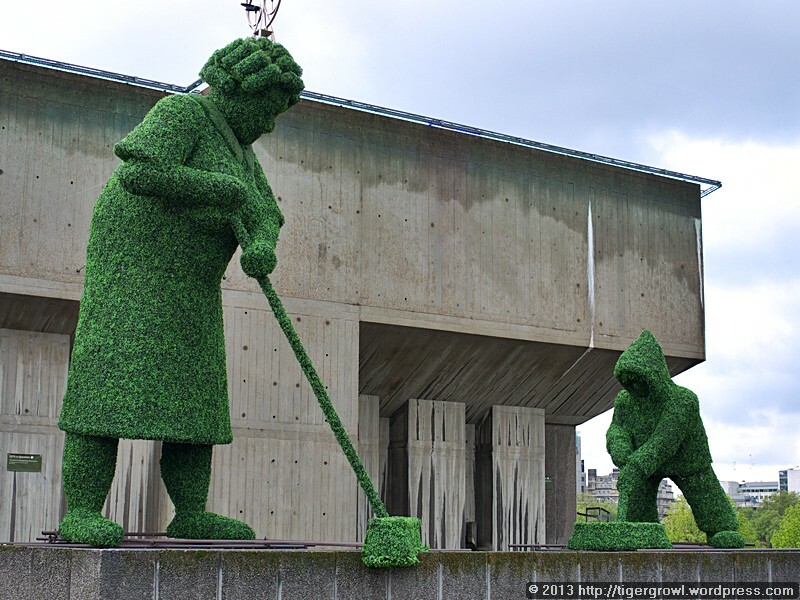 Funded by public subscription and unveiled in 2001 by Ian Hislop and David Hockney, the sculpture is by Jim Mathieson and features the painter in action, perhaps at a moment when he stops to assess how the work is progressing. 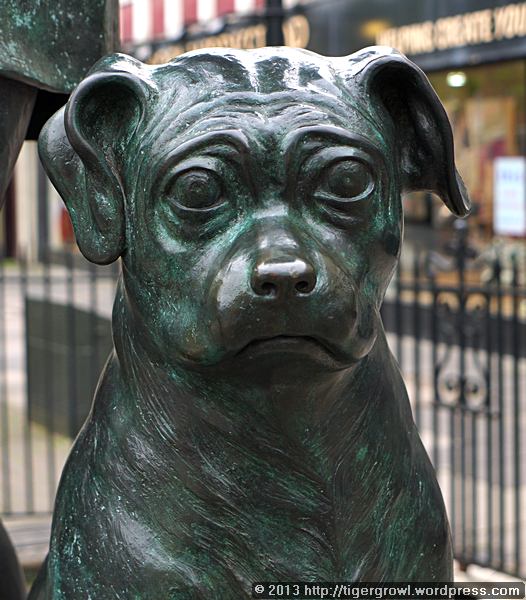 At his feet sits his pug dog Trump, beautifully modelled and with a somewhat bemused expression on his face. It is a fitting tribute to William Hogarth as well as a valid work of art in its own right, and a delightful note on which to end our outing. We may be on holiday but because we are staying at home – hence the term staycation – certain mundane everyday chores still have to be performed. One of these is the weekly shopping expedition to the supermarket. As we were busy over the weekend and yesterday, we had skipped this essential task and so thought we had better perform it today before we finally ran out of food and all the little commodities that make life comfortable. As usual on a shopping day, we began with breakfast at Pret in St John Street. Having completed the the shopping run, we had to return and put away our purchases. Naturally, we then made tea and dawdled a little and by the time we had finished dawdling it was lunchtime. Well, come on, holidays are not only times for rushing about but also times for resting and relaxing… even if we are doing it at home! For some time now, Tigger had had her eye on the Japanese Canteen and so today we went there for lunch. This branch is on the corner of Tottenham Court Road and Maple Street, in the heart of Fitzrovia, another fascinating area to explore. This is Japanese fast food, delivered London style, that is to say efficiently and impersonally, so that you feel like a cog in the machine rather than like a customer. First, you need to push your way through a crowd of people to the counter. There you place your order and become one of the crowd of people who, it turns out, are waiting for their food to appear as you now are. When they arrived, the bowls of food were full to the brim and boiling hot. This made them impossible to pick up until I had insulated my hands with paper serviettes, but only after I had scalded myself. No one offered a tray or warned me that the bowls were hot. Then I pushed my way through the crowd to a rickety table that Tigger was guarding for us. The food? Oh yes, the food… Well, it was OK but unmemorable. 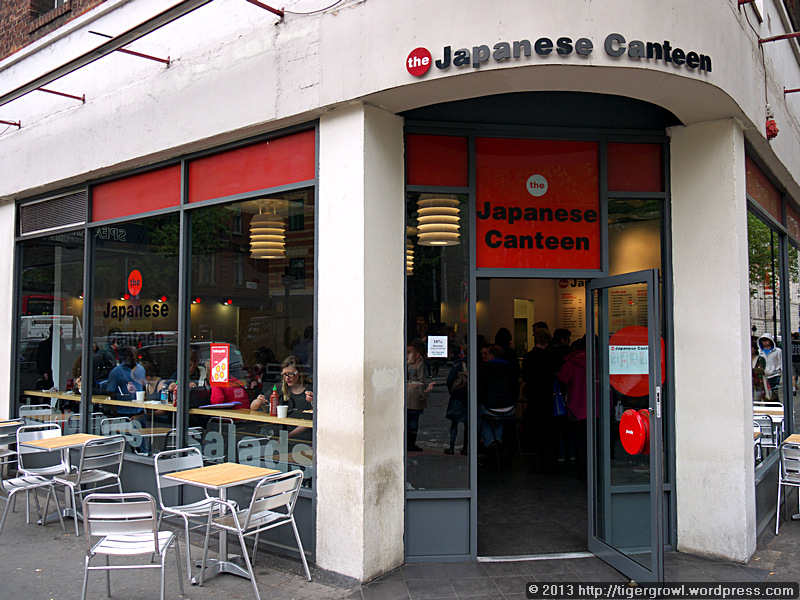 Would I go to the Japanese Canteen again? Yes, but only if Tigger insists. Really insists. Opposite Japanese Canteen is a street called University Street which eventually meets Gower Street. 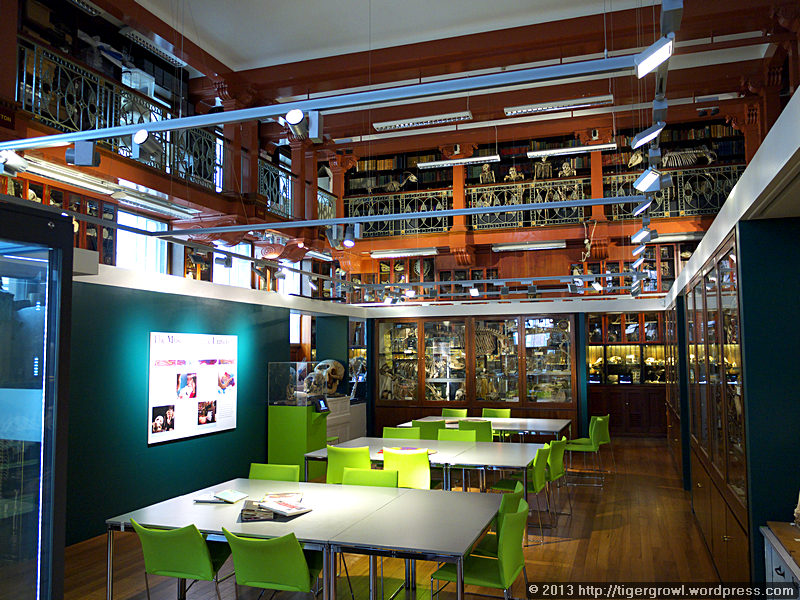 At its junction with the latter is an interesting institution called the Grant Museum of Zoology. It belongs to University College London (UCL) but the public are admitted free of charge every day except Sunday between the hours of 1 and 5 pm. Photography, as you see, is allowed, though not always easy, owing to the protective glass and the lighting, which is a combination of spotlights in an otherwise fairly dim setting. Founded in 1828 as a teaching facility, the museum is quite small but packed with interesting, of sometimes macabre, exhibits. Its teaching role is obvious from the space given to tables for study and the various interactive displays that invite you to do more than merely gawp at the exhibits. Mind you, I enjoy a good gawp. 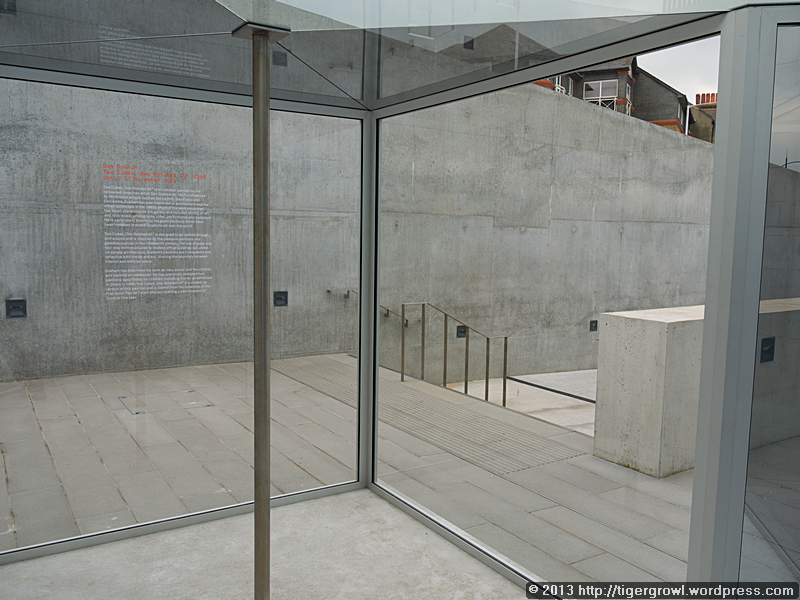 The layout of the museum is fairly traditional with look-but-don’t-touch displays, sometimes behind glass. 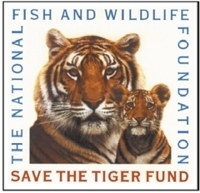 Everything is labelled so that you know what it is, and sometimes a small amount of supplementary information will be added, particularly if the species concerned is endangered. There is of course a certain irony in that. 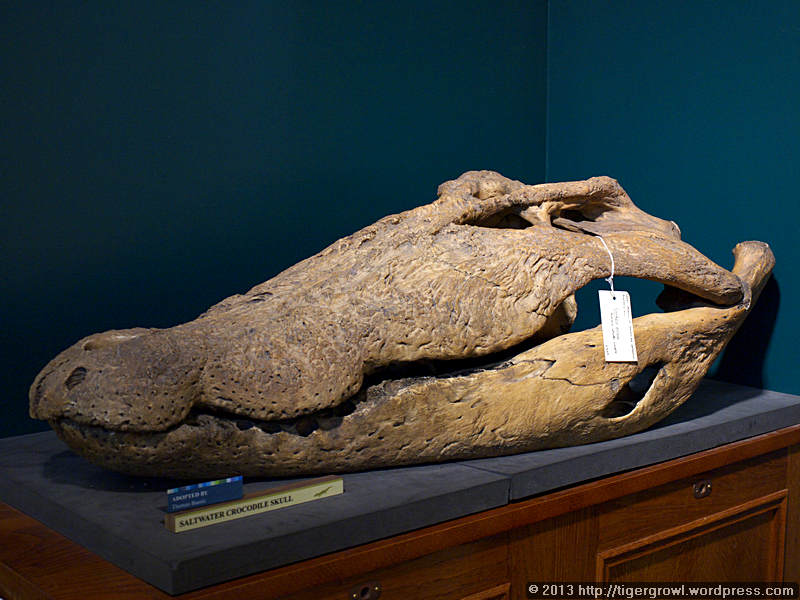 When collections such as this were formed back in the 19th century, there was no concept of endangered species. 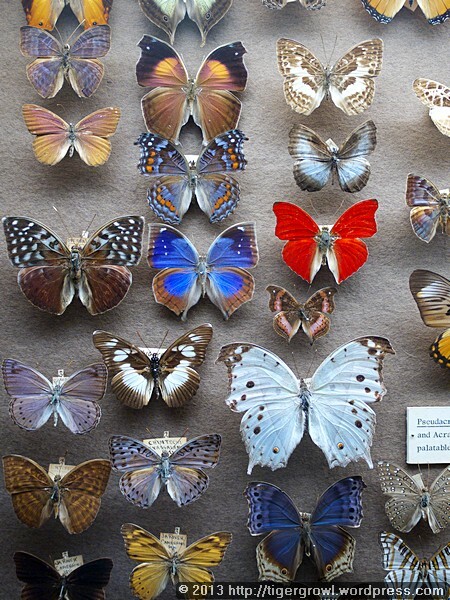 Collectors, whether they had scientific ambitions or were merely grabbing specimens for their own entertainment or to impress others, believed that nature was inexhaustible and could be plundered without concern or remorse. Today we know differently, and I for one, cannot look at collections such as this, well intentioned and useful as it may may, without a deep feeling of regret, even repugnance. Not that I am advocating closure of such exhibitions and destruction of their stock. Now that we have them, we should keep them. They do serve an educational purpose as long as people come to them in the right frame of mind. When we see the marvellous intricacy and beauty of these once living creatures, we realize how valuable and important their living counterparts are, how tragic is the lost of extinct species and how crucially important it is to protect and conserve those remaining by mitigating the harm that we humans, so clever and yet so clumsily ignorant, have wreaked, and continue to wreak, on the environment. 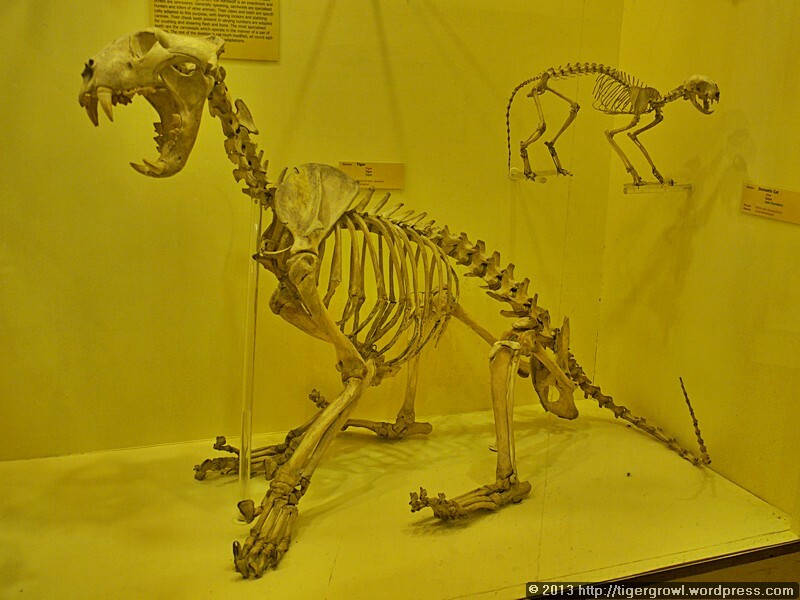 Many of the animals, especially the larger species, are present as skeletons, while others are preserved by the arts of the taxidermist or even pickled, like the famous or infamous jar of pickled moles. (No, I didn’t photograph it.) I do admire the skill and patience of those who built the skeletons and I hope that as we look on their work it teaches us how intricate living creatures are, how robust and at the same time how fragile, a poetic dissonance that brings a lump to the throat. 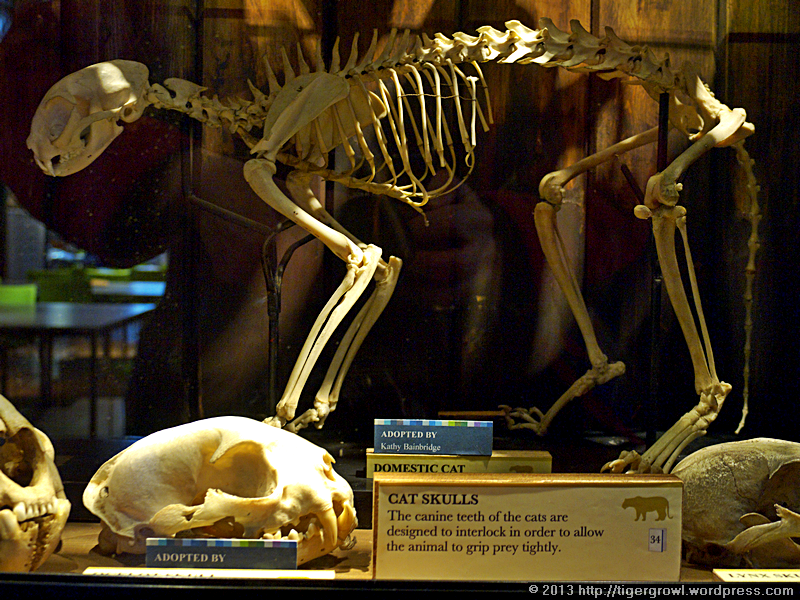 Along with complete skeletons (and what cat fancier could ignore the skeleton of the domestic moggy pictured above? ), there are detached body parts, such as the cat skulls decorated the above display. 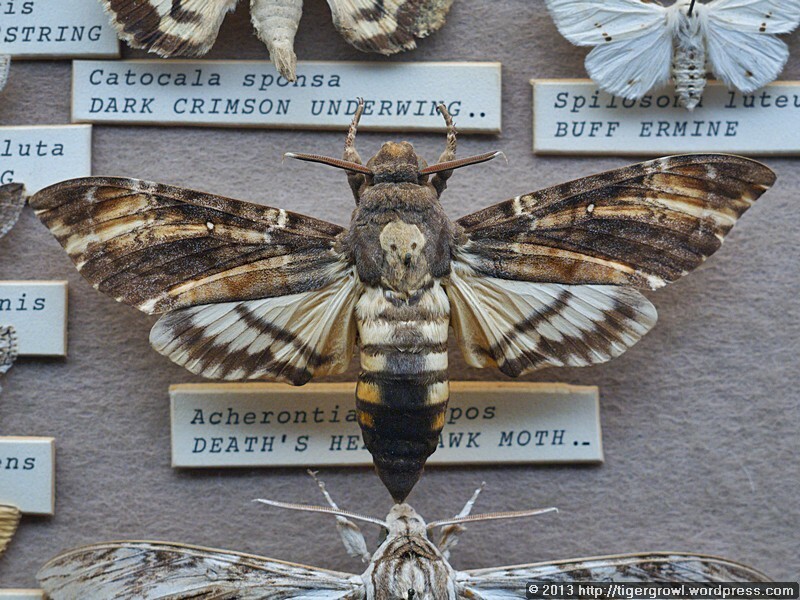 Not all exhibits of life forms were once alive. The exhibition includes a set of models made of glass by the Czech father and son team Leopold and Rudolf Glaschka, jewellers working in the 1870s and 1880s. More information on the unique work done by this pair can be found here. As we moved around the museum, I had a vague feeling of being watched. 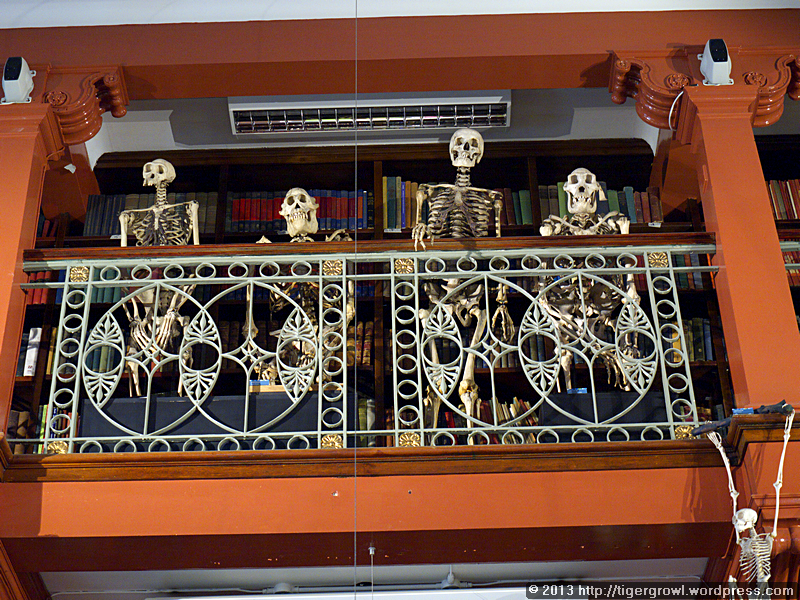 Perhaps that was because of the skeletal company apparently observing us from the upper walkway (closed to the public). I am not sure of the composition of this group but I think there are a couple of human skeletons and a pair of ape skeletons. 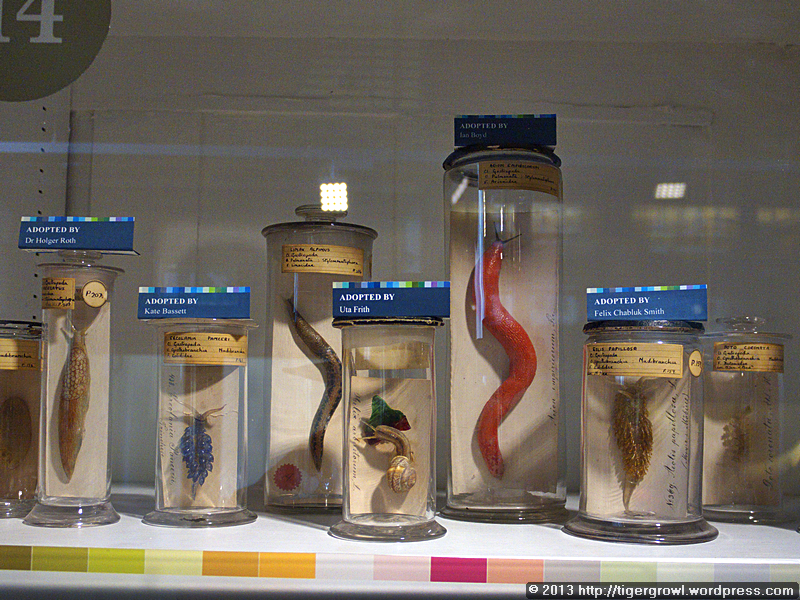 I must admit to being a somewhat reluctant visitor the the Grant Museum, partly for the moral reasons given above and partly because I would much rather see living creatures going about their normal lives. 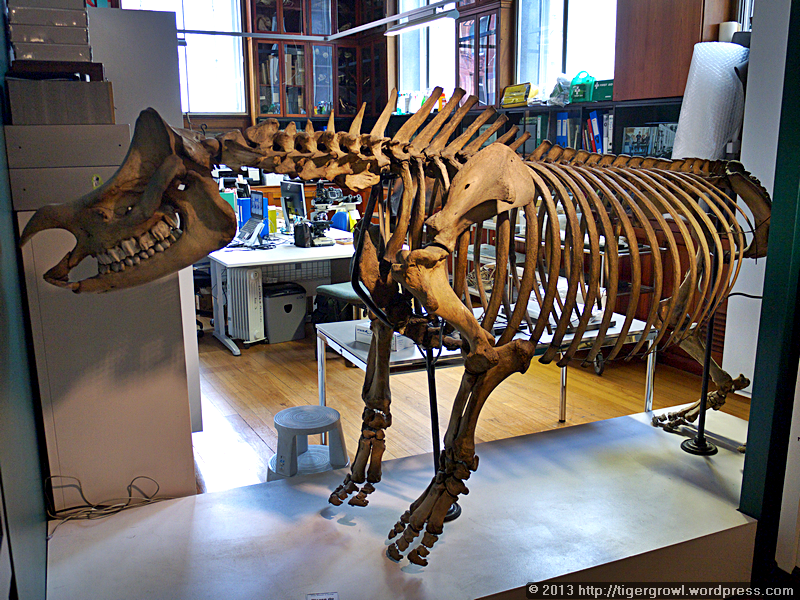 However, I recognize that this is a valuable collection with an educational role to play and have no doubt that students of zoology, biology and anatomy will here find useful material for study. 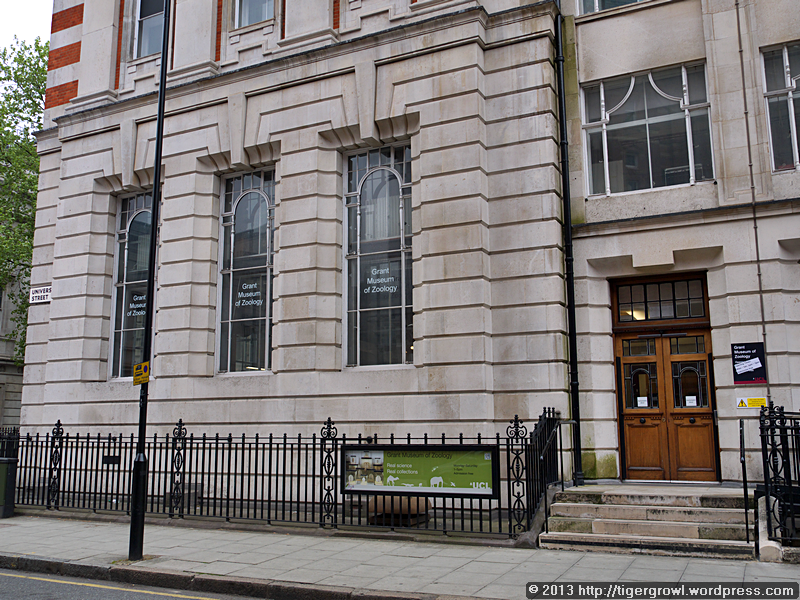 Leaving the Grant Museum, we walked through the grounds and buildings of University College London. 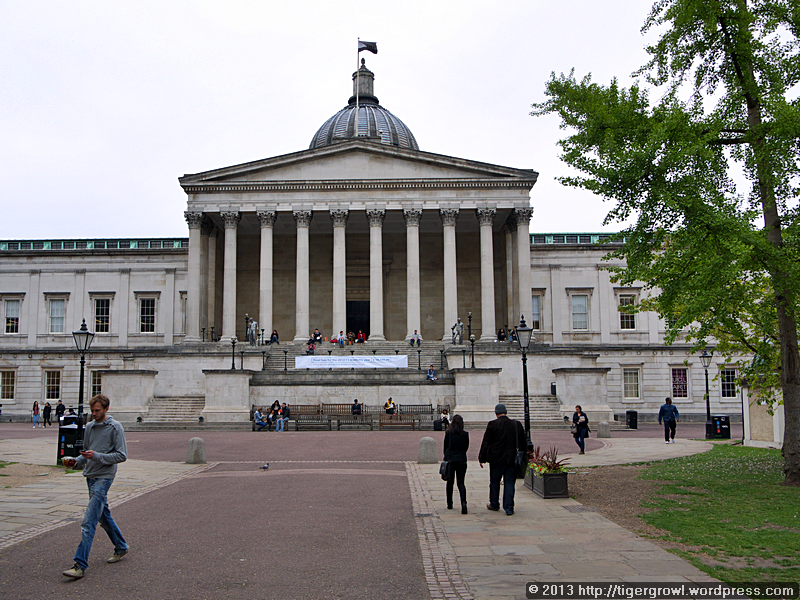 The University of London, like several other famous universities, is really a collection constituent colleges. 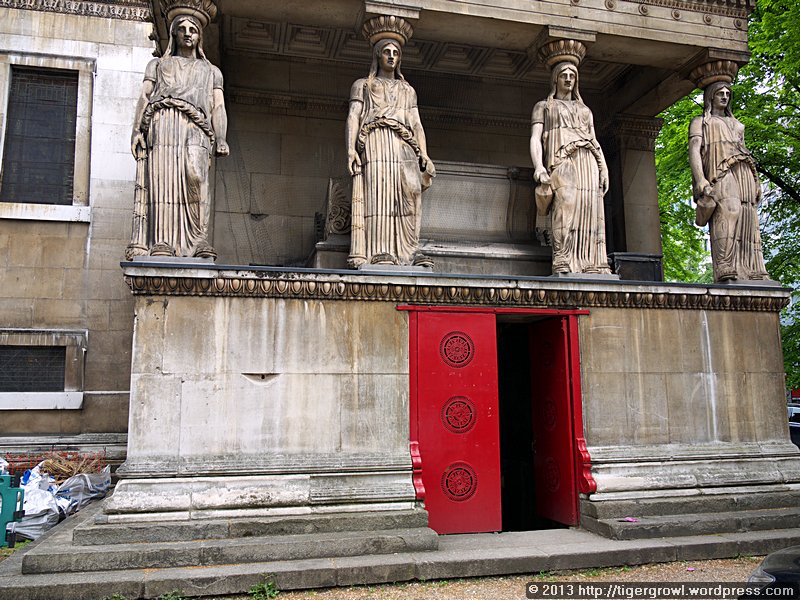 This may puzzle the uniformed visitor to the capital who seeks in vain for the mythical “University of London”. It is mistakenly thought by many that philosopher Jeremy Bentham (1748-1832) was the founder – or principle founder – of University College but this is not so, though he is in a sense seen as its spiritual father. However that may be, Bentham’s will specified that his body should be dissected and preserved. This was done and an “auto-icon” was created, consisting of the philosopher’s skeleton, dressed in his own clothes, and his mummified head. 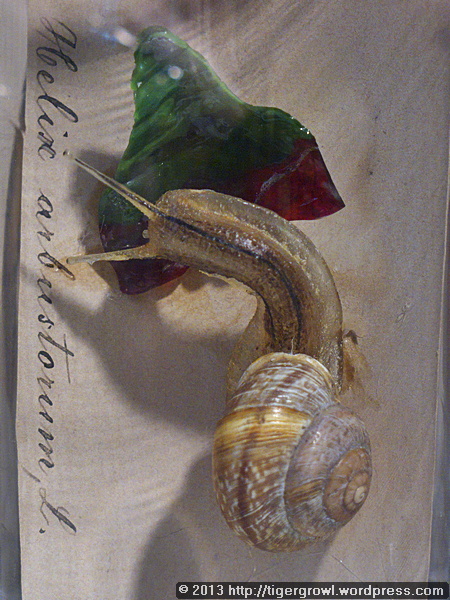 The auto-icon was moved to UCL in 1850 and is there still, displayed in a glass-fronted case. Preservation of the head was not successful and the present one is a wax model. 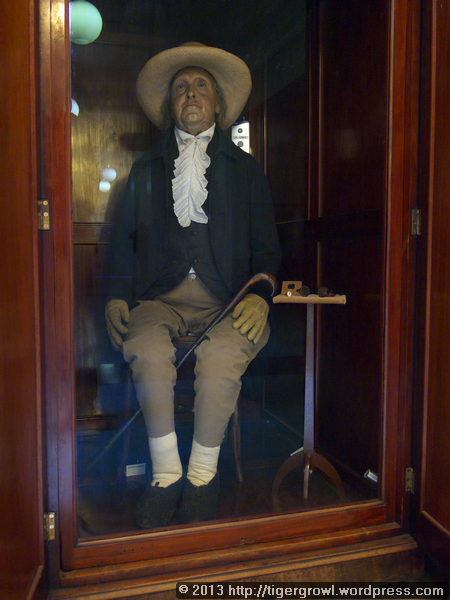 Bentham’s real head used to be displayed on the floor between his feet but has now been put away in storage, not so much for its unpleasant appearance as to avoid hijackings and other practical jokes that it tended to attract. It is claimed that when College Council meetings take place, the auto-icon is solemnly wheeled into the chamber and Jeremy Bentham’s presence noted “(“Present but not voting”) in the minutes. I am unable to say whether this claim is true. Either way it makes a good story. We went through this rather elegant survival of late Georgian times. 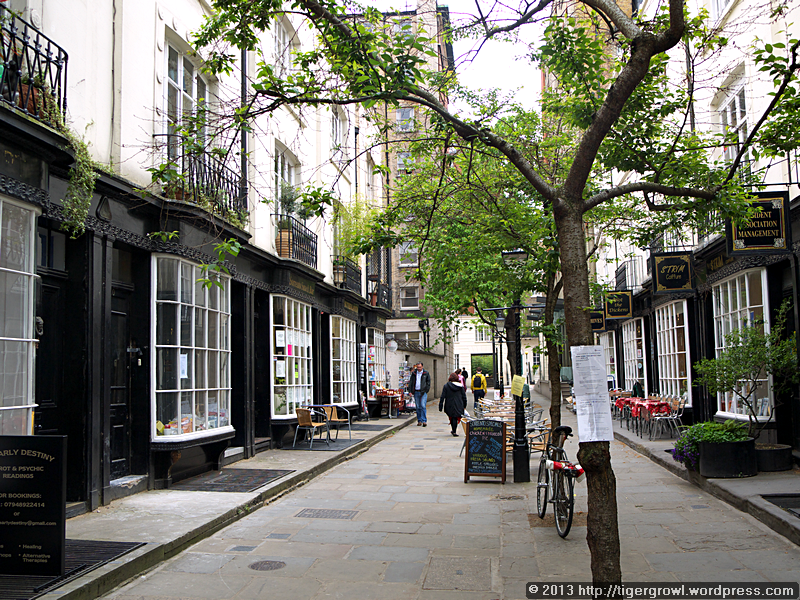 It is called Woburn Walk and was designed in 1822 by Thomas Cubitt as a shopping centre. Some of the premises are still shops and the floors above are apartments. 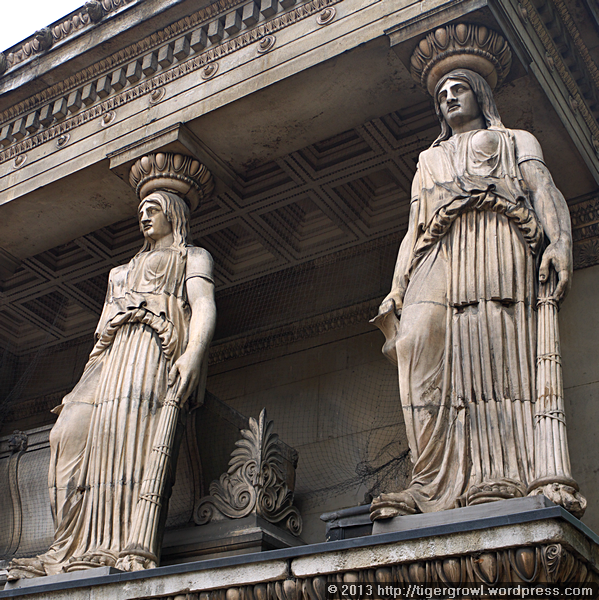 We were heading for the church that is characterized by a set of Classical Greek style caryatids. 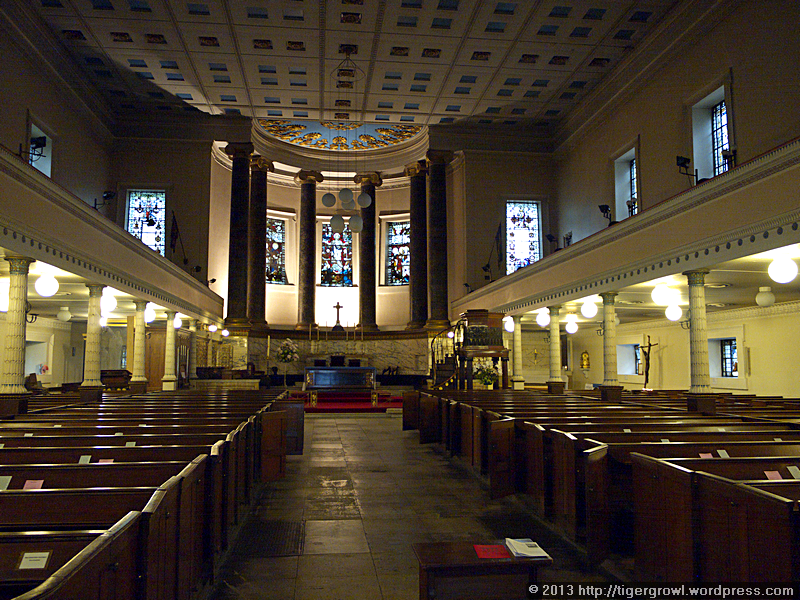 It is St Pancras New Church (yes, there is also a St Pancras Old Church), also known as St Pancras Parish Church. It was built by the father and son team William and Henry William Inwood in 1819 to 1822 and extensively restored 1951-3. One of the things you notice about the church as you approach (apart from the caryatids and the Greek Revival design) is the works of art in the churchyard. 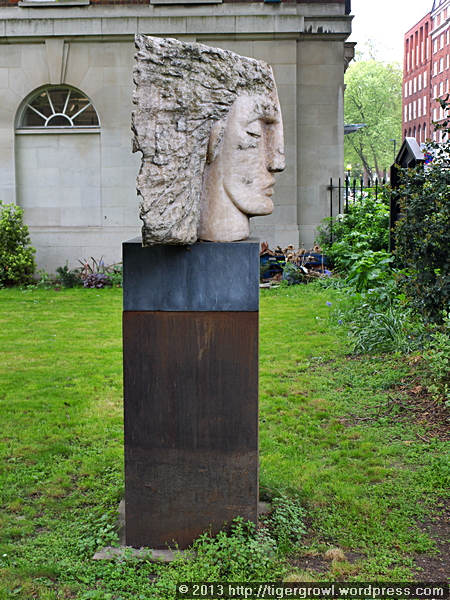 This one, by Emily Young, represents the Archangel Michael and is “In memory of the victims of the 7th July 2005 bombings and all victims of violence”. 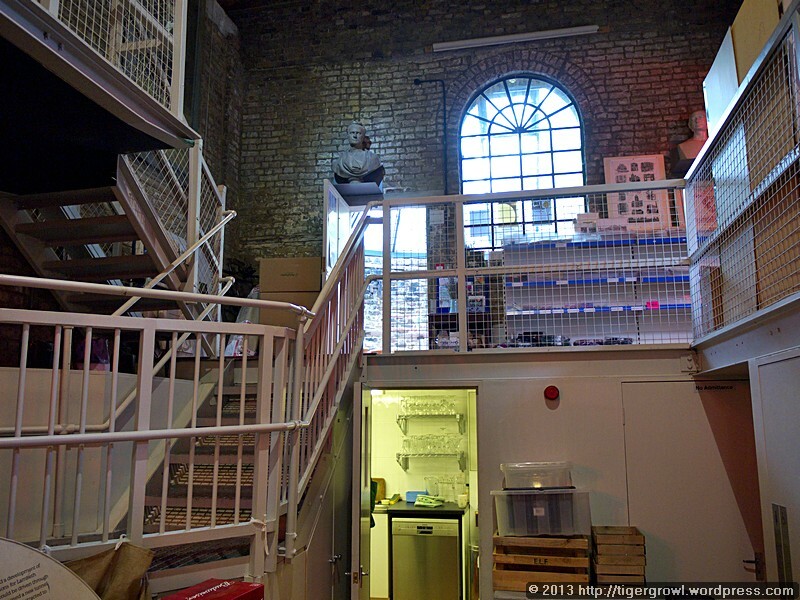 While St Pancras is still a functioning church it also doubles as an art gallery and holds frequent exhibitions. 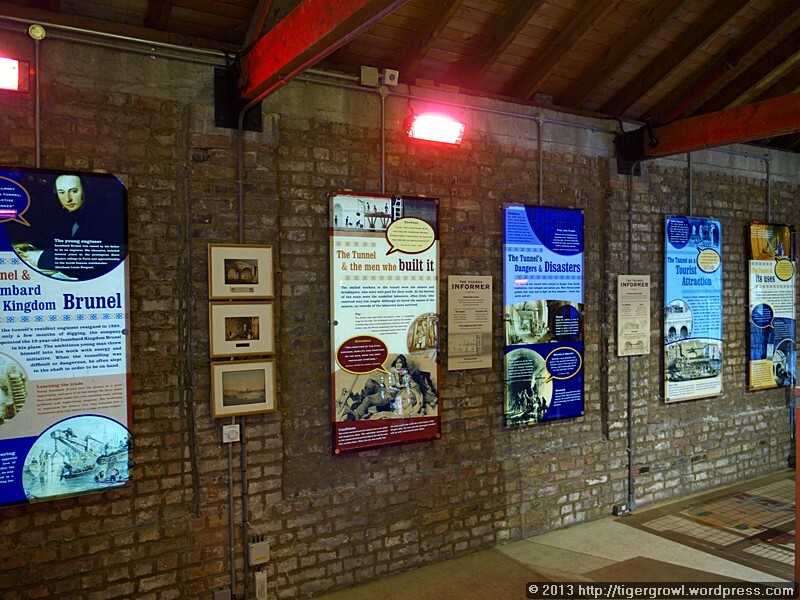 The indoor art gallery is situated in the crypt. The entrance is at the side of the church and marked by this red door. The exhibition we had come to see was Seeking Artemis, featuring works in mixed media by six artists, supposedly inspired by the caryatid figures, thought by some to represent the goddess of that name. The welcome was friendly but a request to take photos was firmly refused, so I cannot show you any of the works. To be honest, though, there wasn’t much that interested me. All in all it was dull and typical of much art today whose imaginative intentions are not matched by excellence of design or execution. If you want to get some impression of the exhibition, you will find a video here. For a brief description, see part way down this page. Let’s hope future exhibitions will prove more exciting. 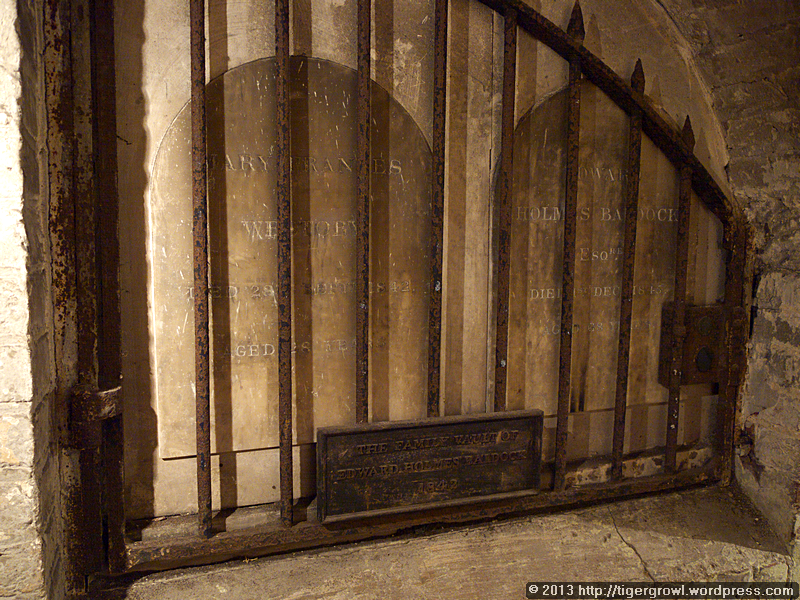 The crypt is consists of passageways and archways and there is a certain amount of clutter that has nothing to do with art exhibitions. 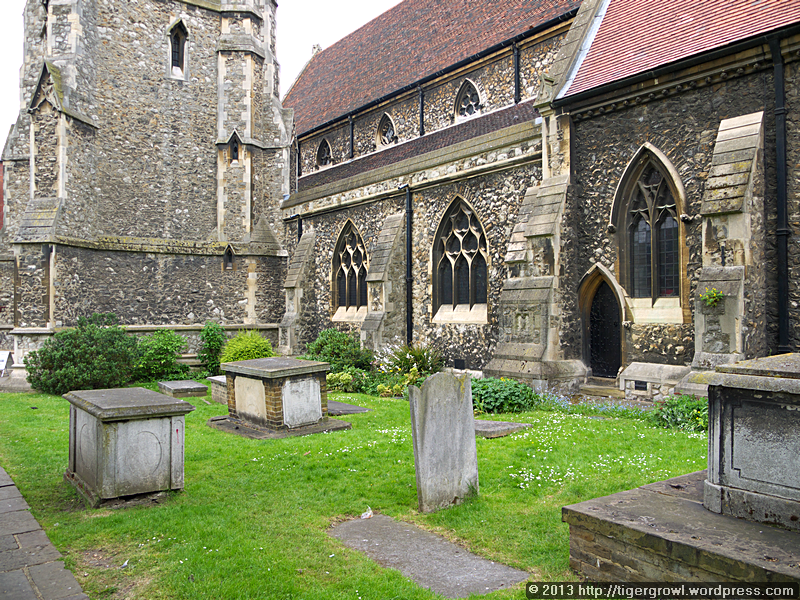 These gravestones and the piece of architectural decor in one corner are no doubt remains from the graveyard that has now been cleared as have most old burial grounds in town. 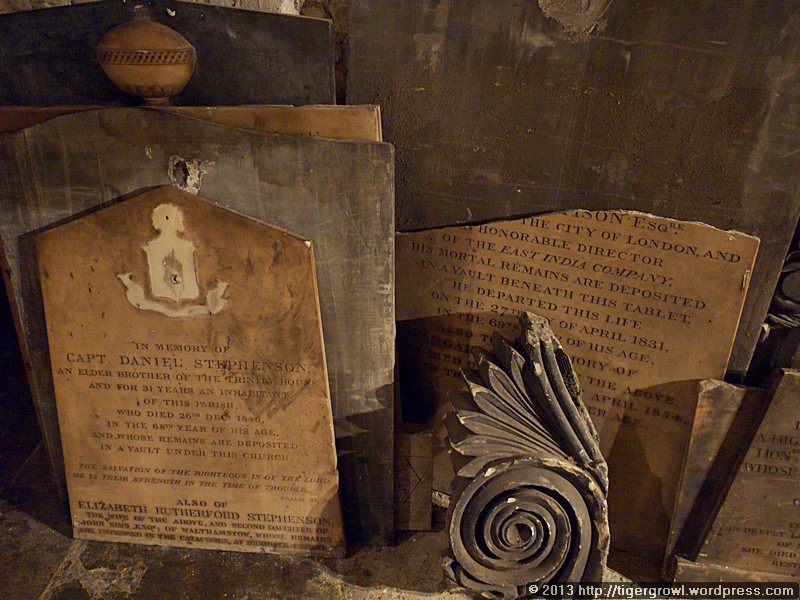 Such fragments languish underground as often touching reminders of lives now forgotten but for a few pious words scratched on stone. I also spotted this vault, guarded by a stout iron gate. The name plate tells us that it is “THE FAMILY VAULT OF EDWARD HOLMES BALDOCK 1842”. Are the original tenants still resting within? I have no idea. While we were there we had a look inside the church. It is quite impressive and well furnished. In the above photo, note the gates closing off each row of pews. A church with a large and active congregation like that of St Pancras attracts gifts and donations from wealthy parishioners. 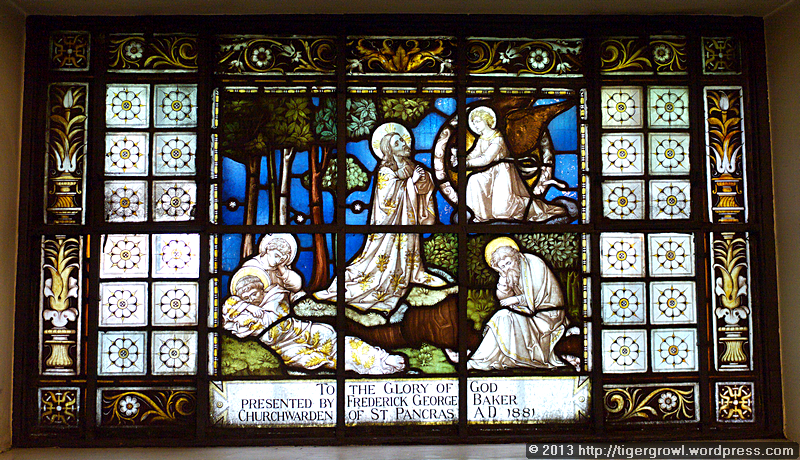 Above is one example, a stained glass window donated by one Frederick George Baker, Churchwarden, dated 1881. 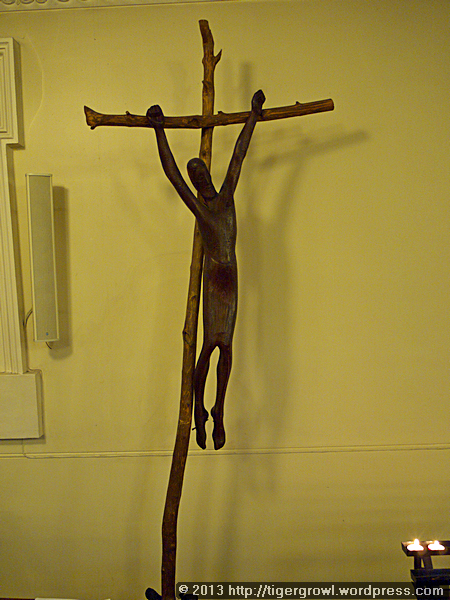 In contrast to the more traditional items of decor is this piece, entitled The Crucifix of Christ the King, by Fenwick Lawson. Among such more traditional fittings is the font. Made of alabaster and with glass mosaics set in each of the eight sides, it is of unknown date though is most likely late Victorian or Edwardian. 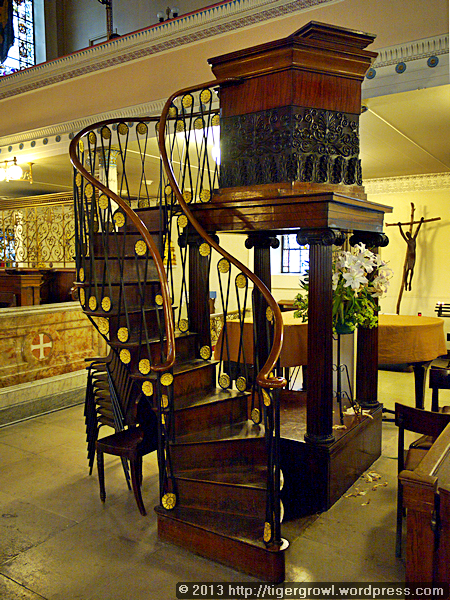 I was rather taken by the elegantly curved stairway attached to the, probably Georgian, pulpit. Whoever built this was a highly skilled craftsman with a developed aesthetic sense. There would have been other treasures to investigate but we left them for another time and repaired to Caffè Nero across the road at Euston station. A rest on their soft seats and a reinvigorating cup of coffee provided a pleasant end to the day’s rambles! 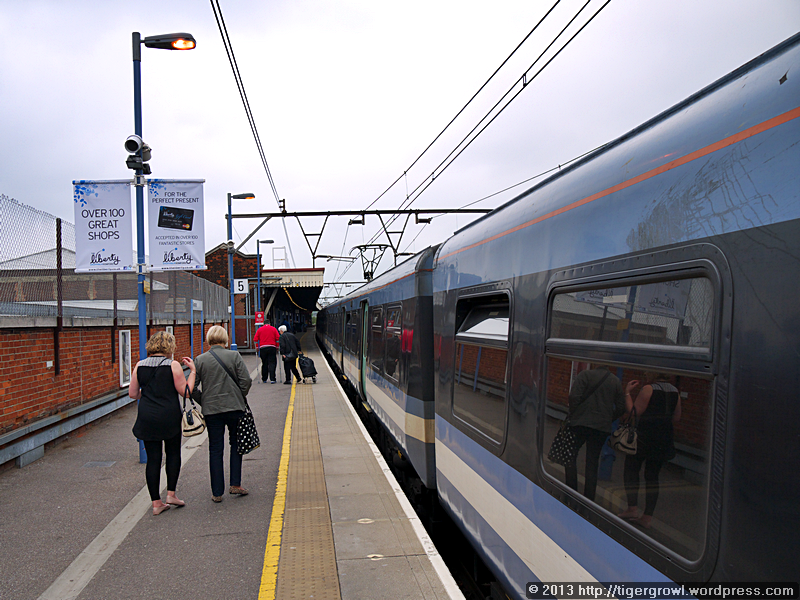 Today’s expedition started aboard the Highspeed 1 (HS1) train that took us north-east to the old market town of Romford, once in the county of Essex but now part of the London Borough of Havering. This map shows its location in relation to London and if you click on it, this will take you to an interactive Google map of the area. 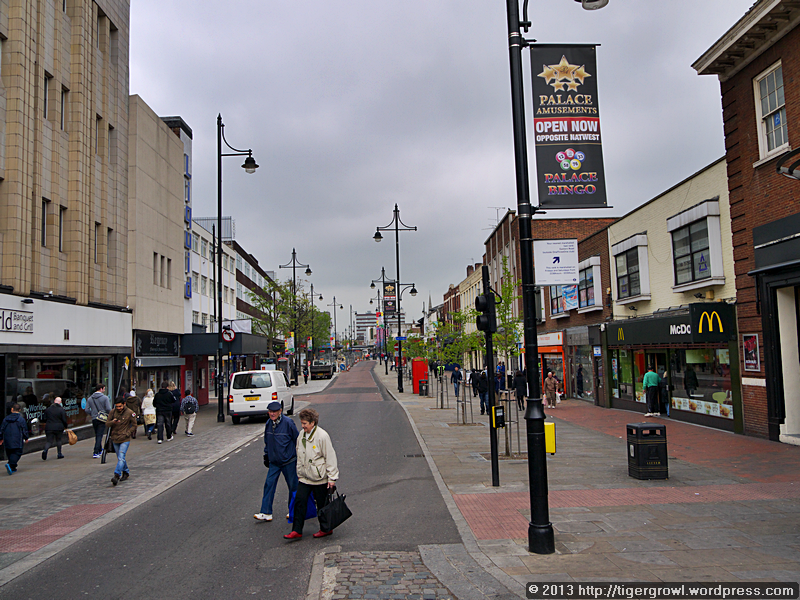 The origins of Romford are lost to us but its very name suggests why it came into being. I refer of course to the second syllable –ford. 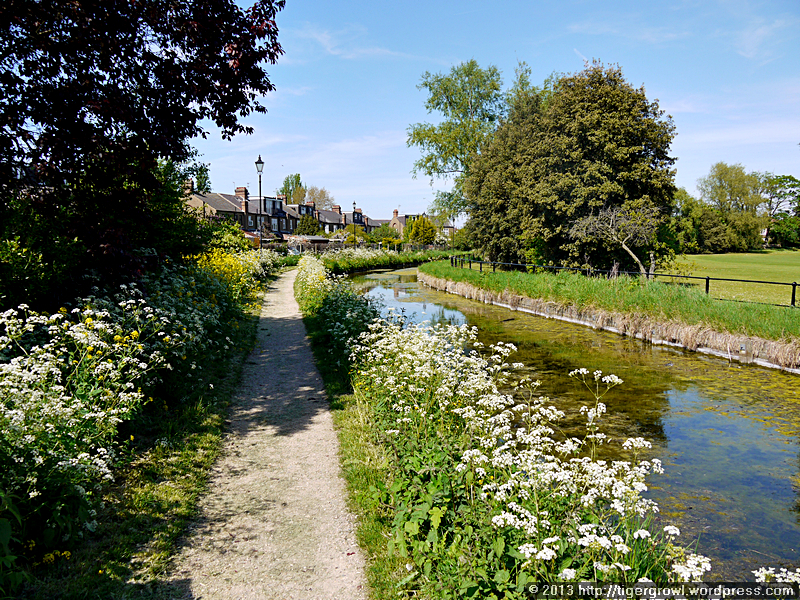 Even though the name appears as Romfort in earlier documents, there is no doubt that ford or fort means what you think it does: Romford is one of those towns that grew from a settlement beside a ford across a river. What about the Rom part of the name, though? Quite often, when there is ford in a town’s name, the preceding syllables refer to the name of the river. Is that the case here? We can only answer both yes and no! The name comes from Anglo-Saxon rum, meaning ‘broad’, and ford, meaning, well, yes, a ‘ford’. So the name means “Broad ford”. However, people thought that Rom ought to be the name of the river and so the river came to be called the Rom. At least, it is called the Rom where it passes through the town. 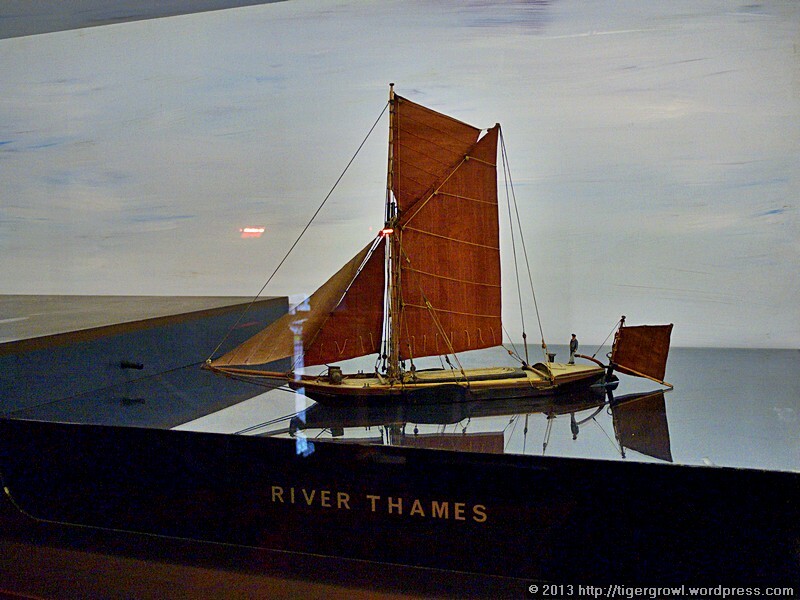 Further south it reverts to its original name, the Beam, and under that name eventually runs into the Thames. 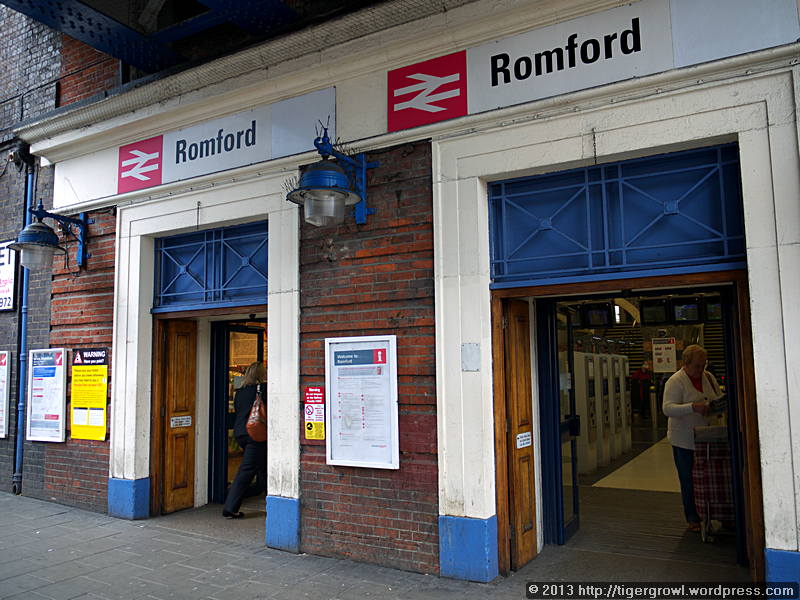 I have never previously been to Romford, at least, not as far as I know. I therefore had no preconceptions about the place and am being honest when I say that it failed to impress me. More than that, I found it depressing. Maybe the dull weather had something to do with this. (The lighting of the photos gives you a clue to conditions.) Maybe on another occasion I would have liked the town but not today. My mood improved a little when I spotted this old inn, the Golden Lion in the High Street. The building is a bit of a mish-mash but in a case such as this, that lends interest rather than detracting from it. This site reckons that records of an inn on this site go back to the 15th century and they could well be right. According to English Heritage, the structure as it appears today began in the 17th century and bears additions and alterations applied at certain times since then. 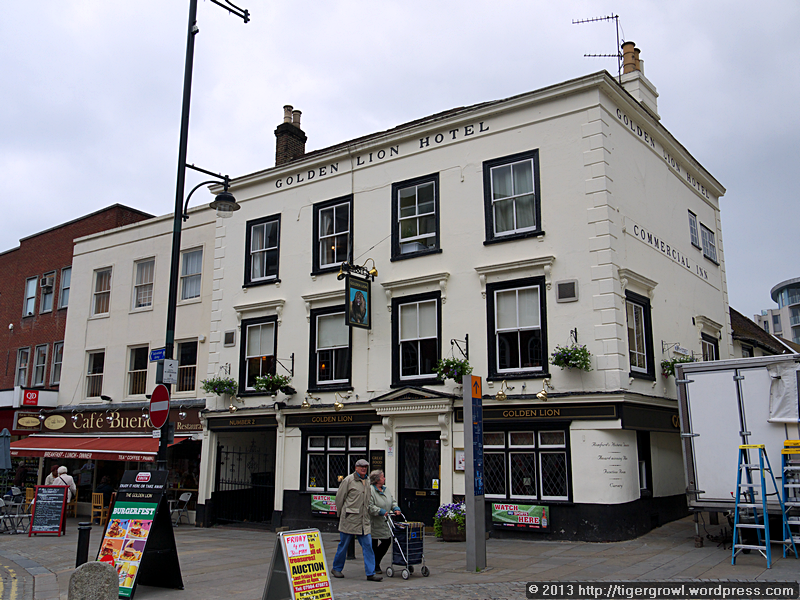 It also has a coach entrance (on the left) showing its use as a coaching inn. I believe that there is also some fine period structure left in the interior but we did not go in to see this. As noted above, Romfort is an old market town, and this was one of our reasons for visiting it. 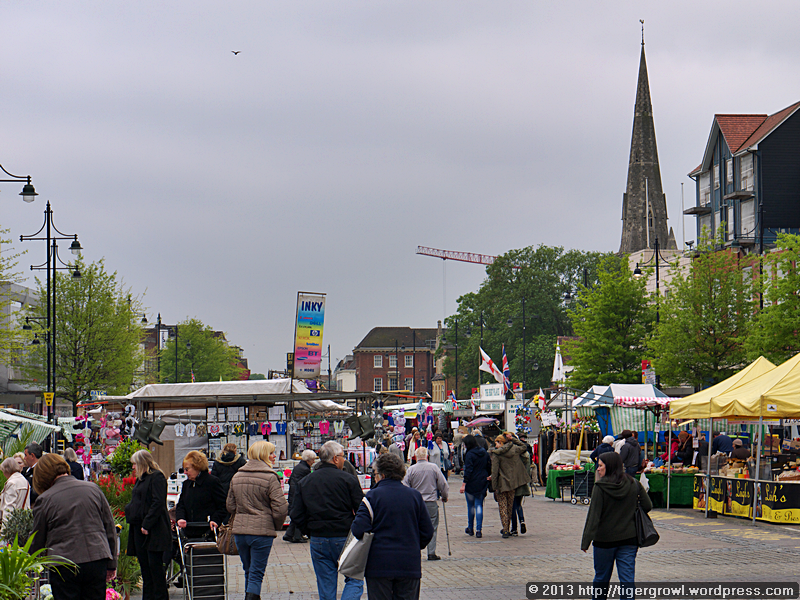 The market started as a sheep market and its charter, granted by Henry III, was given in 1247. 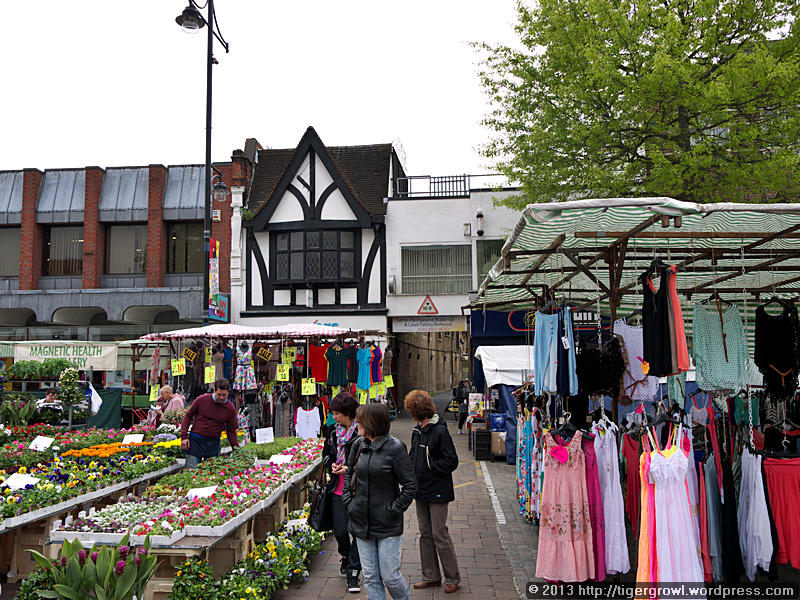 It operates on Wednesdays, Fridays and Saturdays, and is claimed to be one of the largest street markets in the South East with up to an estimated 270 stalls. 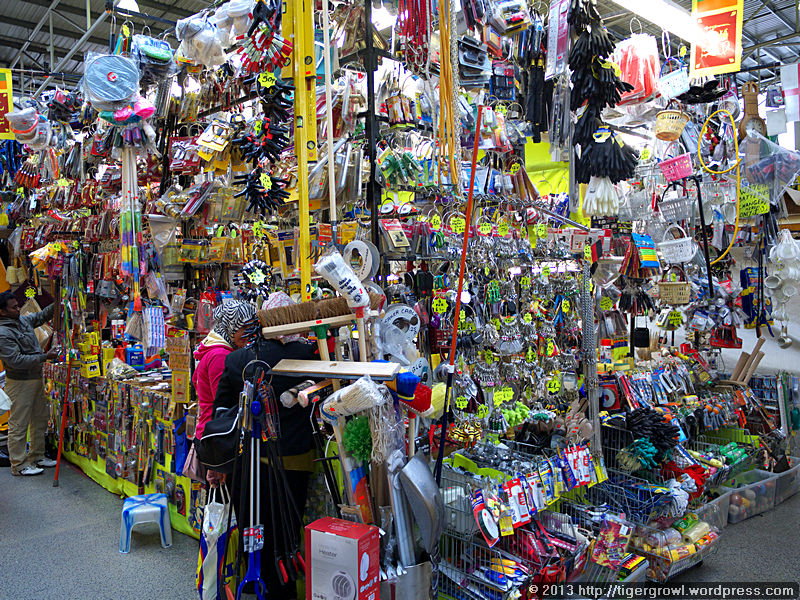 It was certainly a lively scene and there was a wide range of goods on sale. The whole area was busy and it is my experience that when a market is in full swing, the nearby shops also benefit from an upsurge in custom. 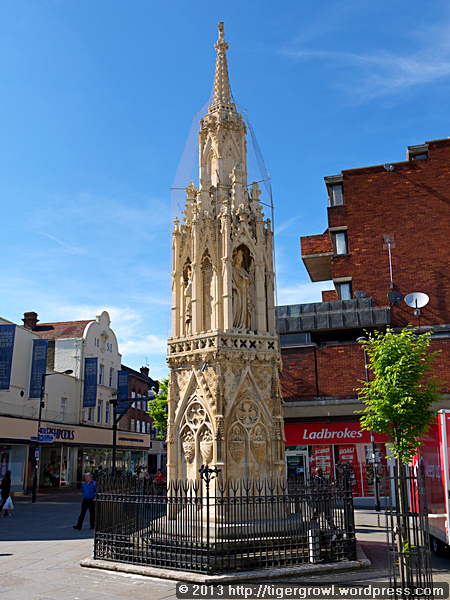 The spire you can see in the first photo of the market above belongs to the Church of St Edward the Confessor. The church’s Web site claims that the first church on this site was built in 1410 and I have no reason to doubt them. The present church, however, is somewhat younger. 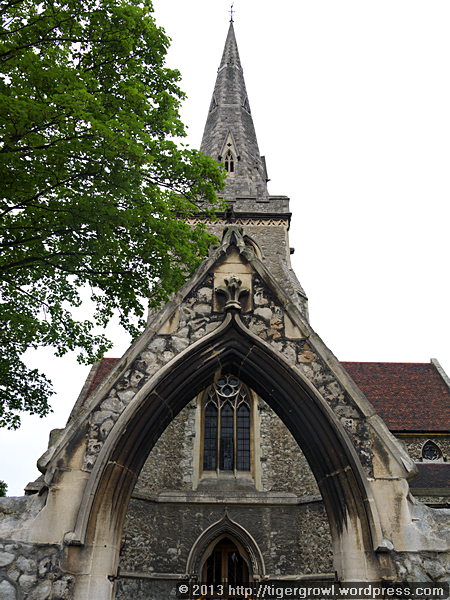 Designed by John Johnson it was consecrated in 1850 and has a rather unusual gateway whose pointed arch of course fits the Gothic Revival style of the church as a whole. This photo gives a better idea of how the arch fits in with the wall and the rest of the church. The fabric of the church is local ragstone, with Bath stone ornaments, and it is apparently suffering from the ravages of time. Edward the Confessor, of course, was so called because he was the King of England who preferred to spend his time praying instead of attending to affairs of state. His laxity and confused dealings led directly to the Norman invasion and the depredations of that gangster, William of Normandy. 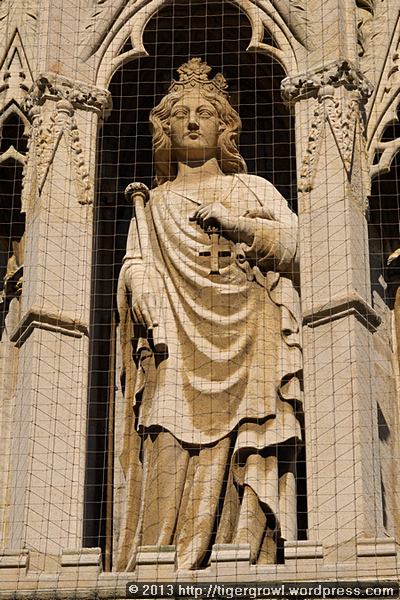 His sainthood is therefore one of those rewards for incompetence that are still too common in business, government and the civil service in our own day. Behind the church is a short street with the quaint, if sinister, name Ducking Stool Court. 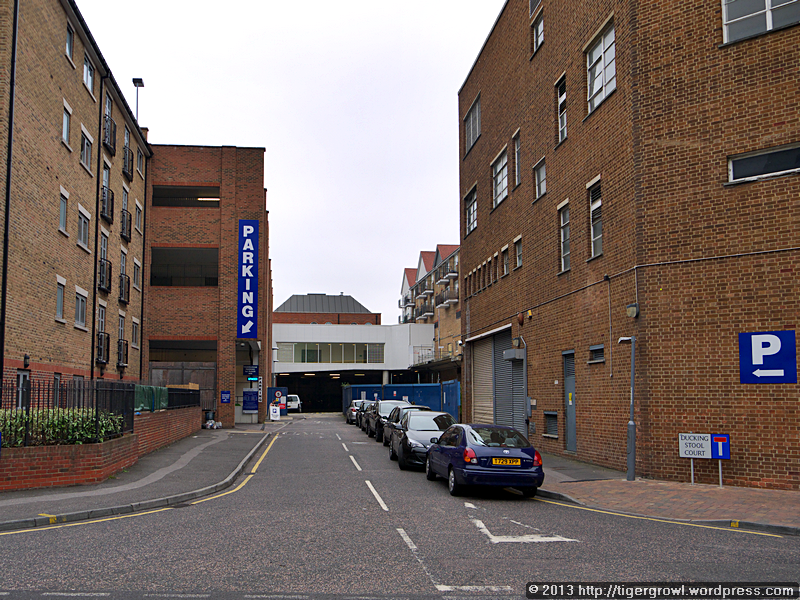 Today it is dominated by a multi-storey car park and I cannot say what purpose it served in medieval times. Was there ever a ducking-stool here? I don’t know. However, I did read that the leet court ordered the establishment of instruments of punishment in three places within the town, comprising stocks, ducking stool and cage. It is therefore possible that a ducking stool existed somewhere near here. The absence of a pond or river need not give us pause because, though it is popularly thought that punishment by ducking-stool implies dunking the victim in a pond or river, this isn’t necessarily the case. Known also as the scolding-stool, the cucking-stool and the stool of repentance, this device was a chair into which the victim was tied and then exposed to the crowd for purposes of humiliation. The stool might also be designed to be dragged around the streets. The victim was normally a woman (if you haven’t already guessed), as the ducking-stool was commonly used as a punishment for those accused of being scolds and backbiters. We thought we would go and visit the museum. 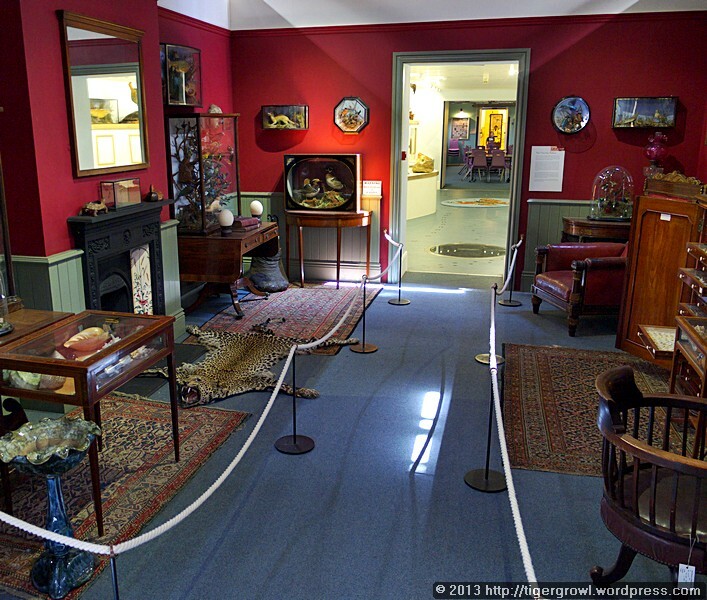 This is called Havering Museum. 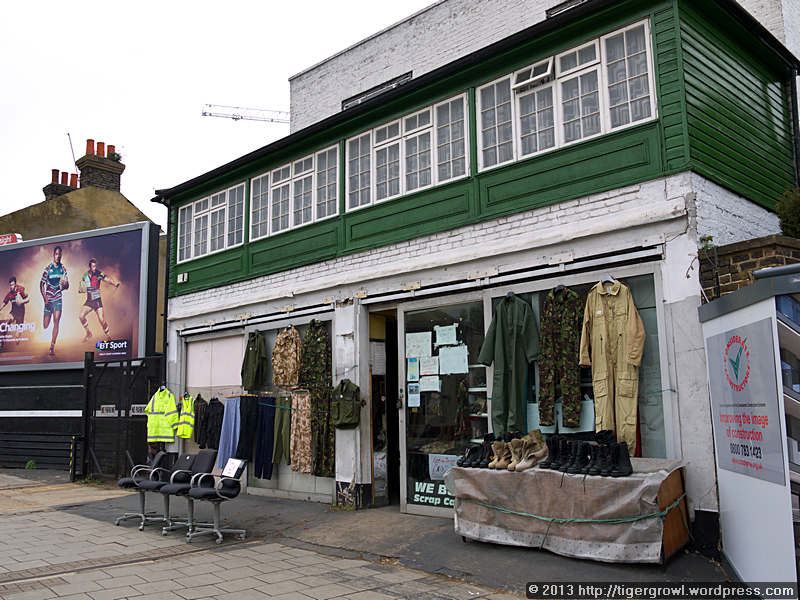 Why “Havering Museum” and not “Romford Museum”? Well, because the local governing body is the Borough Council of Havering, not to be confused with the village of Havering-atte-Bower, though I suppose there must be a connection somewhere. The museum was closed when we arrived but, so we were told, would open shortly. 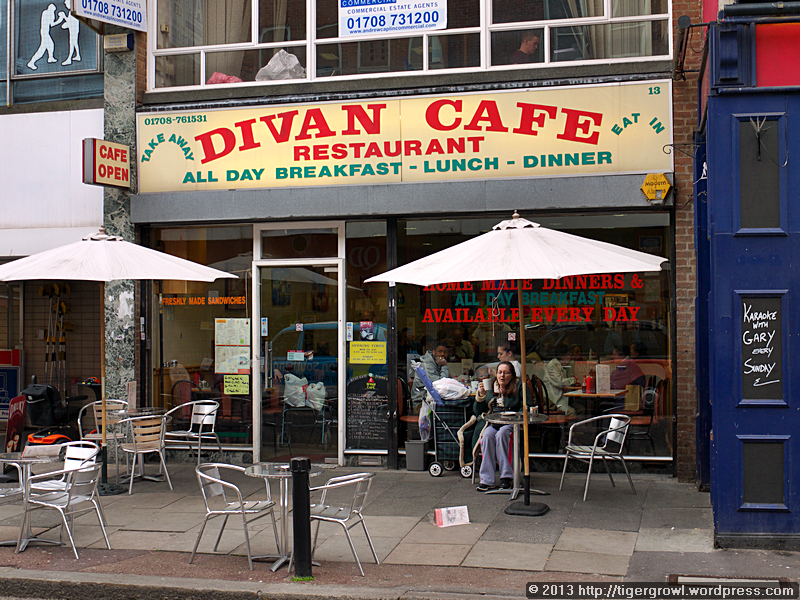 We took the opportunity to go across the road to the Divan Cafe and have lunch. 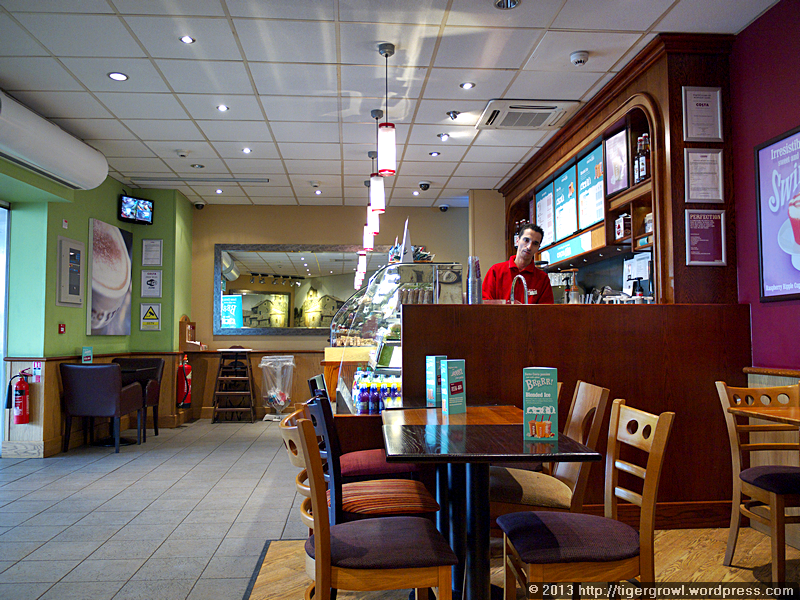 The service was friendly, the food good and the prices reasonable. What more could you reasonably ask for? Having finished lunch, we found the museum open and went in. Unfortunately, photography was prohibited. (When are public museums and galleries going to desist from this silliness?) As I cannot show you any pictures it seems pointless to say anything about it. 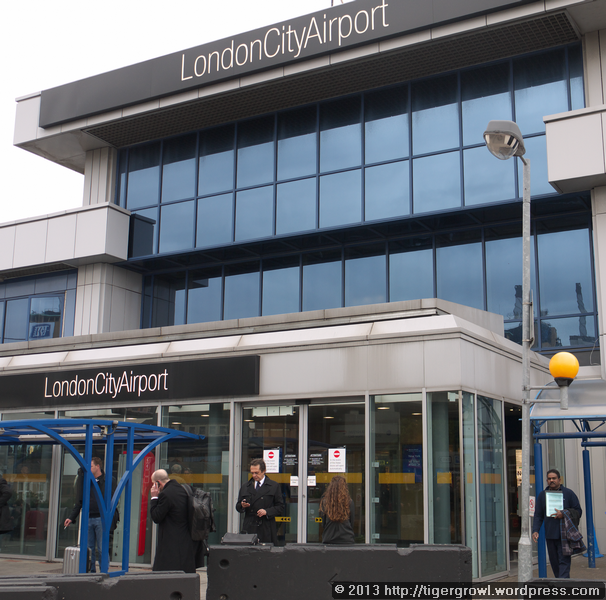 We left Romford by bus and after a roundabout journey arrived at London City Airport. 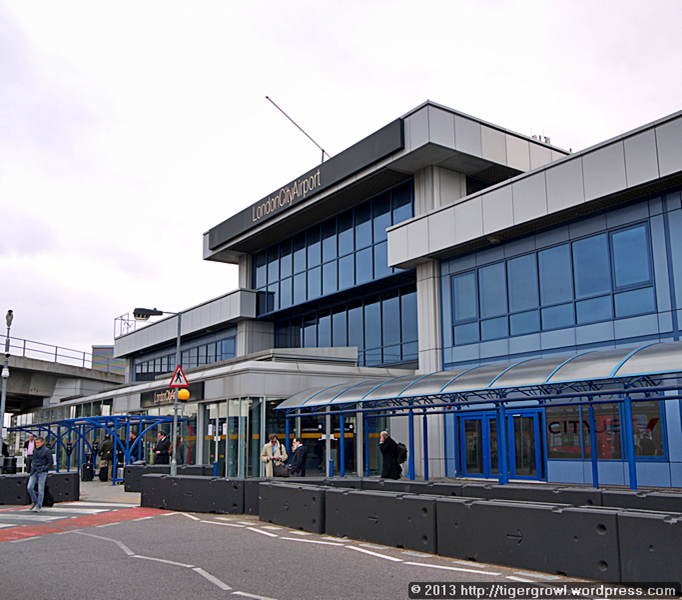 This airport is less well known than, say, Heathrow or Gatwick and, to tell the truth, I don’t know much about it myself. It seems that most of its flights serve the UK and European destinations, though there are also flights to New York (JFK). We went first to the Costa coffee bar in the airport and dawdled there for a while. We didn’t have any plans and waited for something to suggest itself. What suggested itself was to go and watch the planes landing and taking off. It was a simple enough idea but not so simple to carry through. There seemed not to be a viewing platform, at least, not one accessible by the public. We went outside and searched around until we found a viewpoint, not a very good one, but a viewpoint nonetheless, out of the way of people. We started taking photos. Then, guess what happened. Yep, two robots in security jackets came and told us to stop. 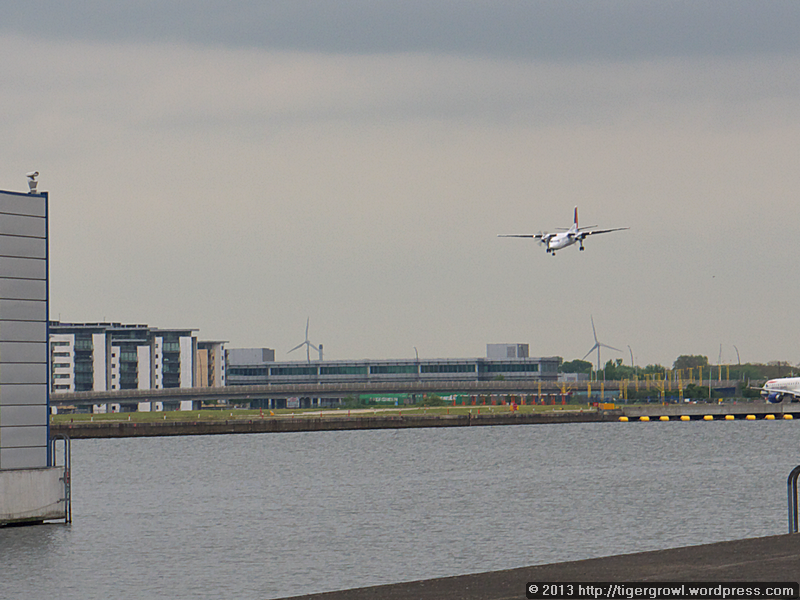 Photography is not allowed within the precincts of London City Airport. My feeling of déjà vu did not reduce my even stronger feeling of annoyance. We were alone in a corner, away from the passage of people and not causing the least obstruction, two amateurs engaging in a harmless hobby. There was no point in refusing to co-operate, however, as this would have merely resulted in our being escorted from the premises. Nor did it seem worth asking the obvious question: “Why can we not take photos?” In my experience the robots don’t know why not. They are told “No photos” and thereafter they simply follow the script. Asking questions merely irritates them because it exposes their ignorance. You meet the same mentality in shopping centres and other places that, though they may appear to be public, are in fact privately owned, meaning that the owner can impose and enforce his own rules with his own private police force and eject you if you do not comply. This is a matter that, in my opinion, is not receiving the attention and concern that it merits because, increasingly, swathes of our land in cities are being incorporated into private fiefdoms where the public are admitted but have to conform to idiosyncratic rules that are nowhere displayed and are discovered only when you breach them. We caught a bus and travelled away from there. I took a photo through the bus window of this figure in Connaught Road that seemed to be expressing the same exasperation that I felt, lifting its arms to call heaven as witness to the stupidity of officialdom. 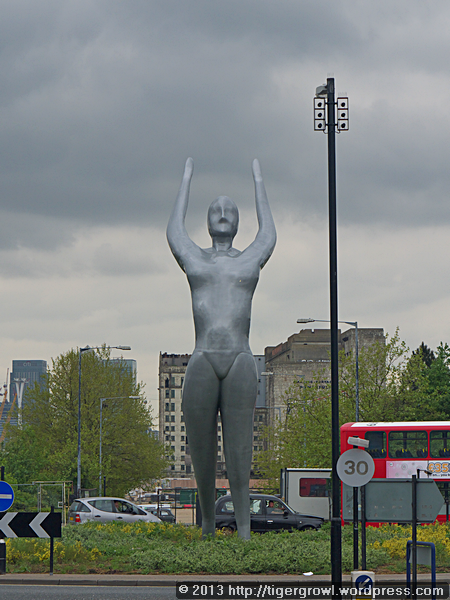 It is not so, however, for this 12-metre high sculpture, by Nasser Azam, is supposedly the Greek goddess Athena. Not that you would ever guess from looking at it. At best it looks like a chubby-thighed woman with a bikini bottom and no top. 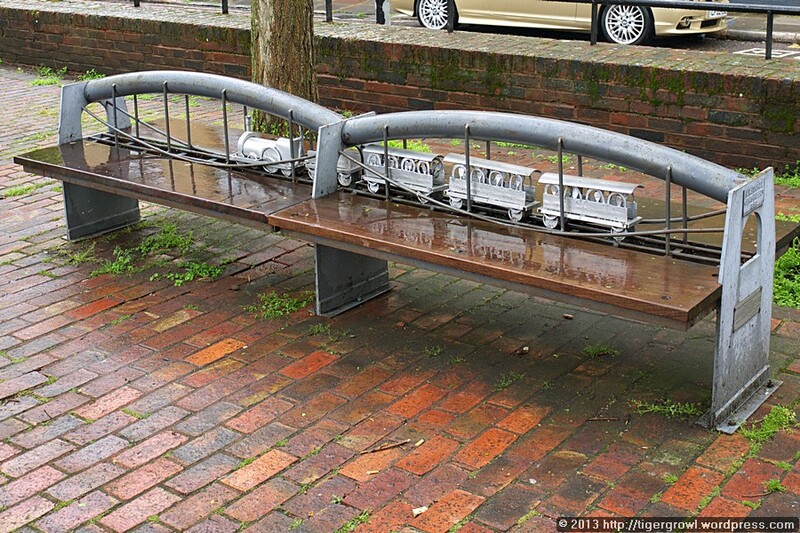 Why do councils and corporations persist in wasting money encouraging this kind of vapid and lazy “art”? 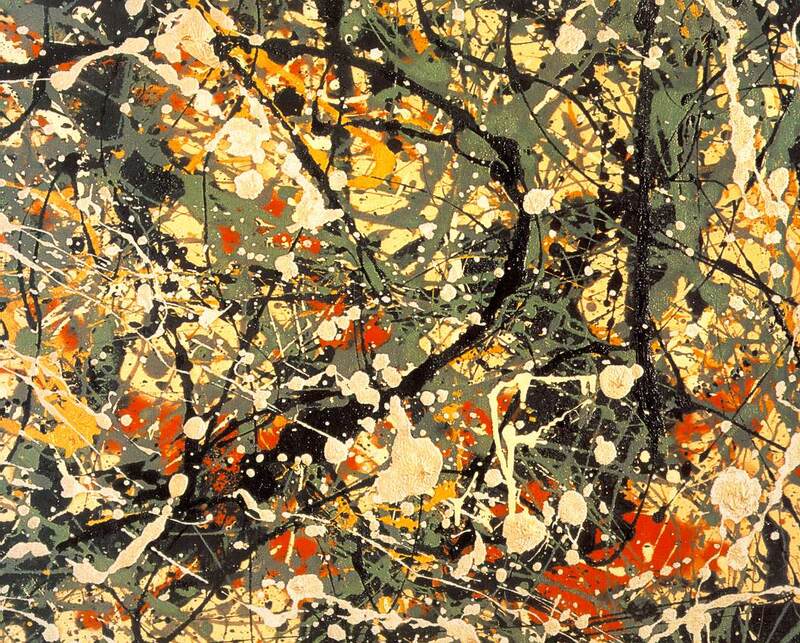 And when will artists learn that just because a thing can be done is not by itself sufficient reason for doing it? We changed buses at Stratford where my mood was lightened by seeing this pretty locomotive, looking like something out of a grownup’s edition of Thomas the Tank Engine. 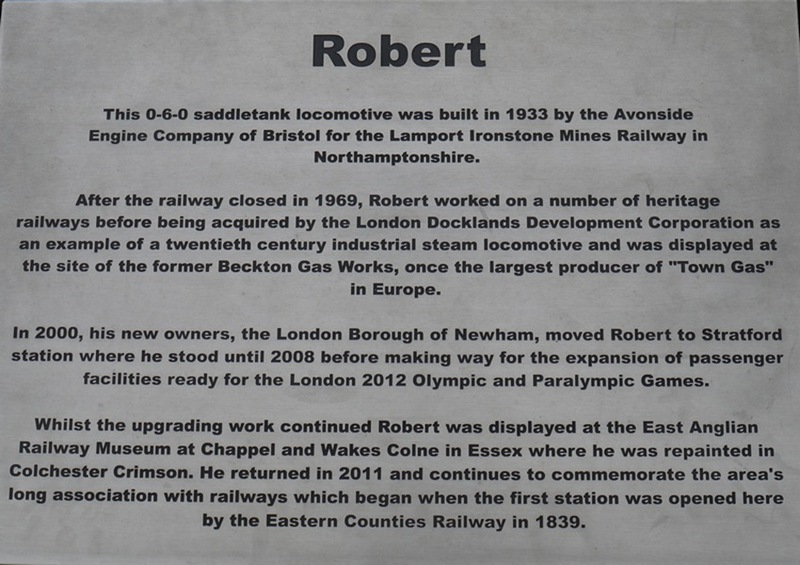 It’s not every day that you meet a locomotive called Robert. 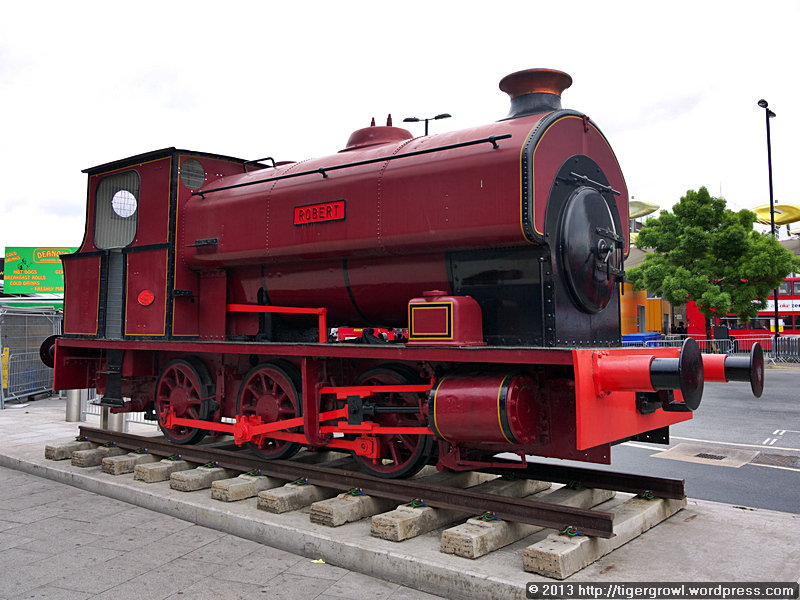 This one is a 0-6-0 saddletank locomotive (I hope that means more to you than it does to me) built in 1933. You will find more details here. Travelling on from Stratford, we changed buses once more at Bow Church and this final bus carried us back to the Angel. If the day had produced some frustrations, it had at least acquainted us with the town at the Broad Ford on the spuriously named River Rom, though whether we shall ever return there is not at all probable. 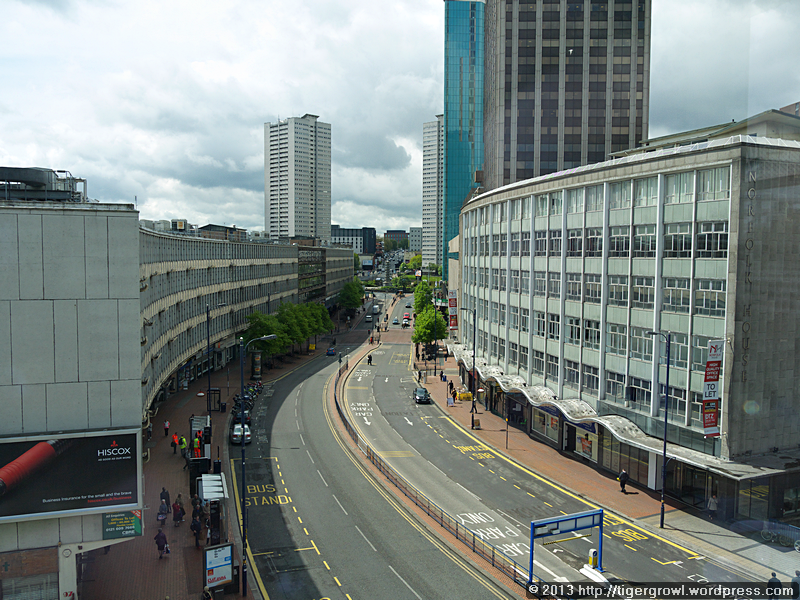 Today we are going to Birmingham to meet a friend and to have a short look around the town which we have of course visited before. 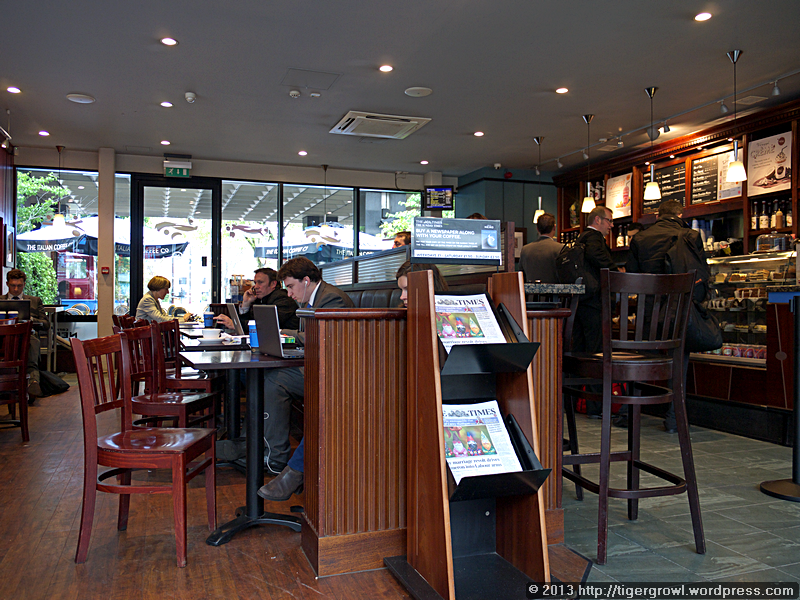 We had breakfast at Euston station and then took the 10:13 train to Birmingham. I took this photo along the way though I’m not sure why. Perhaps I was trying to capture the feeling of speed. 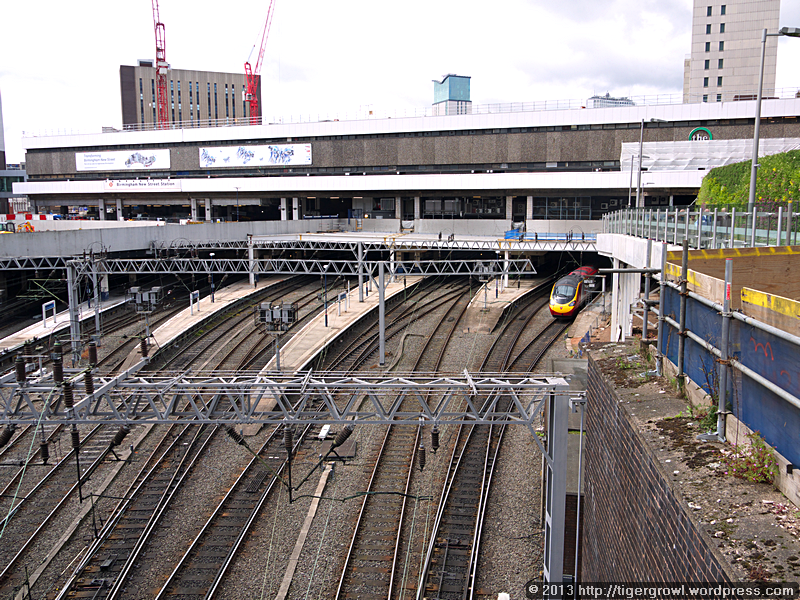 We disembarked at Birmingham New Street station and made our way towards the Bullring where we were to meet our friend. On the way, we encountered this cylindrical building. It is known, reasonably enough, as The Rotunda. Designed by James Roberts, it was completed, to a revised design, in 1864-5. It has already been awarded a Grade II listing. As we were meeting someone, we could not wander about in our usual way but had to go straight to the meeting point. 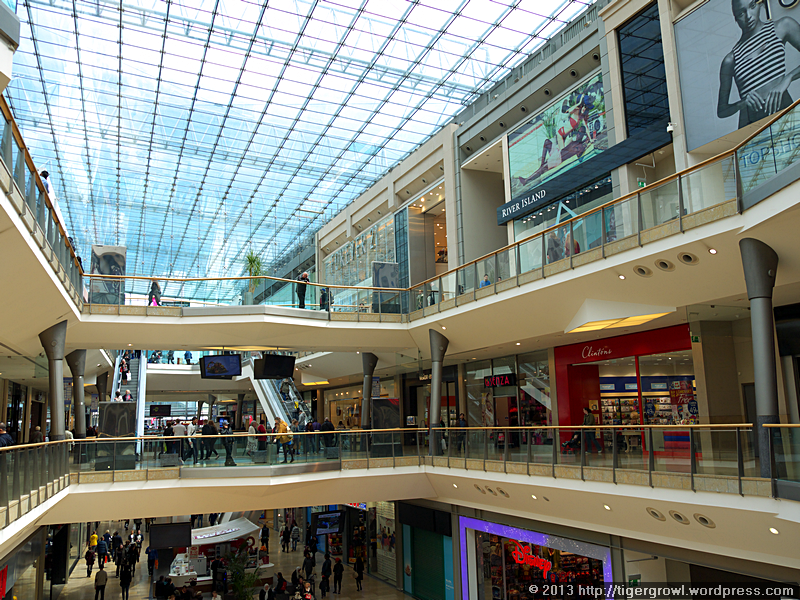 We made our way to the massive Birmingham Bullring shopping and leisure centre and waited in one of the cafes there. Our high position gave us a bird’s-eye view across the city. Even here, though, the view was not infinite but was enclosed by buildings even taller than the one we were in. Between the high-rise buildings, the streets were like narrow canyons, divided into zones of bright sunlight and deep shadow. From here, the cars and people were so small you might have been looking at a model. After lunch, we went to visit the Back to Backs, the only surviving example of a once common type of housing. Built in the early 19th century, the Back to Backs, so called because the houses backed onto a common courtyard, provided no-frills two-room accommodation for the poor working class and small skop-keepers. People continued to live in this corner block until 1967 and after after that, the shops continued in use for a while. All other examples have been demolished but the National Trust obtained this one and restored it to show what life was like for the inhabitants at various periods during its existence. The fronts of the building were occupied by shops and entry to the houses was gained by going around the back to the courtyard. 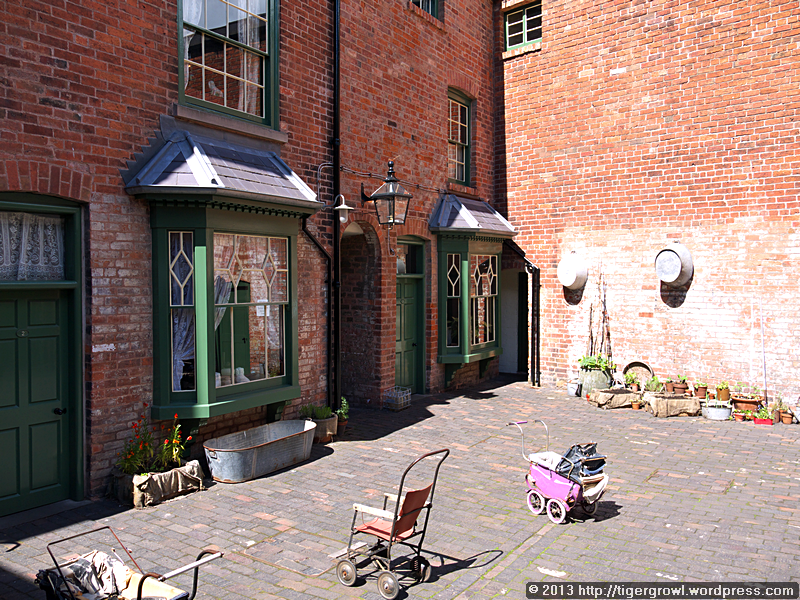 This view shows what the courtyard looks like today, clean, tidy and in “museum condition”. When in normal use, it would have been a different story. Poor drainage and the need to dump rubbish would have made it smelly, dirty and a source of disease. Whose turn to empty the bucket? In the yard were three communal toilets. 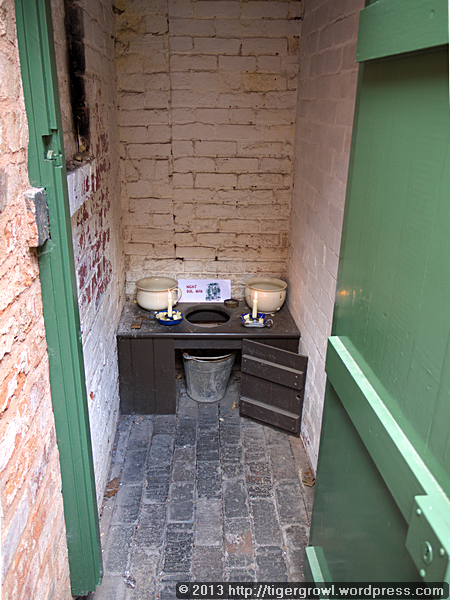 Residents would have to come out to them in all weathers… or use chamber pots indoors. There was no flush system and the waste was collected by the night-soil men. There was no proper drainage and children would have played around the midden at one end of the yard. More information may be had here and here. 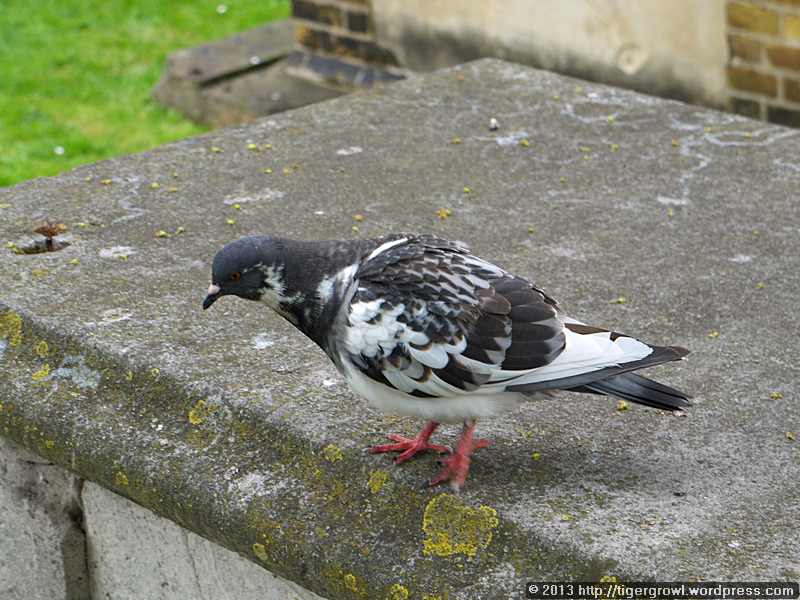 Our friend had business to attend to so we parted company with him and did a little exploring on our own. 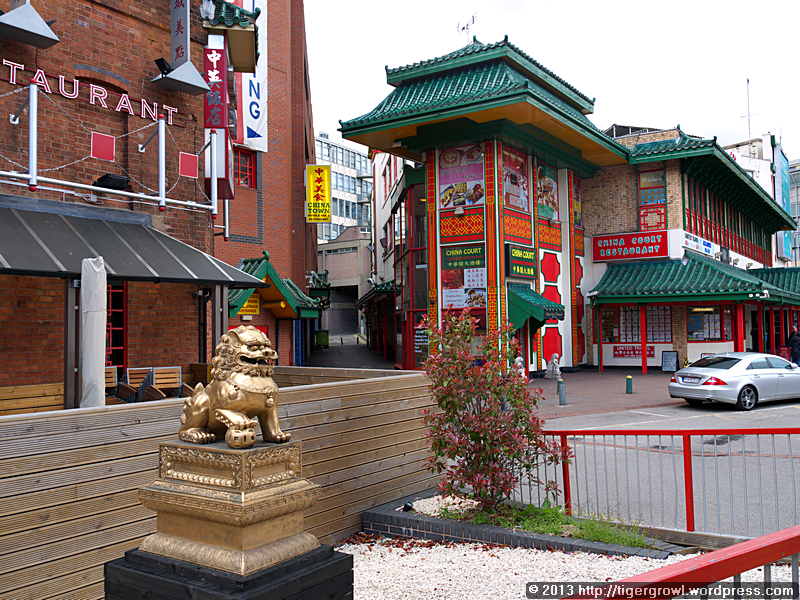 We passed by the gates of Chinatown and a Chinese restaurant with a pair of golden Chinese lions in front of it. At first sight, the lions seemed symmetrical and then I noticed that each lion holds something different under its paw. Apparently, this is traditional: the male lion has his right front paw on a patterned ball, while the female uses her left to restrain a playful lion cub. 365 air raid alerts and 77 actual air raids. These raids took place between the 8th August 1940 and the 23rd April 1943. There were over 9,000 casualties of whom 2,241 were killed. 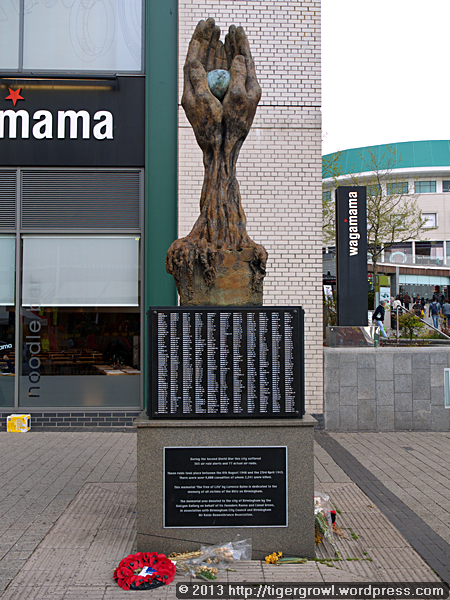 memory of all victims of the Blitz on Birmingham. 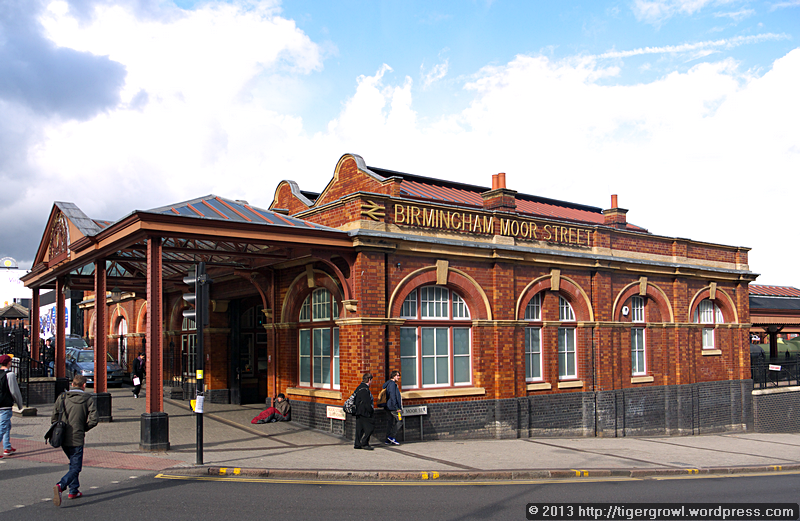 On our way back to Birmingham New Street station to take a train back to London, we stopped to admire this pretty Edwardian station, Moor Street. It was built by the Great Western Railway and opened in 1909. 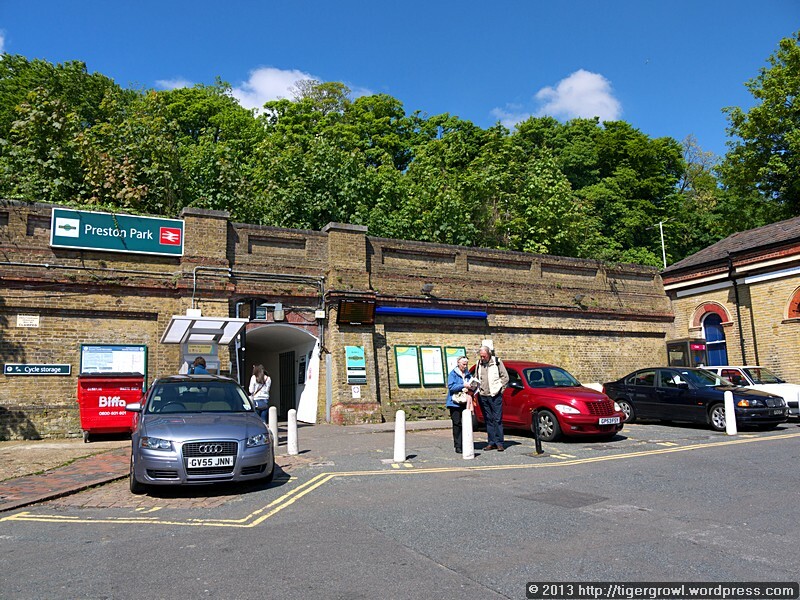 The station was closed in 1987 by British Rail who built a modern station to replace it. However, it was to gain a new lease of life when it was restored and opened again for service in 2003. I hope this beautiful little station will continue for many years to come in the role for which it was designed over a century ago. A sight to set steam locomotive enthusiasts’ hearts a-flutter was this engine parked at an unused platform. 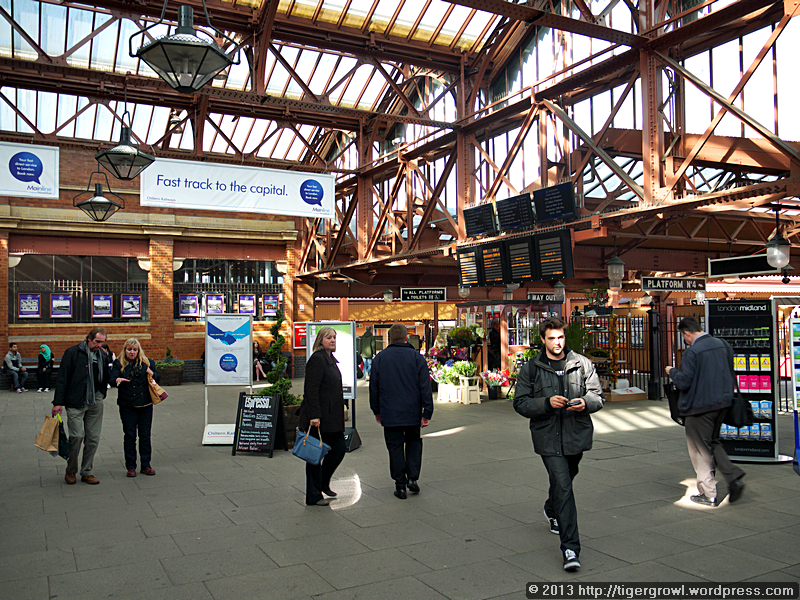 It had come to be a familiar sight to commuters passing through the station. It turned out that we were lucky to see it as soon after our visit, it was removed. The sad news is that it will not be returning. 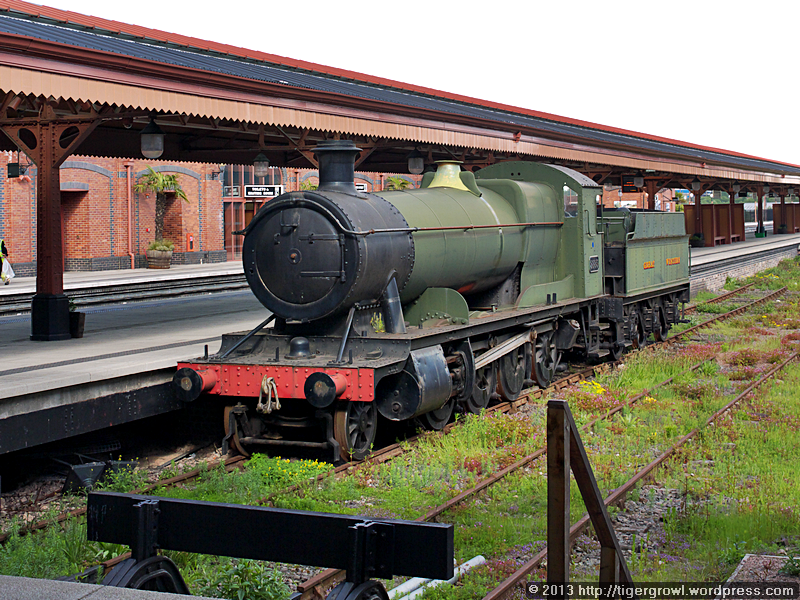 The happier news is that it is being restored and it is hoped to put it into use on one of Britain’s heritage railways. I am sure that the thought of the loco merrily puffing away at the job it was made for will be some compensation to those who miss it. The aforementioned enthusiasts might like to know that the loco is a GWR Class 2885 2-8-0 freight engine and was built in (I think) 1938. 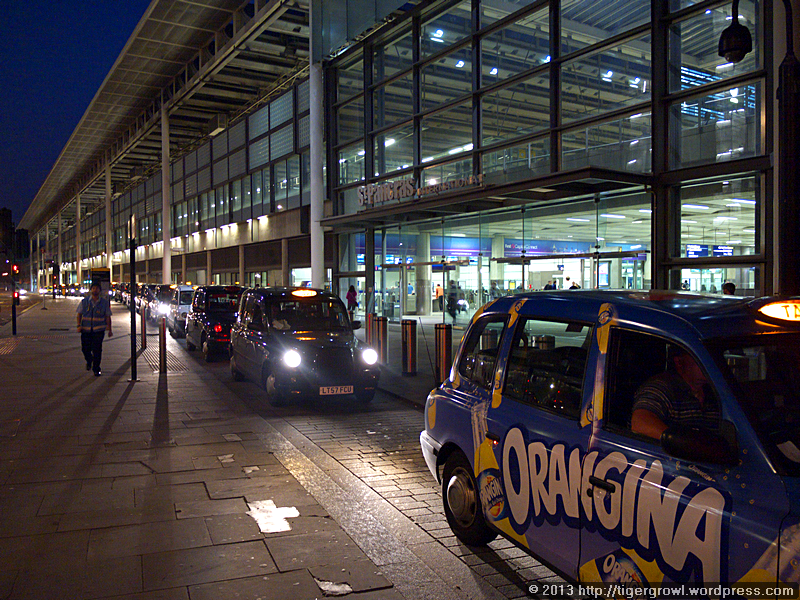 We did not have far to walk to reach New Street station and to catch a train home. 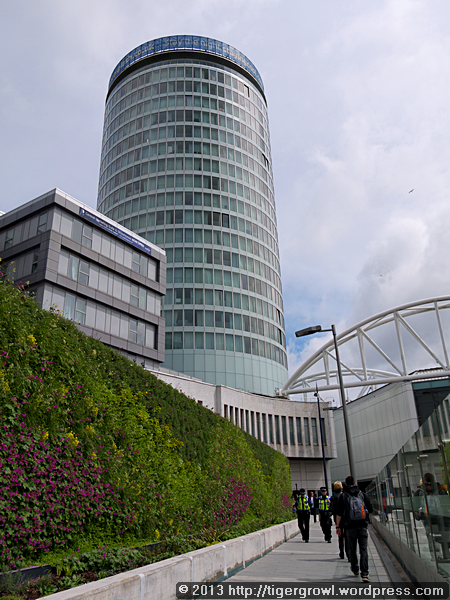 This was quite a short visit to Birmingham but we managed to see some interesting sights and I am sure that we shall return in the not too distant future. 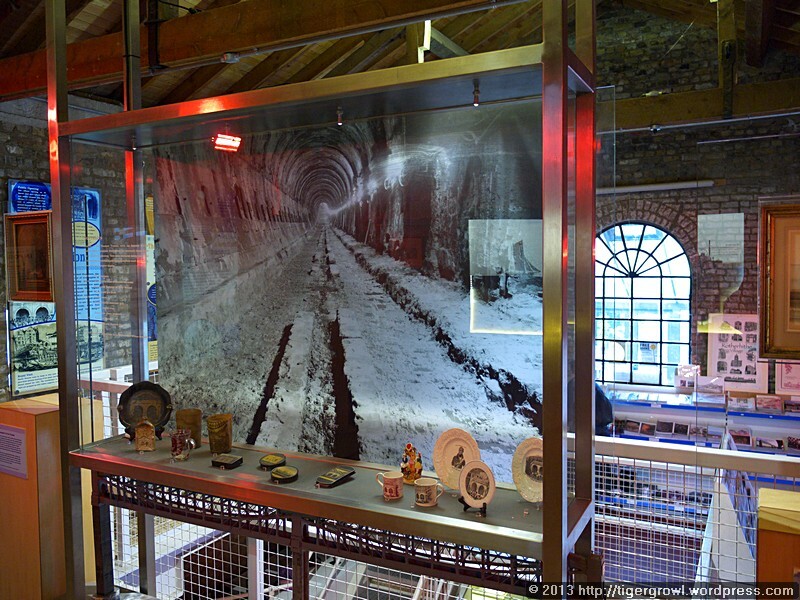 Today’s jaunt started with a trip to Rotherhithe to visit the Brunel Museum. On our way there, I took the above photo in the maze of streets in the City, which are overshadowed more and more by taller and taller buildings. 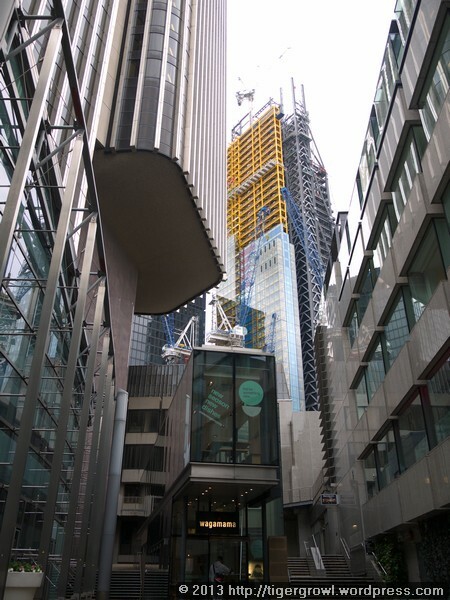 Surely I cannot be the only person to be alarmed as London is transformed into a claustrophobic jungle of ugly buildings whose nightmarish designs conform neither to canons of beauty nor to intelligent practical ends. Though we mould the environment, the environment just as surely moulds us and our attitudes, and I fear for our future where our minds are warped by such inhuman surroundings. 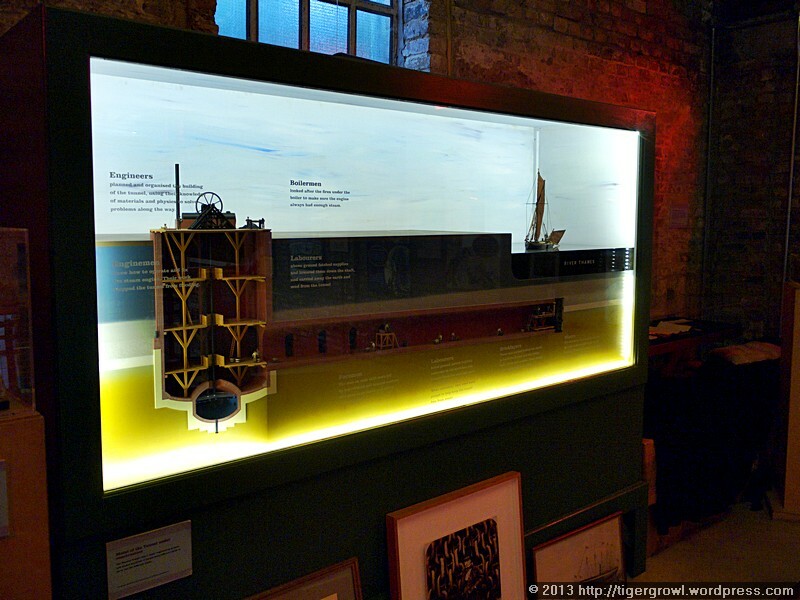 The Brunel Museum, Rotherhithe, is sited in the Engine Room built by Marc Isambard Brunel (father of the perhaps even more famous Isambard Kingdom Brunel) as part of his project to dig a tunnel under the Thames. The history of this bold venture, attended as it was by several near-disasters, is well enough known but you can refresh your memory from the History pages of the Museum’s Web site. As you can see, we were allowed to take photos but the low light levels sometimes made photography a little difficult. 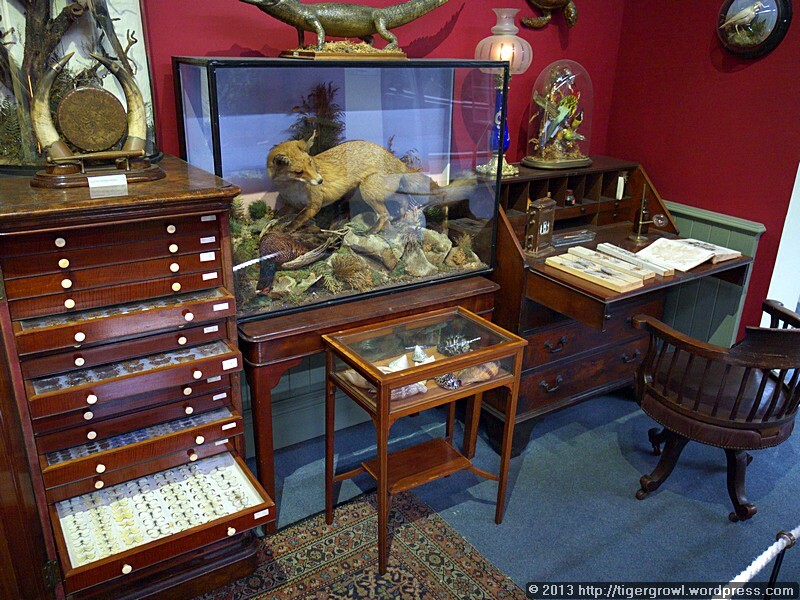 I am not sure whether flash is allowed but it obviously doesn’t work where your exhibits are in glass-fronted cases! You can display pictures taken at the time and contemporary artifacts. Where a lot of precise information need to be put across, you can fall back on posters and information boards, though these, no matter how interesting the material and how imaginative the fonts, colours and layouts, can be tedious to read, especially when there are many of them. A film usually goes down well, especially if it is well made and contains lots of action. 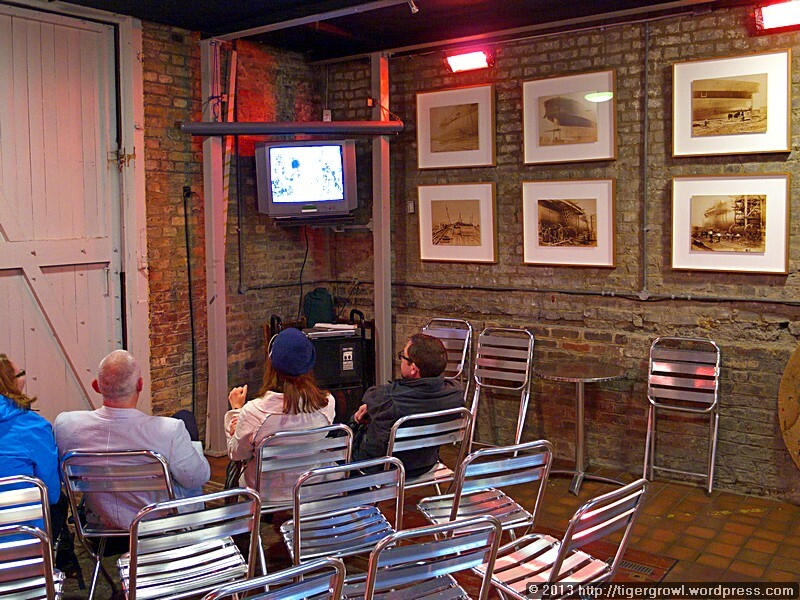 For this, though, you need a decent-sized screen and comfortable seats. I think there is some room for improvement here. The building is, by its nature, tall and narrow, and an open-plan arrangement has wisely been adopted. The place is small enough to be overseen by a single curator though if it becomes busy, he might have his work cut out. 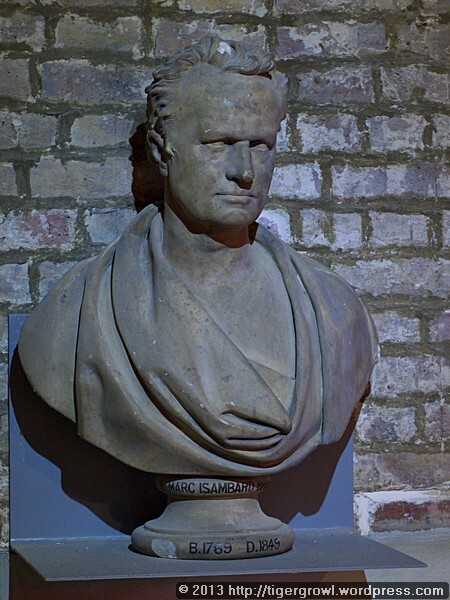 There is a bust of the master engineer, Marc Isambard Brunel, placed so that he seems to gaze thoughtfully upon all three levels of the museum. And well he might, for this is, after all, where he carried out his innovative work. The museum, though small, has a cafe. This too is small and looks more like someone’s kitchen. 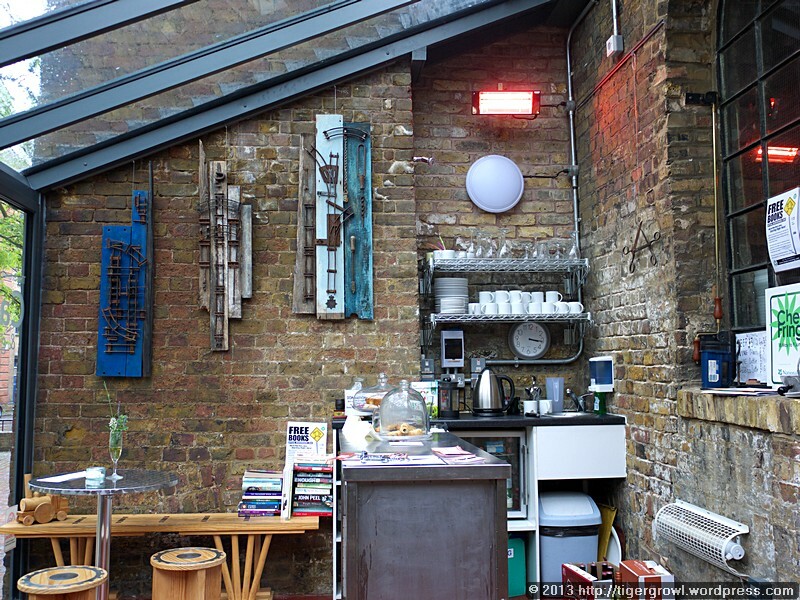 If you have untidy friends who invite you into their kitchen you will have an idea of this cafe. It is friendly and informal. One reason why I said that the curator has his work cut out is because he also has to serve you your drinks in the cafe, or at least, he did when we were there. On the cafe wall there were works of art and some (maybe all of them) were for sale. I don’t recall the artist’s name but they were made from salvaged materials, tools and components from a model railway set, all vaguely relevant to the theme of the museum, I suppose. Out in the museum’s garden, the bench is not just a bench. 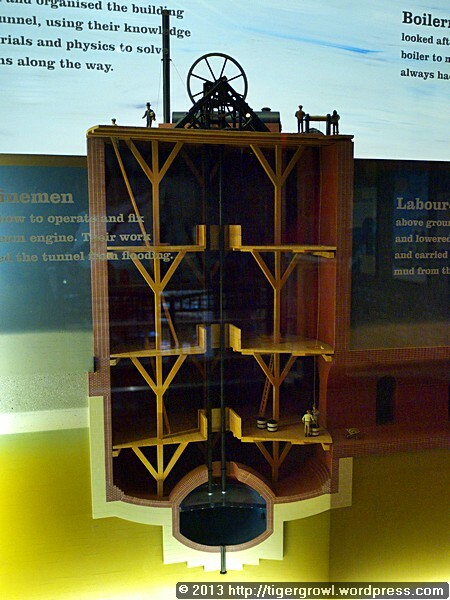 It is also a model of the Royal Albert Bridge, built in 1854-9 by Marc’s son, Isambard Kingdom Brunel, to carry the railway across the Tamar River into Cornwall. The accompanying plate tells us that it was built by MONSTER CREATIONS and children from Bermondsey and Rotherhithe (2009). After visiting the Brunel Museum we went to Canada Water to have a look at its public library. We had passed this a few times and wanted to take a look inside. In was opened in 2011 and was designed by CZWG Architects. 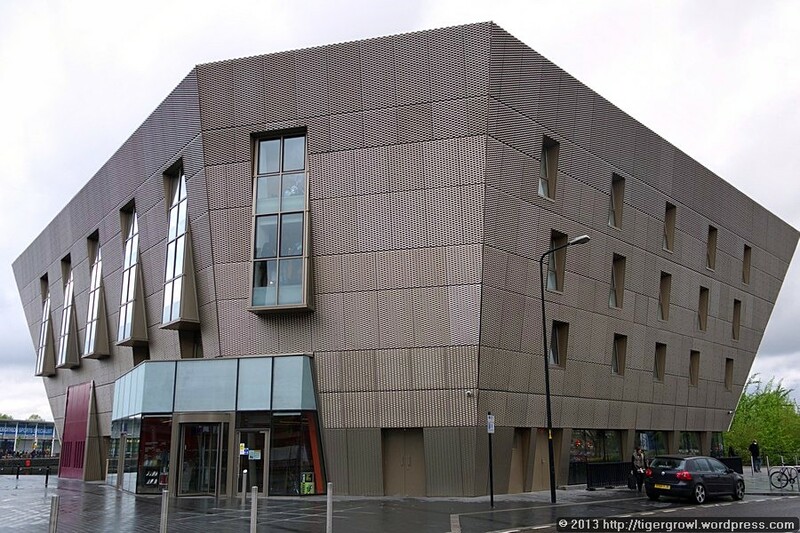 I don’t think anyone could claim it is a handsome building – it looks rather like a gigantic DIY garden shed – but, then again, I suppose it is not as mind-chafingly ugly as some modern constructions. What was it like inside? First impressions were favourable. I used to work in public libraries, remember, and am practised at seeing the virtues and faults of library layouts from both the staff’s and the users’ points of view. 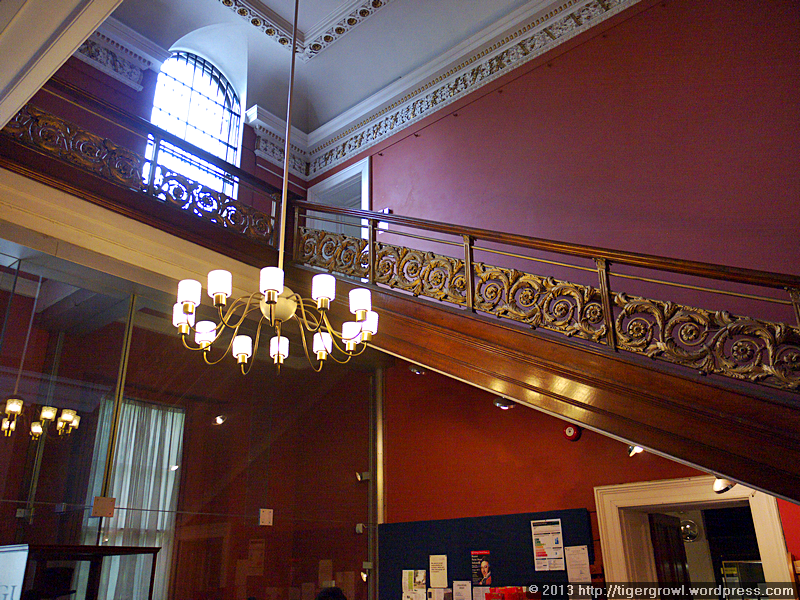 The library has two floors supplemented by a gallery running around the walls above the first floor. The open plan aspect gives a light and airy feeling but the placement of tables and workstation benches ensures reasonable privacy. In libraries, the height of the free-standing bookcases is always an issue. In older libraries, these tended to be high. While this might induce a feeling of insulation from the outside world and provide more room for books, it leads to practical difficulties such as children or the elderly not being able to reach the upper shelves. Chest-height shelves, as here, give a feeling of spaciousness and light but reduce the available storage space. Planners also forget that the elderly cannot always access the lowest shelves. There is no perfect answer to this, really. You just have to make your choice and stick with it. The combination of standing shelves and free space seems to work quite well in this library. 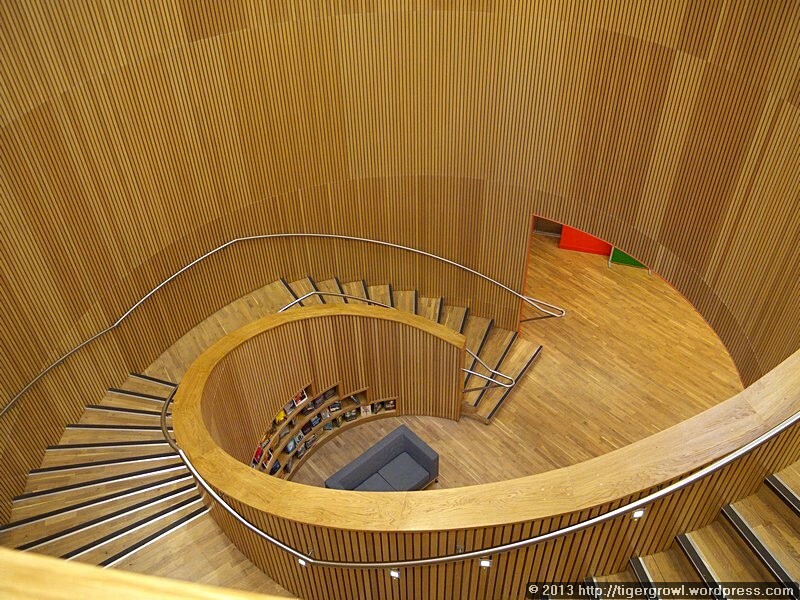 A feature of the library is the broad spiral staircase by which you travel between the ground and first floor. (There are also lifts.) It is lined with wood and is light in colour, altogether very striking. 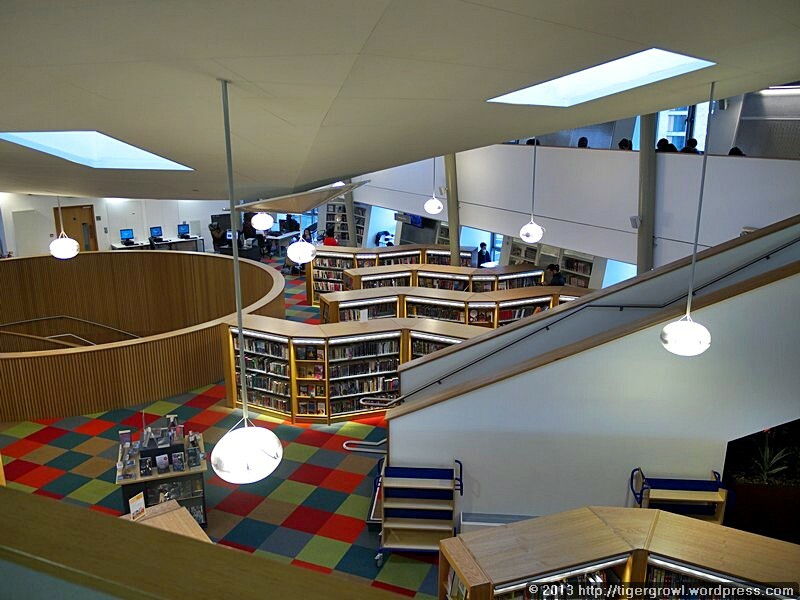 We spoke to a member of staff who said she liked the library and enjoyed working here. In a period of financial stringency when councils are forced to cut expenses, libraries are tempting prey for cost-cutters. We must do our best to ensure that good libraries like this one survive and continue to meet the needs of their communities. As needs change, libraries must change to meet them. 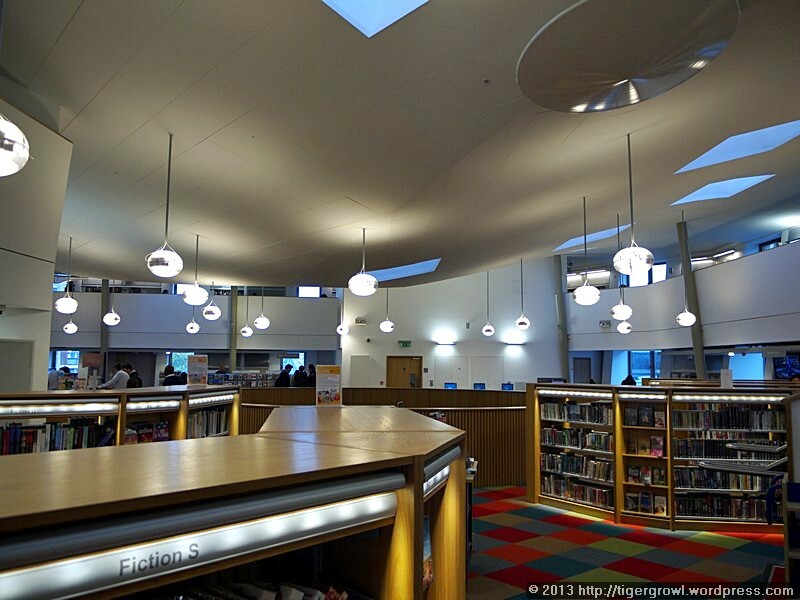 They are capable of doing so and, in fact, public libraries are often in the vanguard of change, not lagging behind. When you are busy working with books or computer, you will from time to time find yourself staring out of the window. There is nothing wrong with this and, in fact, it is a good thing as it provides space for resting your brain and collecting your thoughts. The height of this library allows distant views, something that has a restful and calming effect, I find. Inevitably, some views will be of the nearby buildings. Some views, though, overlook Canada Water itself and, while juggling weighty concepts in your mind, you can watch the ripples in the water, the reflections of the clouds and the coming and going of water fowl. 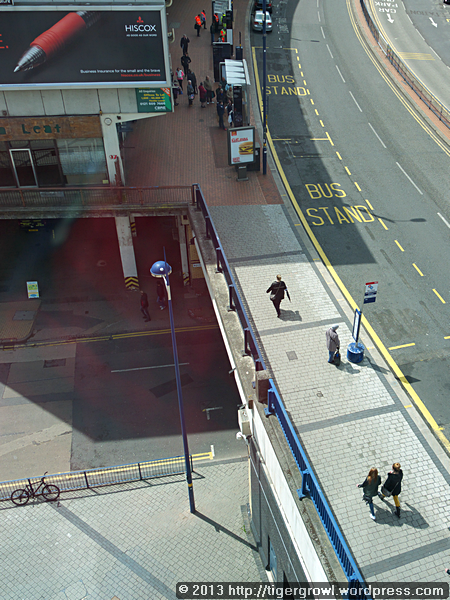 We caught a bus at Canada Water bus station and then changed buses on Waterloo Bridge beside the Southbank Centre. My last photo of the day was this one of the green sculpture. I don’t know what the title is, if it has one, or what it is intended to convey. It is by Pirate Technics, and if you want to know more about it, you might find clues on their Web site. 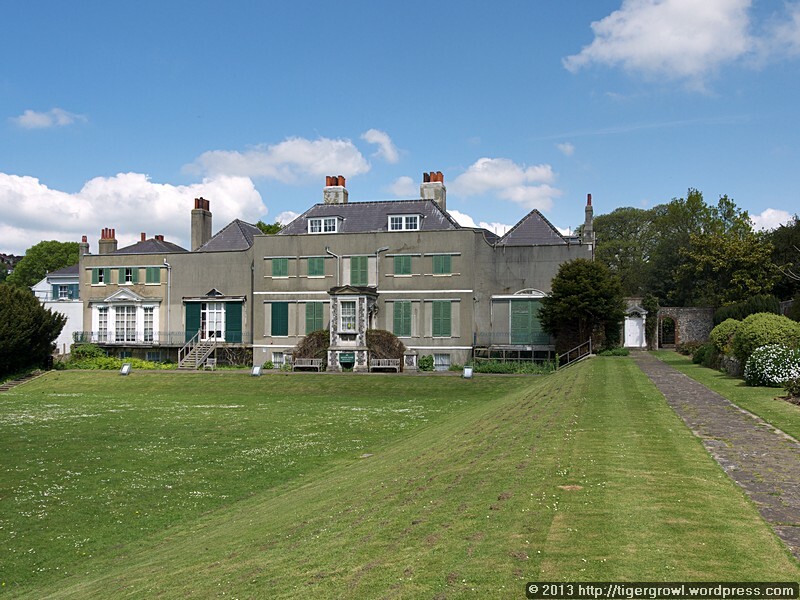 Our plan for today was to travel down to the famous seaside resort of Brighton and visit Preston Manor, an historic family home that was gifted to the city and is now one of its beautiful museums. Strange as it may seem, although I lived in Brighton until I was 19 years old, I never went to see the Manor. Time I caught up! 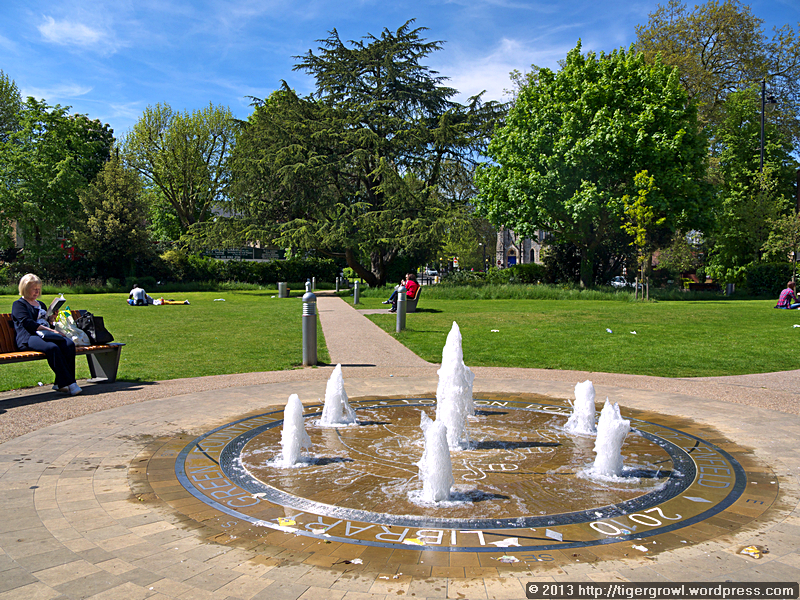 Preston Manor is set in one of Brighton’s finest parks, called Preston Park. 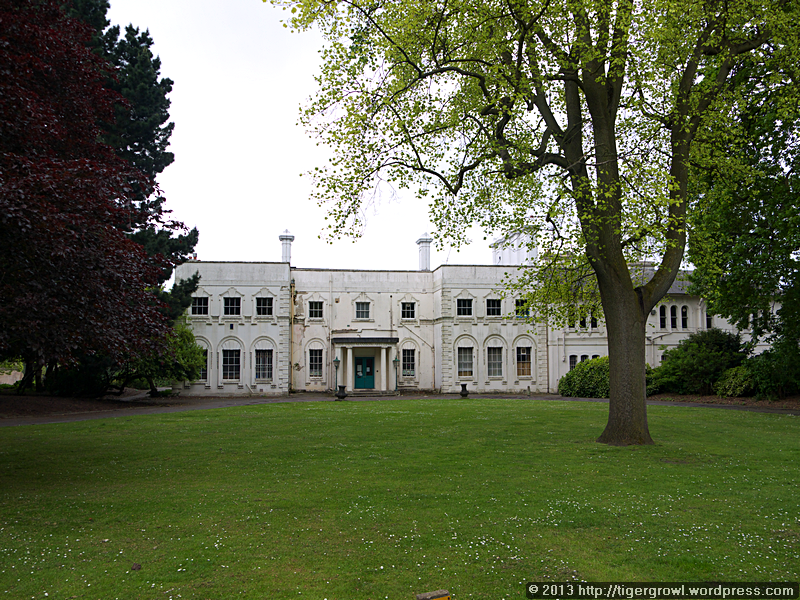 If the names suggest a connection to you, then you would be right: Preston Park once formed part of the grounds of the Manor. 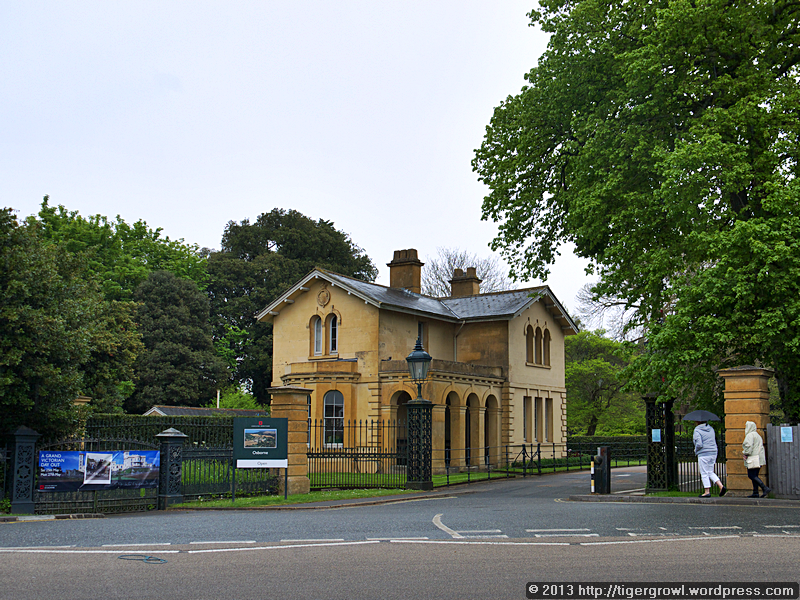 Just before the London train enters Brighton’s main station, it passes through a smaller station called Preston Park and this, as you might guess from the name, is the best place to alight for the Manor. 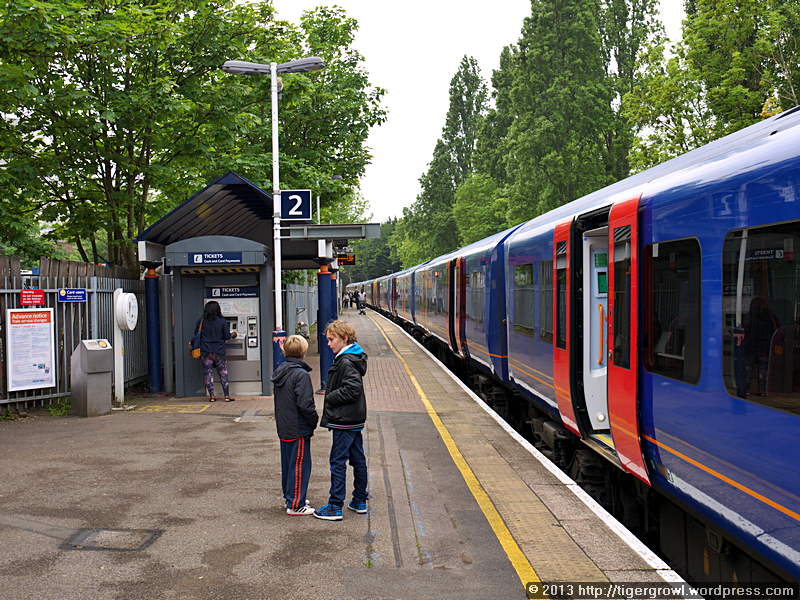 Not all trains stop here, however, so you need to check the timetable. Very close to the station is this clockmaker’s shop which I always look at with interest, given that I am fond of old clocks. Also, not many such businesses still survive in our modern world. We usually come here at the weekend when the shop is closed so I have never been inside but I did find this interesting little video, The Horologist, about the shop and the present incumbent, Bernard Williams. I fear that this clock shop, too, will close in the not too distant future, taking with it both its history and the now rare skills of the horologist. The Manor is within easy walking distance of the station (just follow the signs) and you enter through the gate pictured above into the grounds. This is quite a good way to arrive because the house is at first screened from view by the foliage and then suddenly appears. The word “Manor”, I think, conjures up images of something ancient, perhaps Gothic in style, so when I arrived at Preston Manor, I was surprised at its modern, somewhat Art Deco, appearance. One must remember, however, that although the Manor, as both a house and an institution, goes back centuries, it was a family home until the 1930s and during that time underwent repair and modernization. When was it last used for its intended purpose? On the front lawn this object still stands. 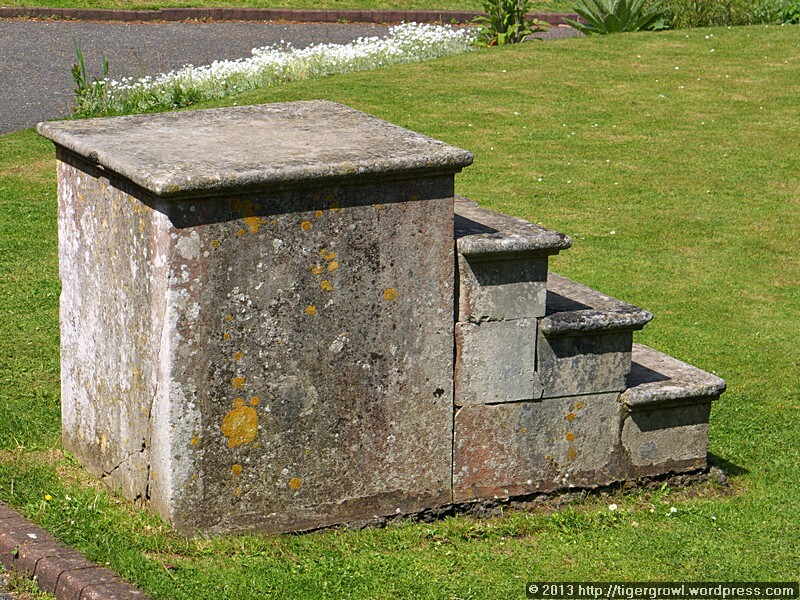 It is a mounting block to help riders mount their horses. It would once have been pressed into regular service but when was the last time, I wonder, that it was used for its intended purpose? You will be expecting me to describe our visit to the Manor and the beautiful and interesting discoveries that we made within. That is a quite reasonable expectation and I am sorry to disappoint you as we were ourselves disappointed. It turns out that Preston Manor is closed to visitors on Saturday! Closed on Saturday, of all days of the week! The one day, apart from Sunday, when most people would want to come and visit it. I don’t know what genius made that decision but I suggest it should be reviewed and quickly. 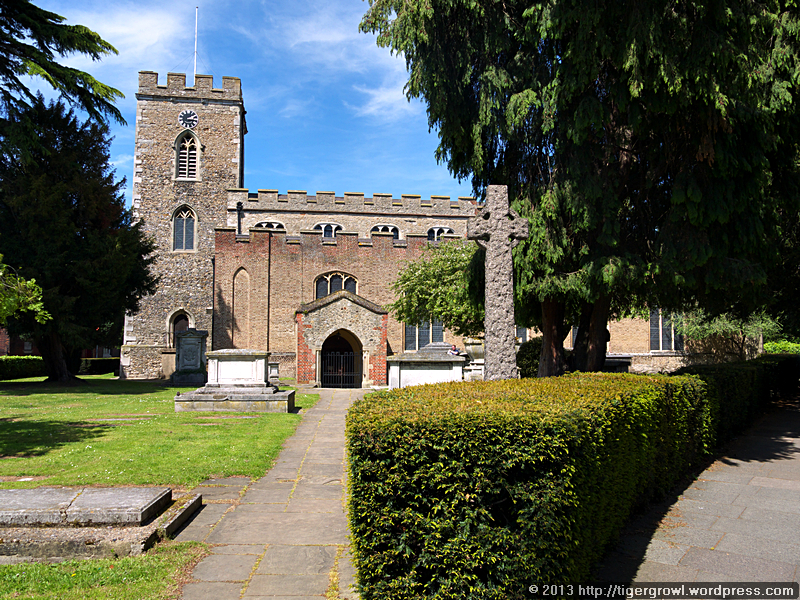 Close to the Manor, so close as to be in a sort of symbiotic relationship with it, is the ancient Church of St Peter. 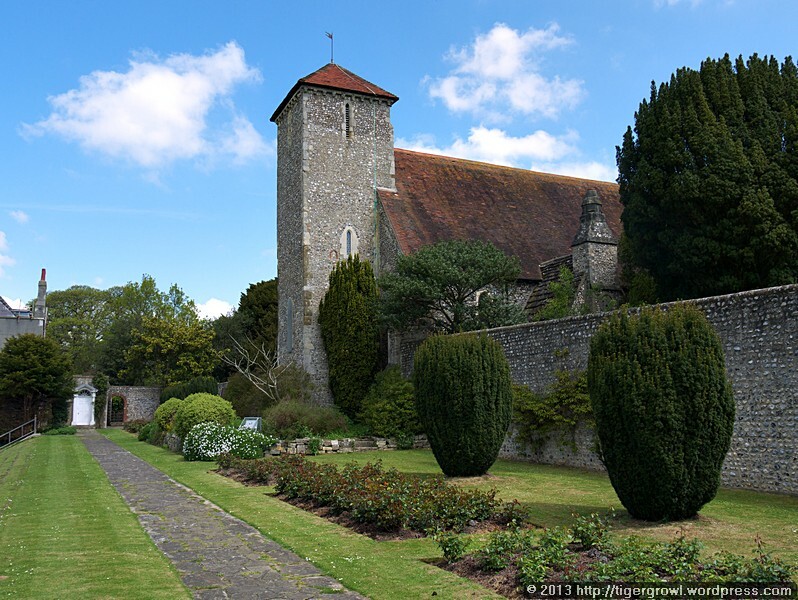 Unlike the Manor, which is now a museum, the church, which originates from the 14th century, is still functioning. 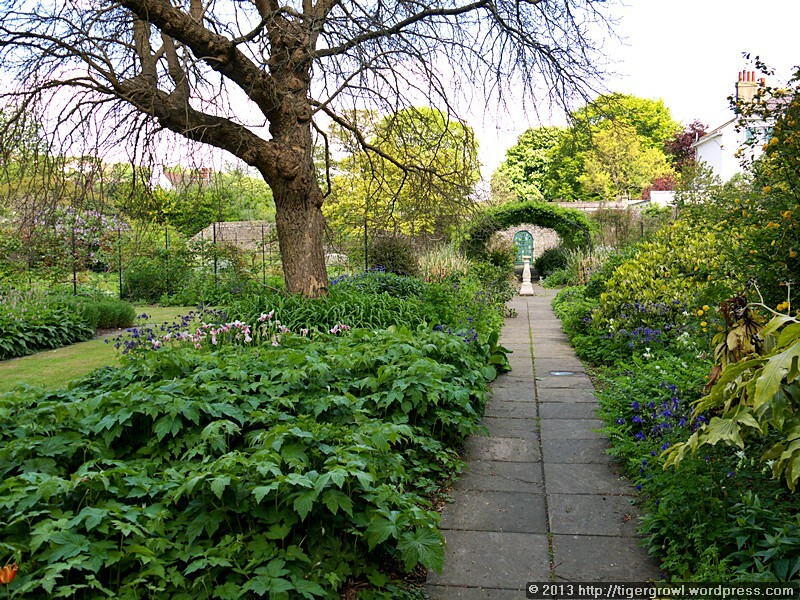 The Manor stands in its own grounds but a part of these has been set aside as a beautiful and well tended garden. 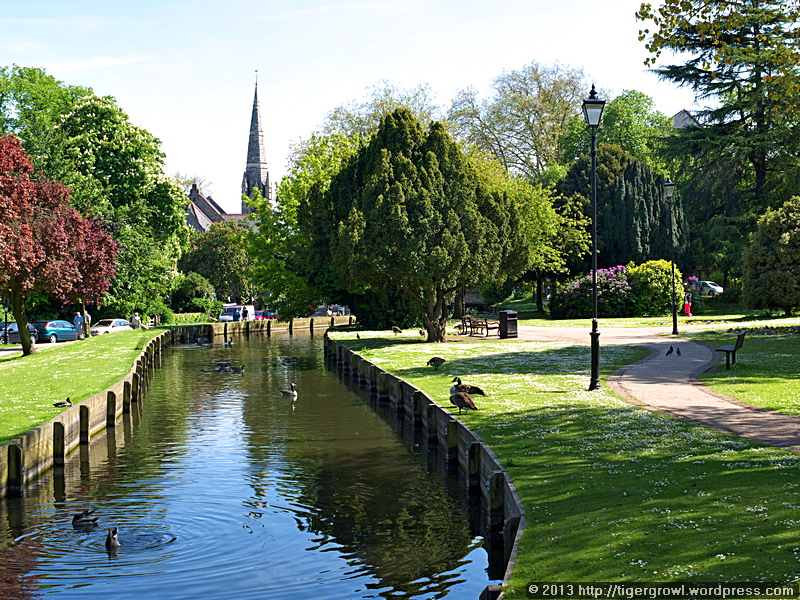 It is a delight to wander here or to sit and take in the peaceful atmosphere. It is open separately from the Manor and we were therefore able to explore it before moving on. We will come back to visit the Manor itself when we can arrange a day. Knowing me as you do (assuming you have been reading my blog), and my love of animals of all kinds, you may be surprised to learn where we went next, namely to the Booth Museum of Natural History, a collection of stuffed and preserved animals, birds and insects created in the Victorian period. As one who regards taxidermists and “collectors” with horror, such a museum is the last place you would expect to find me. When I was a child in Brighton, I loved visiting the Brighton Museum and would always drag my mother there whenever we went anywhere near. 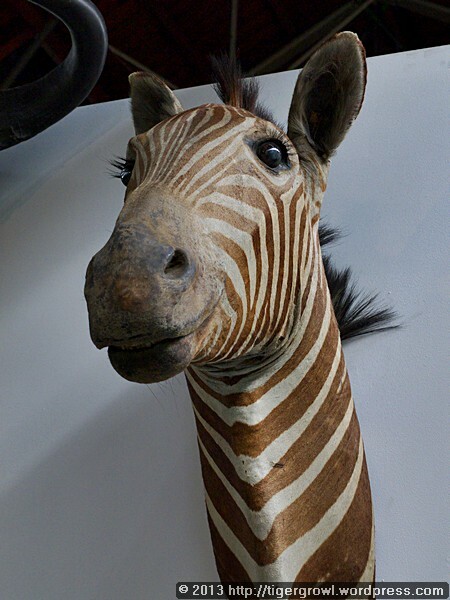 Despite the existence of the dedicated museum of natural history (which I never visited as a child, strange to say), the Brighton Museum had its own collection of preserved animals and these were my favourite exhibits. As a child, I had no conception that these were dead creatures. To me, they were “the animals”, and I went to see them whenever I could. Years later, when I returned to Brighton on a visit, I went to the museum, hoping to see “the animals” again, only to be told they were no longer there but had been moved to the Booth Museum. For this reason, I went to see the exhibits of the Booth Museum, whatever I might think of such displays with my adult moral sense. Edward Thomas Booth (1840-90) was a “gun-toting Victorian” (to quote David Bellamy) but he was also interested in what we would today call “the environment” and he would probably have referred to as “nature”. To the Victorians, nature was an inexhaustible resource, an bottomless store of minerals and living creatures that could be ransacked without let or hindrance and never be exhausted. 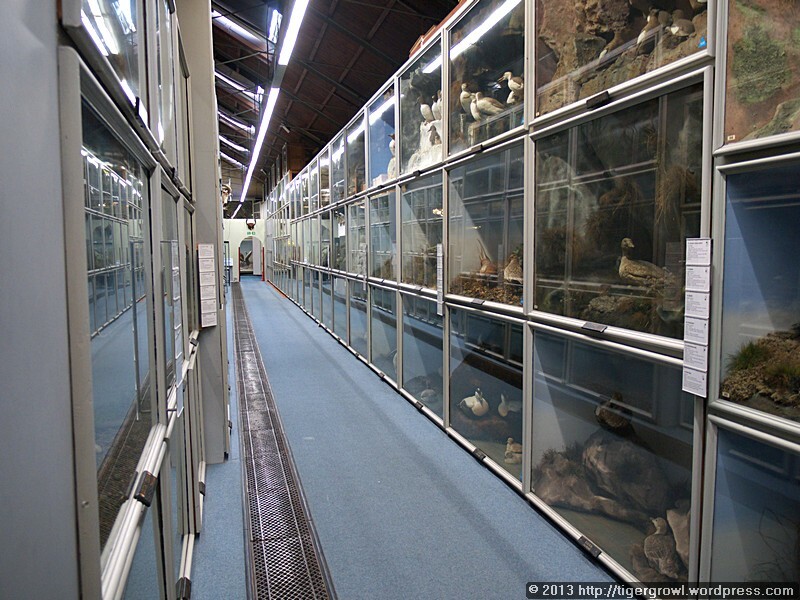 Many great collections, some scientific (like that of Charles Darwin) but many more of them private, were started in this period. 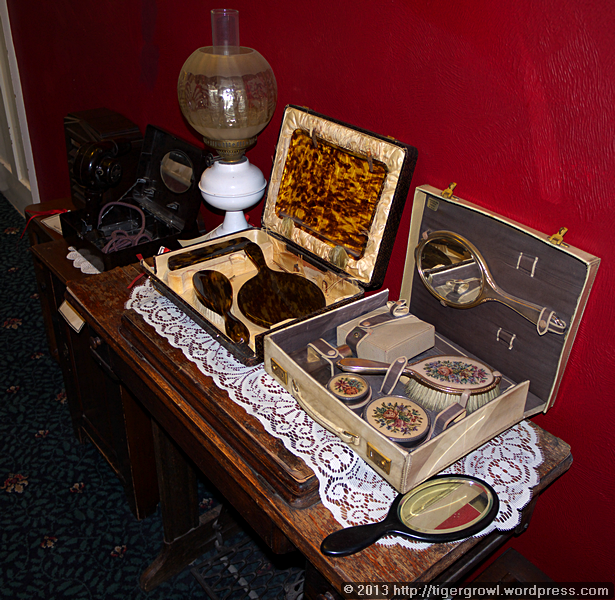 Booth set to with zeal and passion and his treasures soon exceeded the space available in his house. To house his collection, he therefore built the Grade II listed museum that still today serves its original purpose and that he inaugurated in 1874. 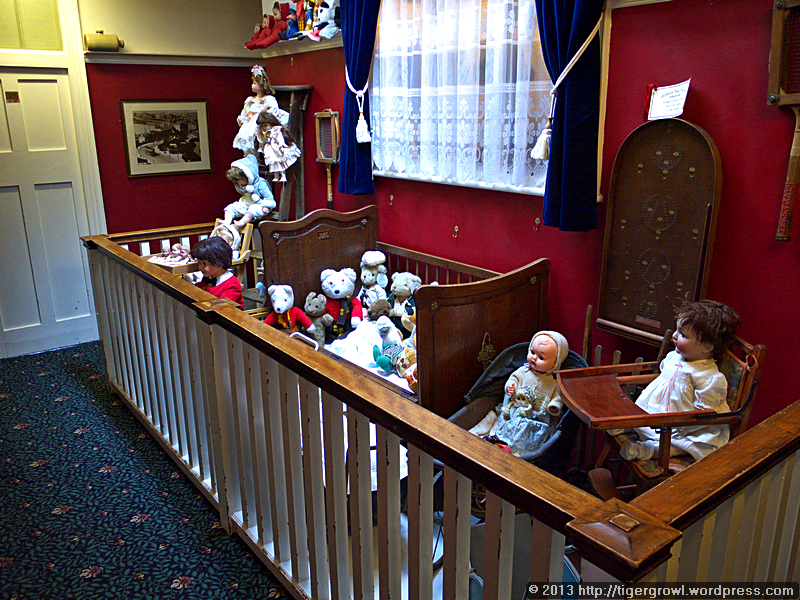 If I had thought that the magic wrought by childhood innocence might illumine today’s visit, I was disappointed. I am glad I went but I am unlikely to go again. With the scales gone from my eyes, I saw only dead animals, set in rows, pinned to boards or arranged in gruesome “lifelike” poses. Their natural beauty at times shone through but with a dimmed lustre. 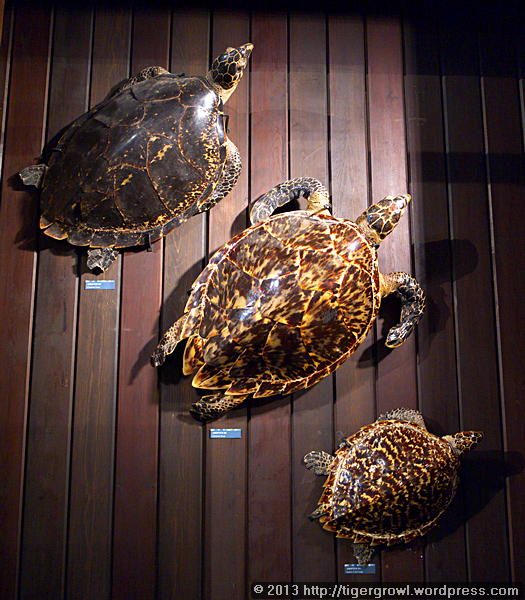 Preserved animals suffer the same wear and tear as any items of human property and many of the creatures here displayed showed scratches, cracks and worn patches. 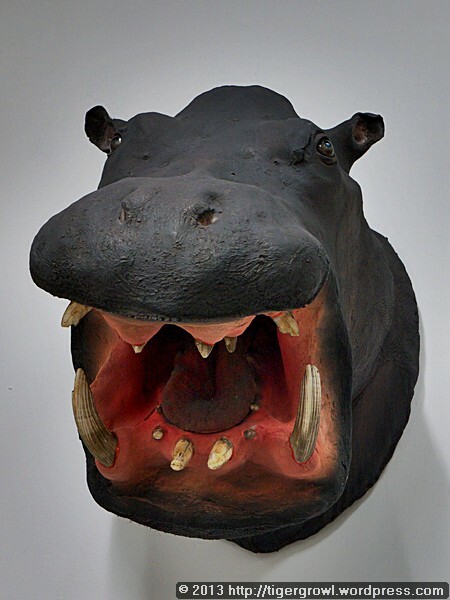 Booth sought to create lifelike scenes consisting of one of more animals in a simulacrum of their natural environment and obviously used the services of a professional taxidermist. 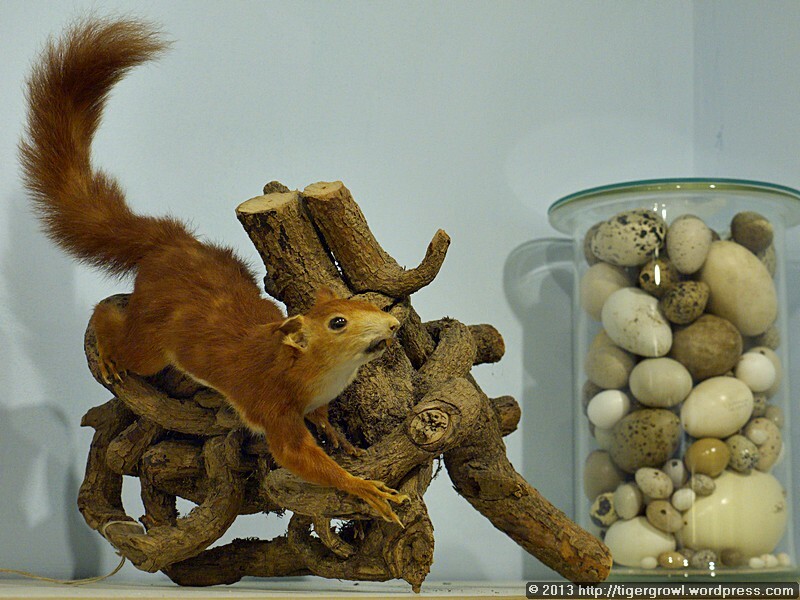 Not everything merited the same care, however, and in contrast to the lifelike animal above, see the jar containing eggs in complete disorder. It is when we come to the insects that we see how quantity and completeness become more important than any consideration of individual species. On the walls there are glass-covered boards covered in rows upon rows of insects, covering genera and species and sub-species. In the drawers there are masses more. The modern naturalist looks on this profligacy with horror – at least, he should so look upon it – even though murmuring an exculpatory “They knew not what they did”. From the outside, the museum appears to be of moderate size. It rather resembles a small chapel or “tin tabernacle” but once you enter, it seems to expand, Tardis-like, to become larger on the inside than on the outside. The above photo shows one aisle of three, and even this does not run the whole length of the building. I think that once he had moved his collection from his house to here, Booth must have redoubled his efforts to a veritable collecting frenzy because the building is full. 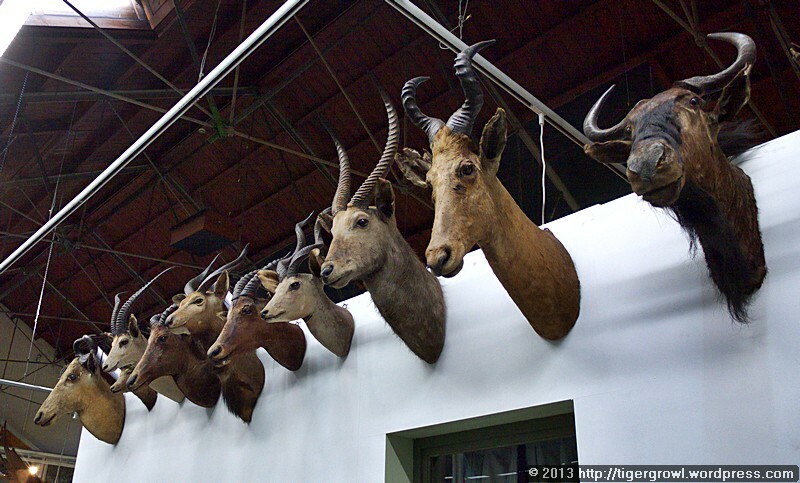 Booth concentrated on British and perhaps European wildlife and exotic animals appear in relatively few examples, such as this row of heads, displayed like those of traitors on London Bridge or as hunting trophies – in fact, I suspect that they could well have been the latter originally. One of my favourites as a child was the head of an elephant. I expected to see it here but could not find it and when I asked the staff, who were friendly, well-informed and helpful, none knew of any such head. Either it is in store somewhere or has been disposed off. 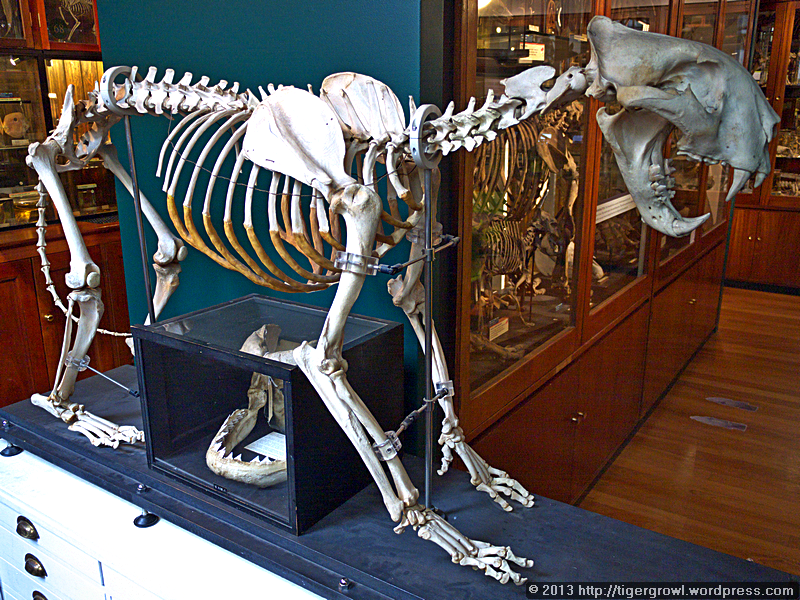 One place where exotic and familiar come together is in the skeleton section where we see the skeletons of a tiger and a house cat side by side. For some reason, this seems to be a not unusual pairing in natural history museums, perhaps to demonstrate the remarkable similarity between the two, if we overlook size. 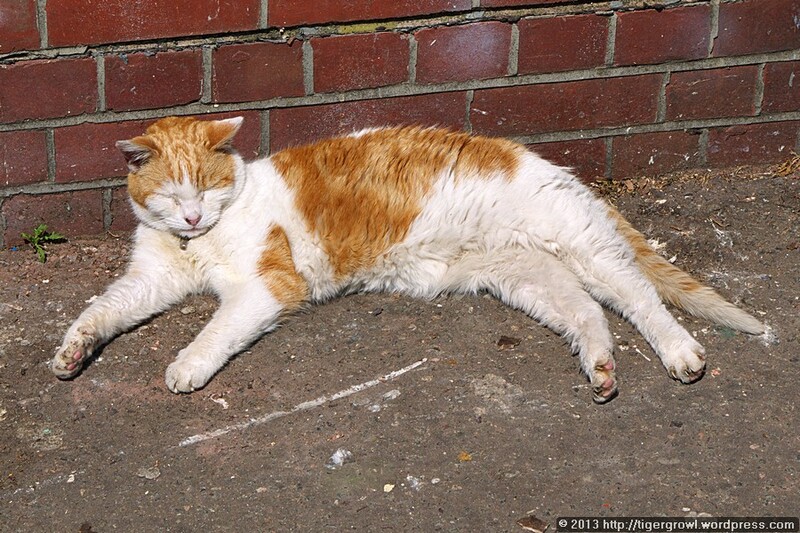 A domestic moggy is truly a miniature tiger. 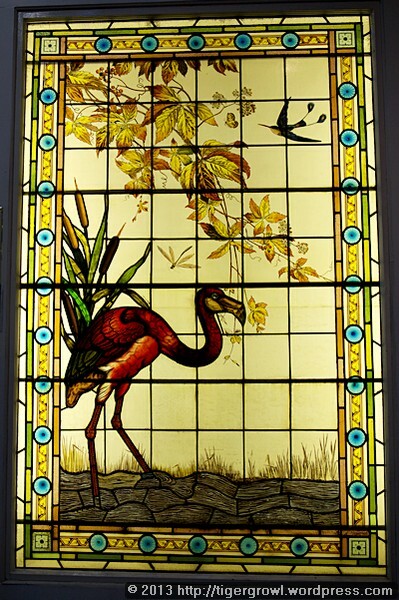 An exhibit not originally collected by Booth is a pair of stained glass windows depicting wildlife, of which I show one above. The maker is not known but the windows came from the old demolished Courts furniture store where they would have been installed around 1890. 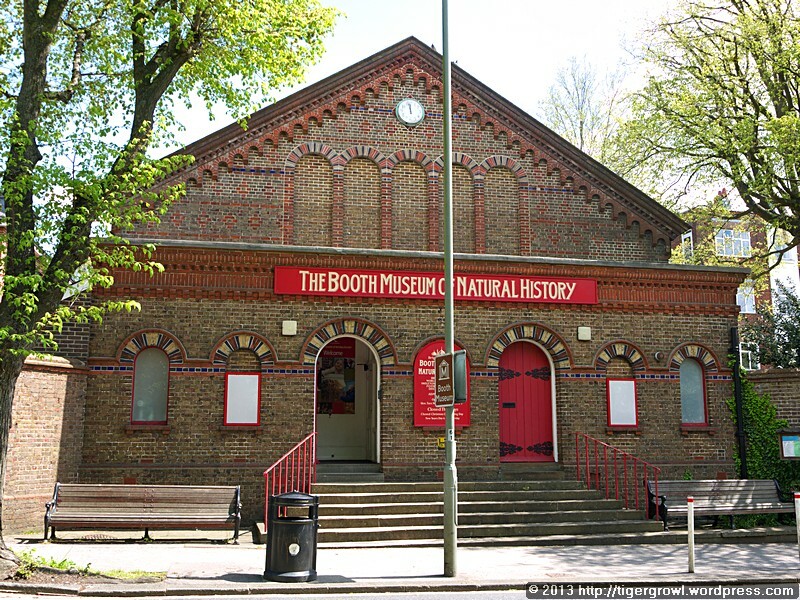 The Booth Museum is both a natural history museum that we can use to study wildlife and also a monument to Victorian “collectionism”. From it we gain an insight into the Victorian concepts of nature and environment and an impression of the man himself who, though he has left us a resource that we can use for our own purposes, lived and operated in a world very different from ours. After viewing the Booth Museum, we went down to the seafront. 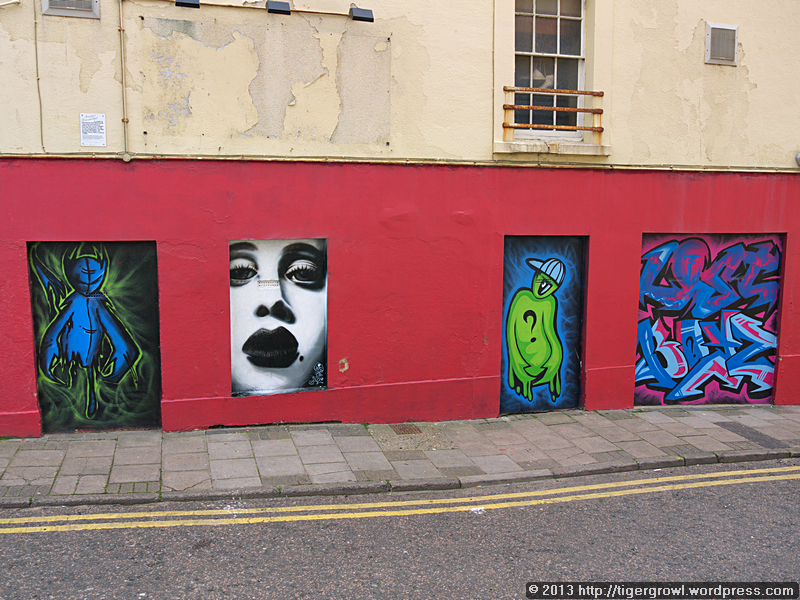 Brighton is not one of the quieter seaside resorts but, while it provides plenty of popular entertainments, it never slides into vulgarity like some towns I could mention. 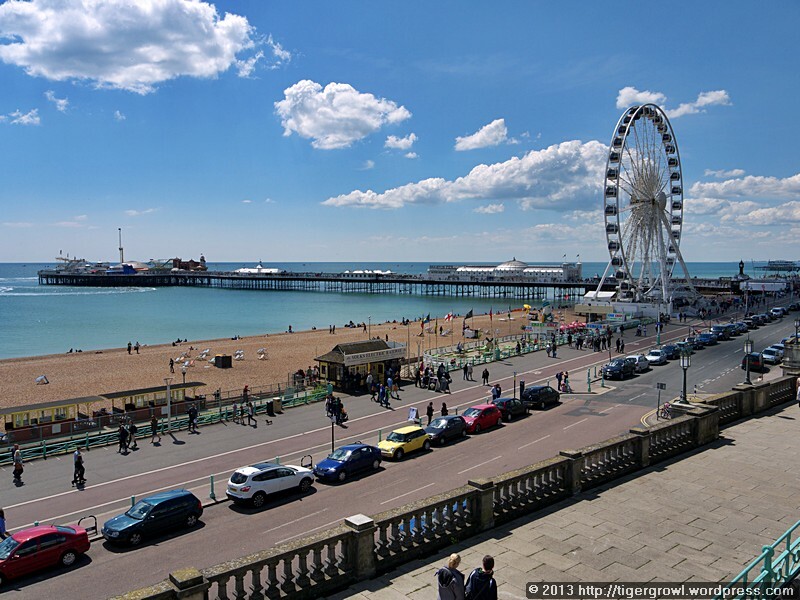 The Wheel is relatively new but the Pier (today called Brighton Pier but known to older Brightonians as the Palace Pier) has been here since 1899. 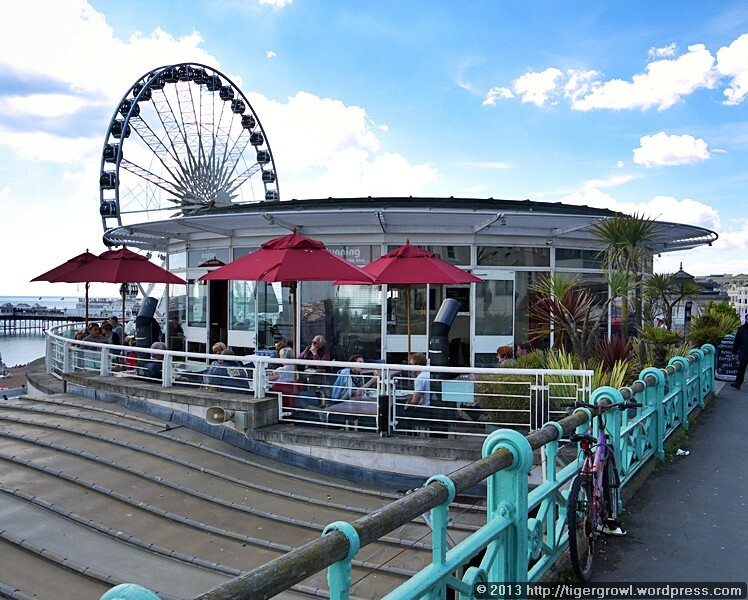 It is the sole survivor of Brighton’s three piers. The original Chain Pier (1824) was first damaged and then swept entirely away by storms, while the West Pier, closed in 1975 for safety reasons, was later destroyed by fire. 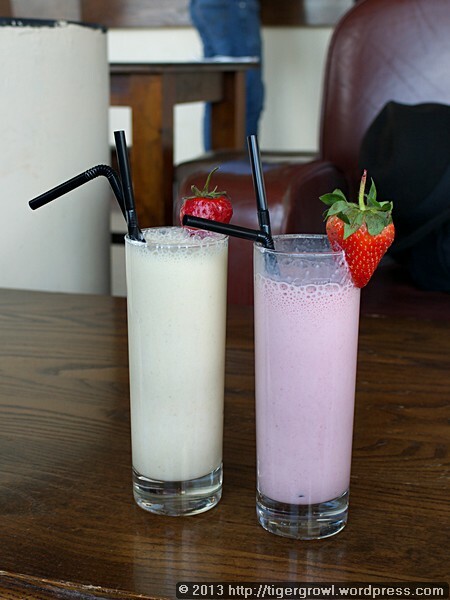 We went into this quaintly shaped round cafe restaurant called The Terraces and treated ourselves to milkshakes. Later we went for a stroll along the seafront. 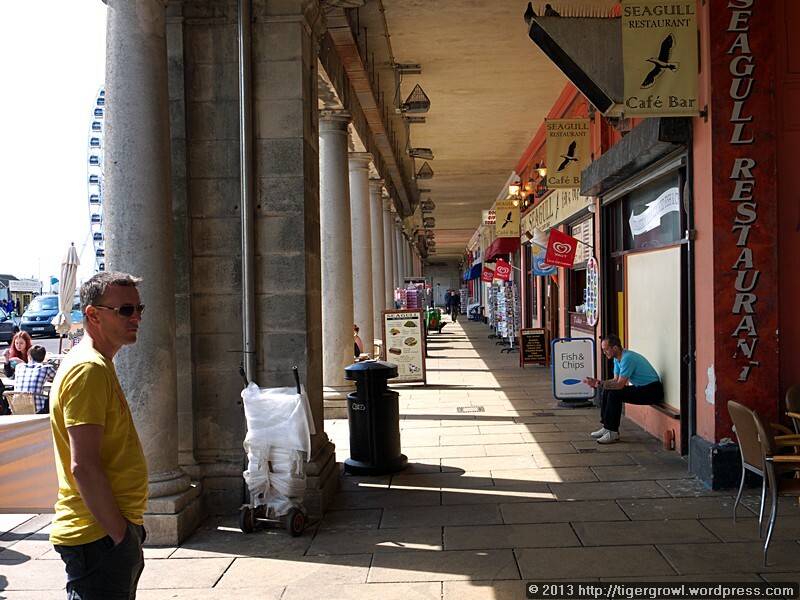 Under the arcades you find small shops selling the usual things – post cards, ice cream, seaside mementos, etc – and fast food outlets. This row of parked motorcycles shows that the biker fraternity was out in force, as is usual in Brighton on a sunny weekend. 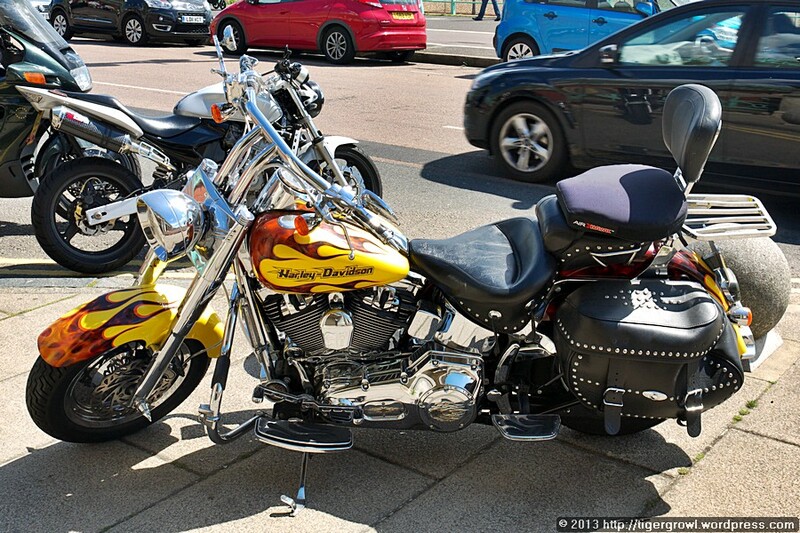 Bikers seem to love Brighton (and other seaside towns). We thought to stop and pass the time of day with this domestic tiger but he made it clear that he was far too busy to chat. We left him to his toil and discreetly moved away. 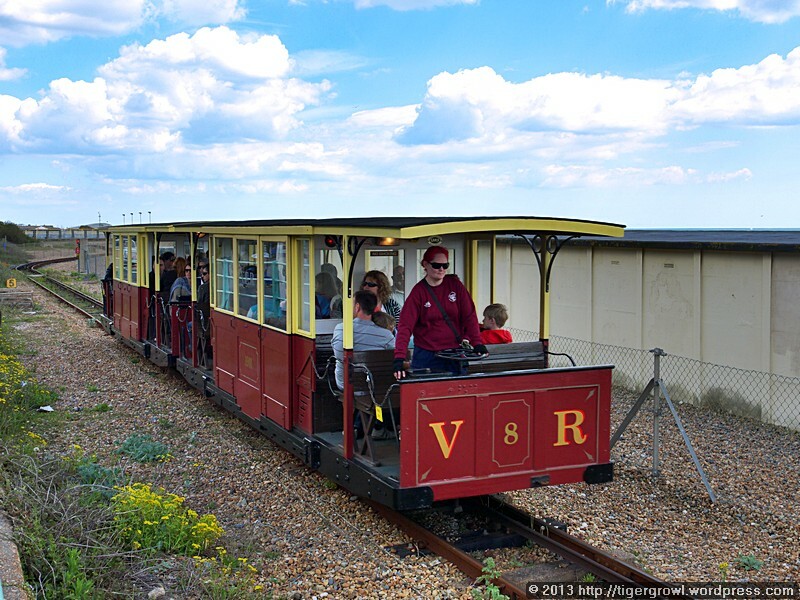 When you know that Brighton’s seafront electric railway was inaugurated in 1884, you might think that the letters “VR” on the the front of the cars stand for “Victoria Regina” but they in fact stand for “Volk’s [Electric] Railway”. 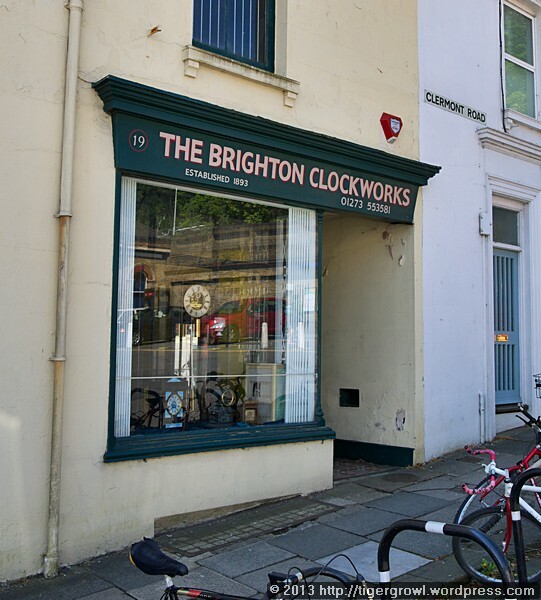 Son of a German clockmaker, Magnus Volk was born and brought up in Brighton. He was interested in technology and something of an inventor. He provided his own house with electric lighting. 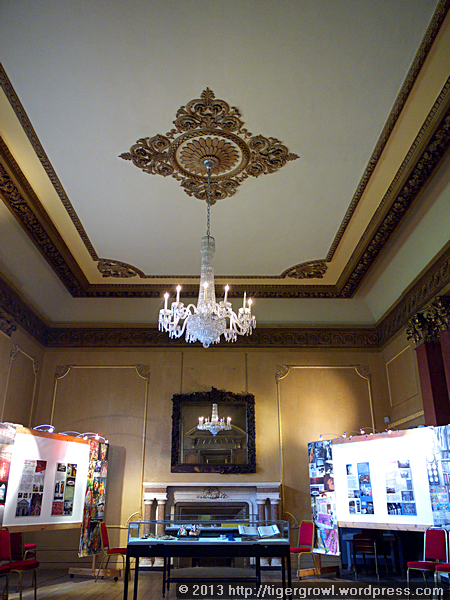 the first in Brighton to enjoy this amenity, and later installed the first electric lighting in the Royal Pavilion. Despite initial hesitation on the part of the authorities, Volk managed to built his railway which was an immediate and lasting success. The only time it was out of service, as far as I know, was during the Second World War when the whole seafront was fenced off and mined against German invasion. Once the threat had passed, Volk’s electric railway made a triumphant return and still operates a frequent service today. You cannot visit Brighton and not go to see the Royal Pavilion. Well, you can, of course, but why would you? The Prince Regent today is regarded as a decadent spendthrift and a self-indulgent sensualist who neglected his duties and chronically overspent his finances in the pursuit of pleasure but, however much we may criticize him, he conferred at least one inestimable favour upon Brighton by both putting it on the map and providing it with an exotic Royal Palace which for novelty and beauty has no equal. 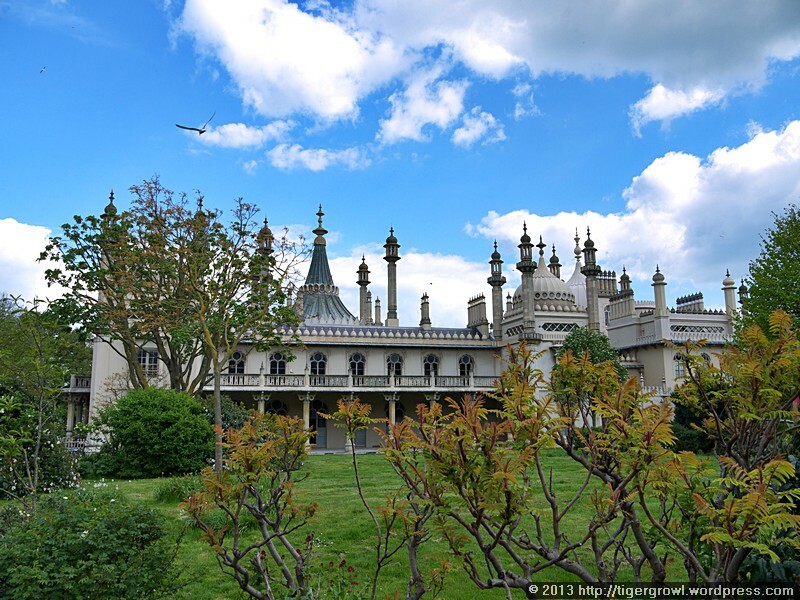 The Royal Pavilion was last in Royal hands in the reign of Victoria but since then it has been owned and maintained by the town – and now city – of Brighton. 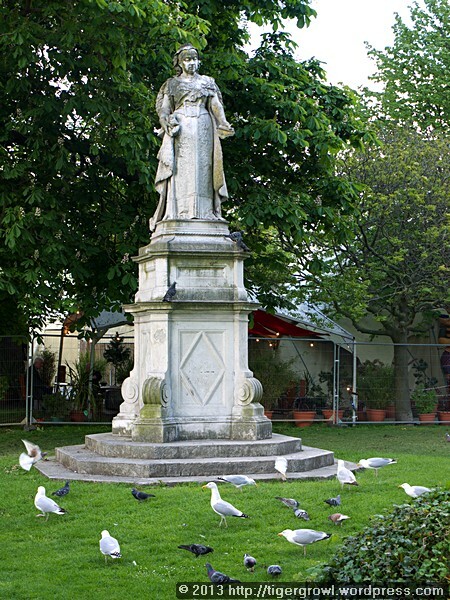 In the Pavilion grounds, we came upon a somewhat grubby Queen Victoria apparently lecturing a group of gulls and pigeons. Food scattered by some charitable soul in the grass below Victoria’s monument may go some way to explaining the unusual assiduity of their attendance upon Her Majesty. 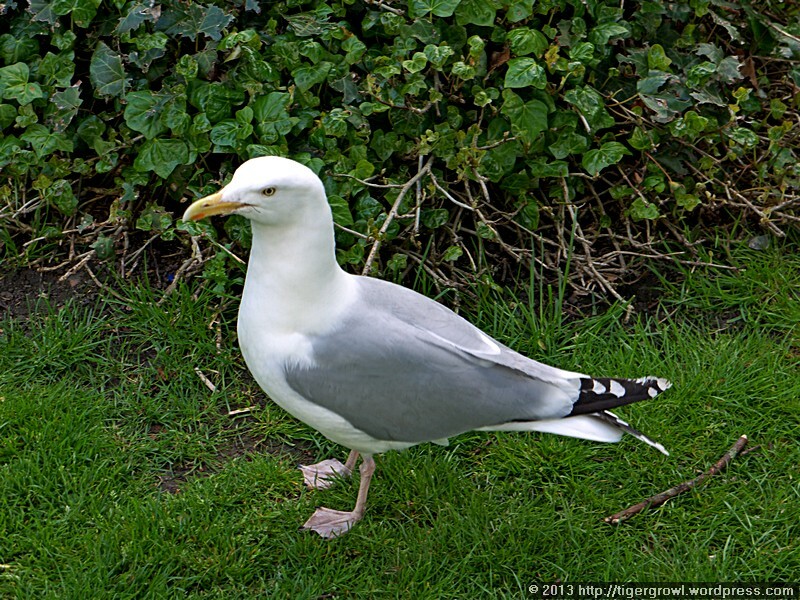 Gulls are opportunists of the first order, and this one did not scruple to turn his back on the monarch and approach us in case we had coming bearing alms. We had not but if he was disappointed, he was too proud to show it. As the town I grew up in, Brighton is familiar to me and yet is still capable of providing new experiences, such as the Booth Museum and Preston Manor (yet to be visited). If I could no longer live in London, Brighton would be one of the places where I would be able to make my home and be content. 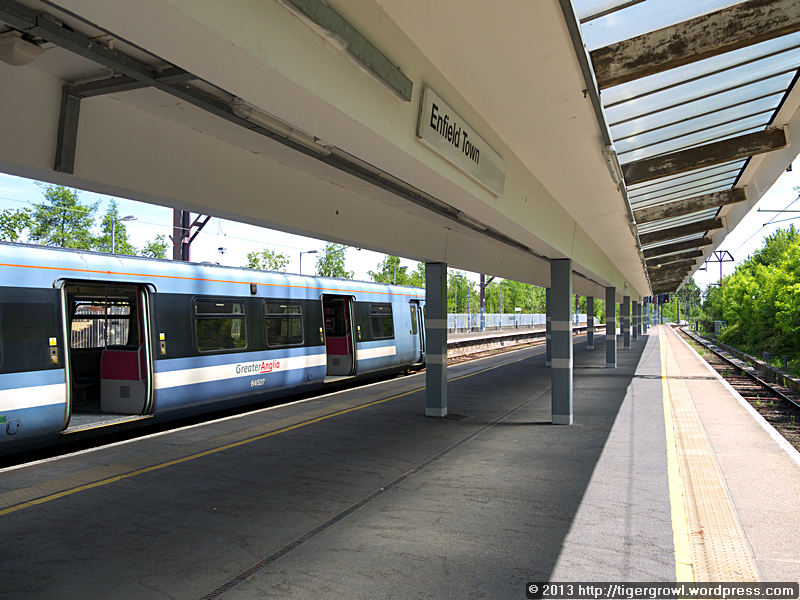 A train took us to Enfield, an old market town that we have visited before. Once there, we struck out across town without any particular route or goal in mind, taking photos of anything that seemed interesting. 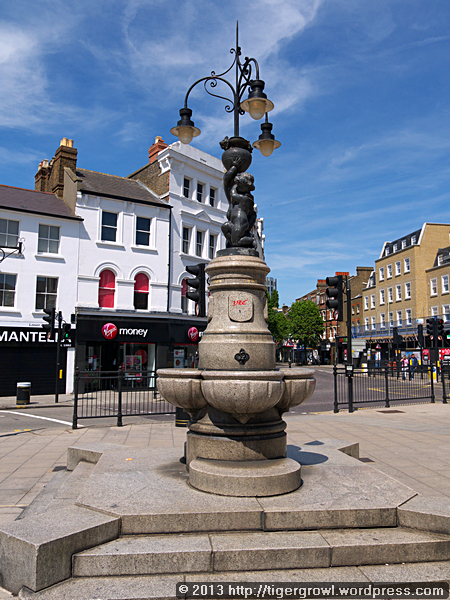 The Victorian drinking fountain, financed by public subscription in 1884, stands on the corner of a road that at this point is called simply The Town, giving some idea of its importance. Another indication that this was the business centre already in the 19th century is indicated by the presence of tall, impressive Victorian buildings intended for business. The one on the left is today a Barclay’s bank (the bank where the world’s first cash dispenser was installed) and has perhaps always been a bank. 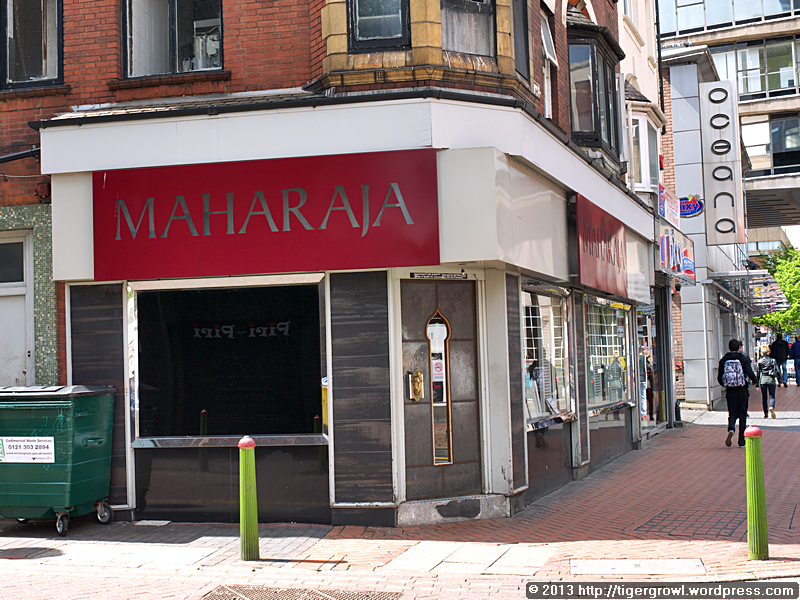 The other building now has shops on the ground floor with living quarters above them. Among the relief work on the front it displays a date of 1897. 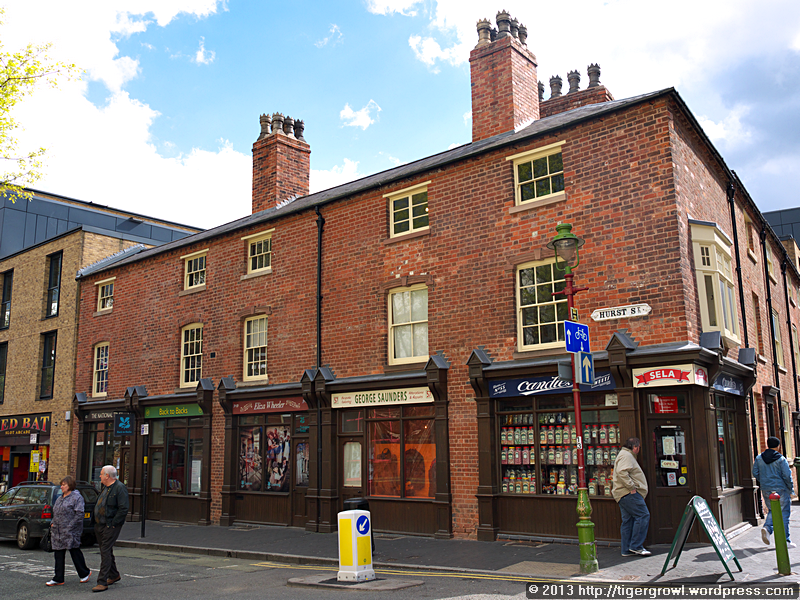 You don’t have to look far to see why this became the centre: this building, called the Market House, marks the location of the weekly market. The first charter was granted by Edward I is 1303 and the market ran successfully until the early 18th century when it suffered a period of decline. 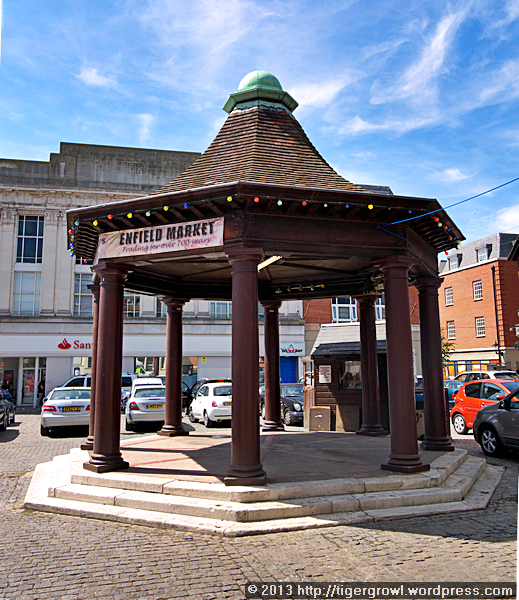 It was revived in the 1870s and the present octagonal building known as the Market House was erected in 1904, a copy of a much older one that had been demolished at the beginning of the 19th century. As for the name of Enfield itself (made famous by the name of the small arms once manufactured here), there is slight uncertainty over its meaning. The first syllable derives from Anglo-Saxon, either Eana, a personal name, or ean, meaning a ‘lamb’. Thus Enfield is either ‘land belonging to Eana’ or ‘land where lambs are reared’. 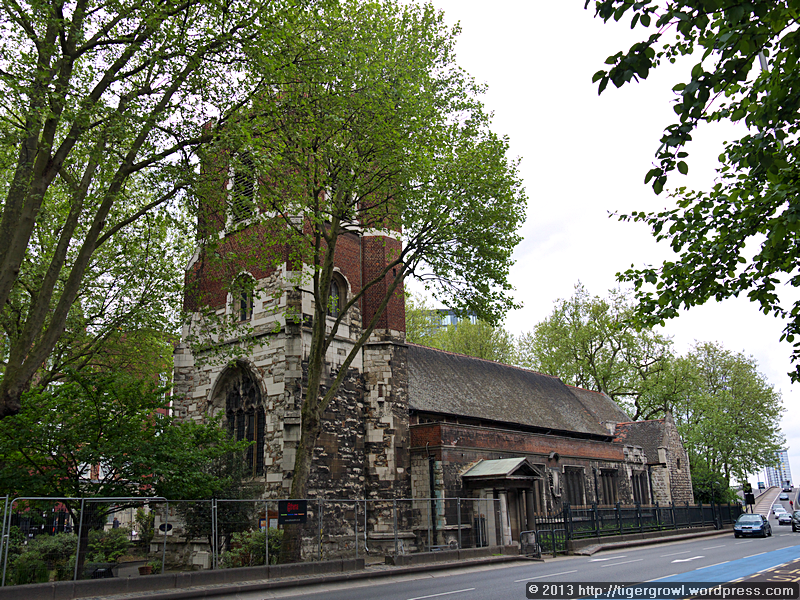 Behind the market square stands what would have been the original parish church of Enfield, St Andrew’s. 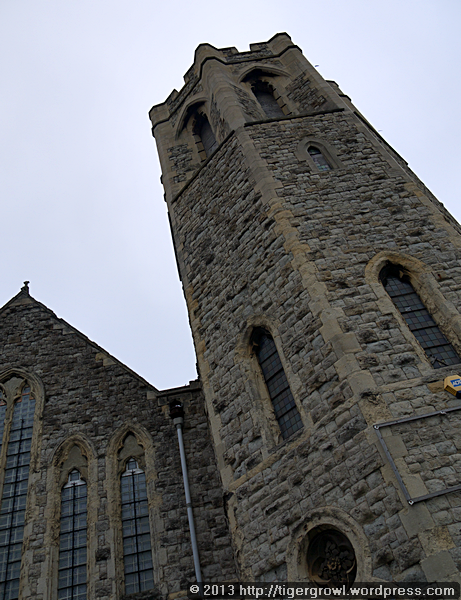 This pleasantly proportioned stone church is the result of much rebuilding and refurbishing. Parts of it date from the 12th century and the tower is largely 14th century. The graveyard of St Andrew’s, grassed over and planted with mature trees, is today as much a garden or a park as a burial ground. 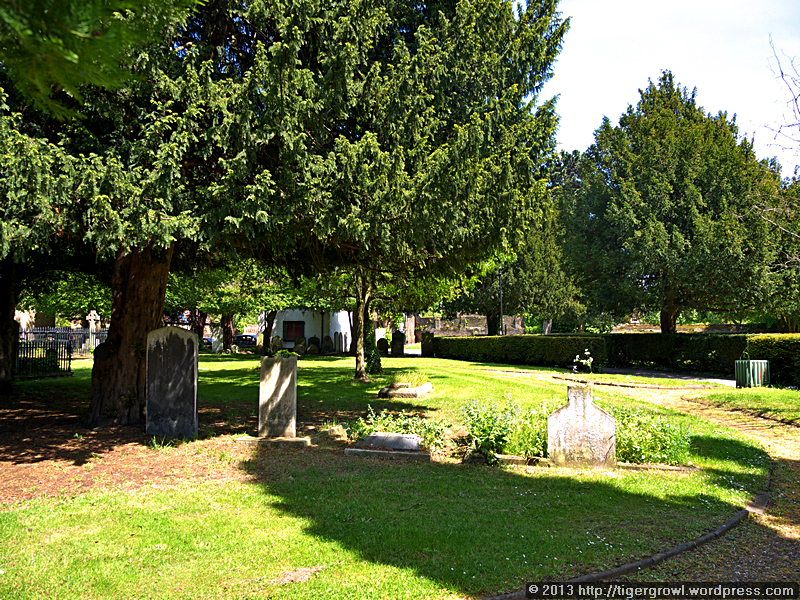 There are still gravestones to be seen but the whole has been tidied up to make a pleasant public space. When I saw this strange little building at the back of the church, I did wonder whether it might have been as a “watch house”, a shelter for men guarding the cemetery to deter body-snatchers, though the architecture didn’t seem quite right for that, especially the rather fanciful crenellations. 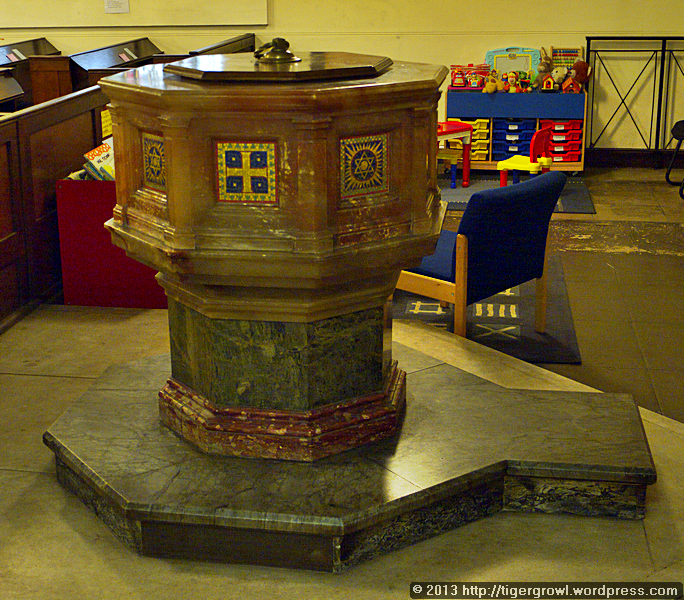 It turns out that its purpose was quite different: it was installed early in the 19th century by Enfield Vestry (the forerunner of the modern Council) to house the parish fire engine! When it was no longer required for that, it served as the mortuary for a while and today is used as a meeting room for the church. As we usually do, we went to look at the local public library. 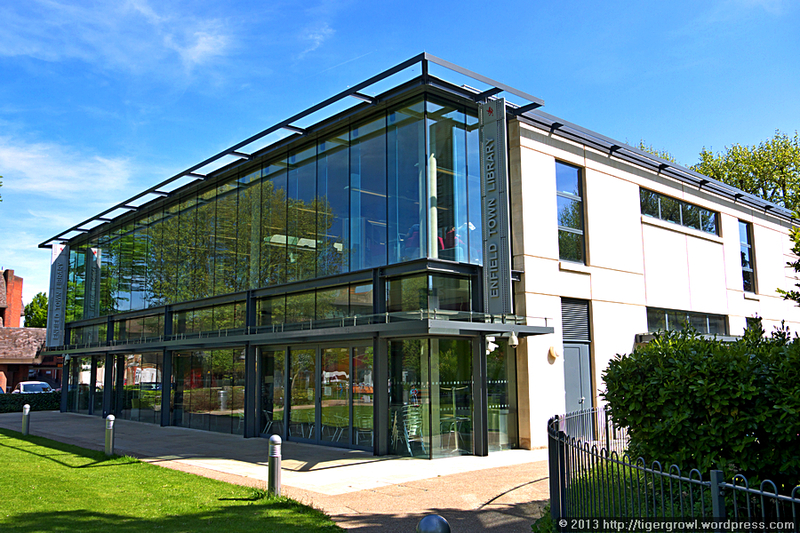 This is the recently extended Town Library, opened in 2010. Enfield has 16 libraries and we can only hope that it manages to keep them, or most of them, in a climate of financial cut-backs. The new library joins onto the back of the old one facing onto Cecil Road. This is a Carnegie library and was built in 1912. While the modern building is quite unobjectionable, as modern buildings go, I make no secret of my preference for this beautiful old structure. Yes, I know we can no longer afford to build like this but that is all the more reason to keep those that we have and not wantonly destroy them to put eyesores in their place. I am happy that this one survives to be admired and enjoyed (and perhaps, to inspire a more aesthetically aware future generation of architects). The library has a very nice garden in front of it with grass, benches and fountains. Anybody can come and sit here and on a sunny day I think it would be quite good to sit here at look through the interesting books you have just borrowed. While the fountain garden is open to the public, a second garden is not. 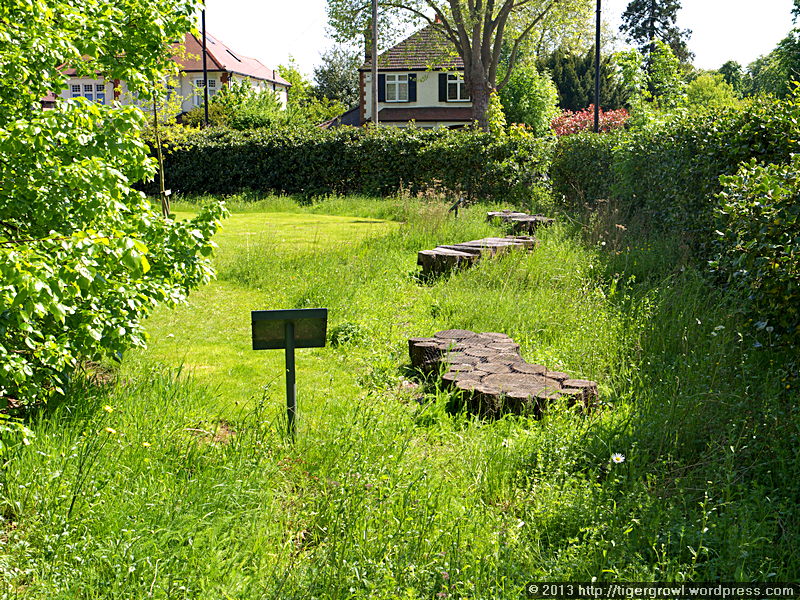 It is a wildlife garden and I was pleased to see, dotted about in the grass, several “bug hotels” or refuges and nesting sites for smaller creatures. It’s not only the people who appreciate the park as an amenity. 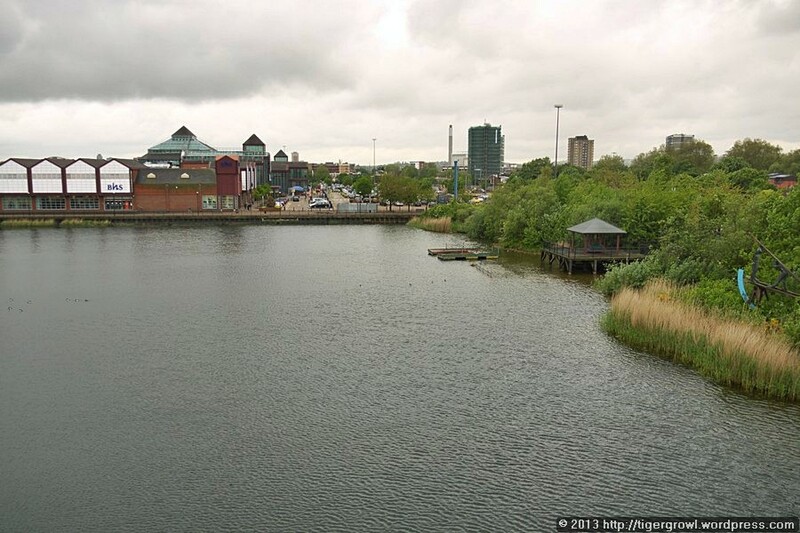 There are ducks, geese, moorhens and coots to be found here, not merely visiting, but as permanent residents. 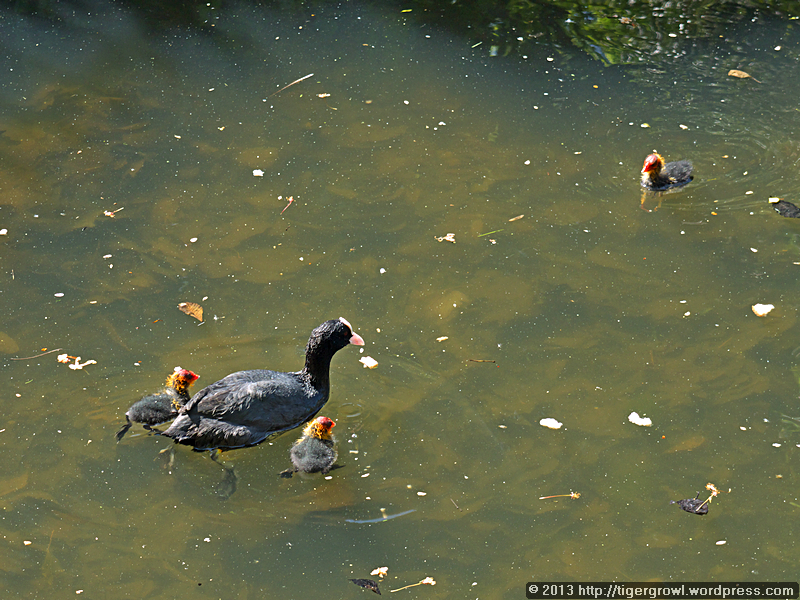 An example was this mother coot taking her three chicks on a foraging expedition. 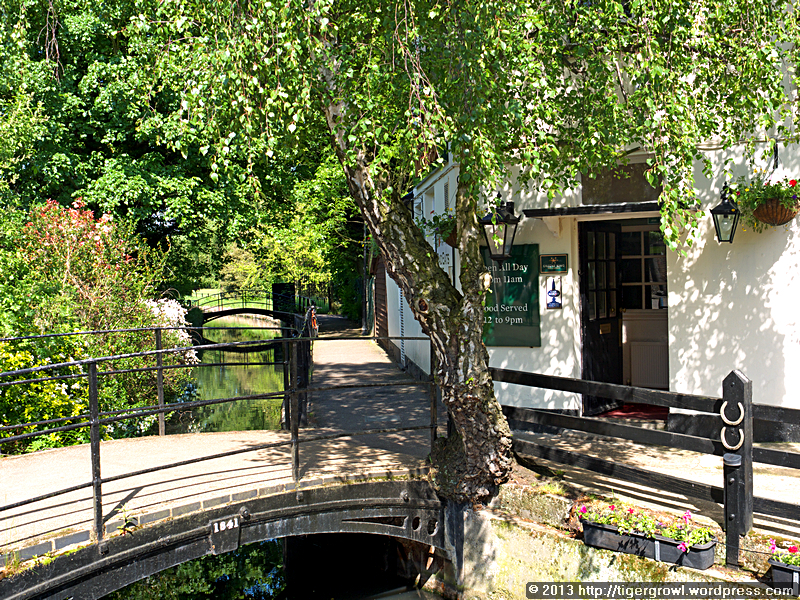 …there is a waterside pub! We, however, decided to move on and we took a bus to our next destination. 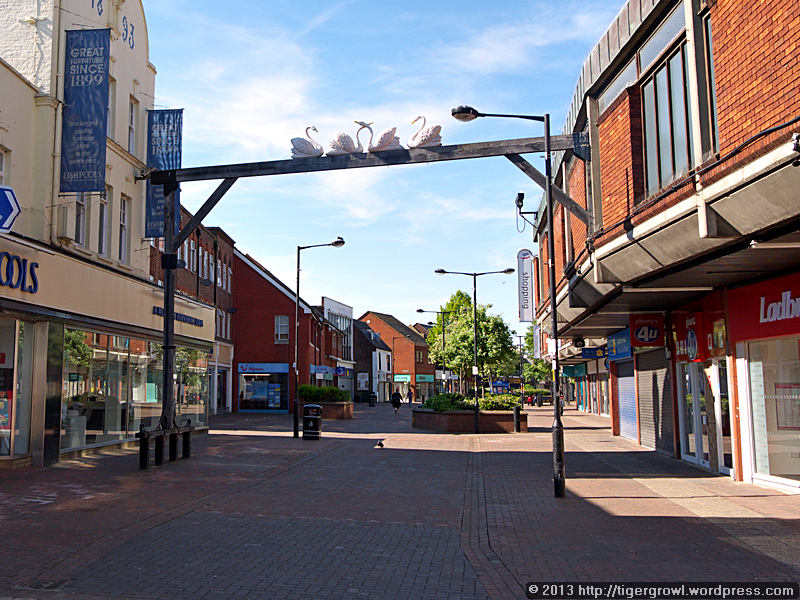 Many people will recognize it immediately from this structure that sits astride the High Street. The sign reminds us of that which used to show the presence of the Four Swannes Inn. The inn is long gone and so, alas, is its sign, for this one is a replica made in 2007. 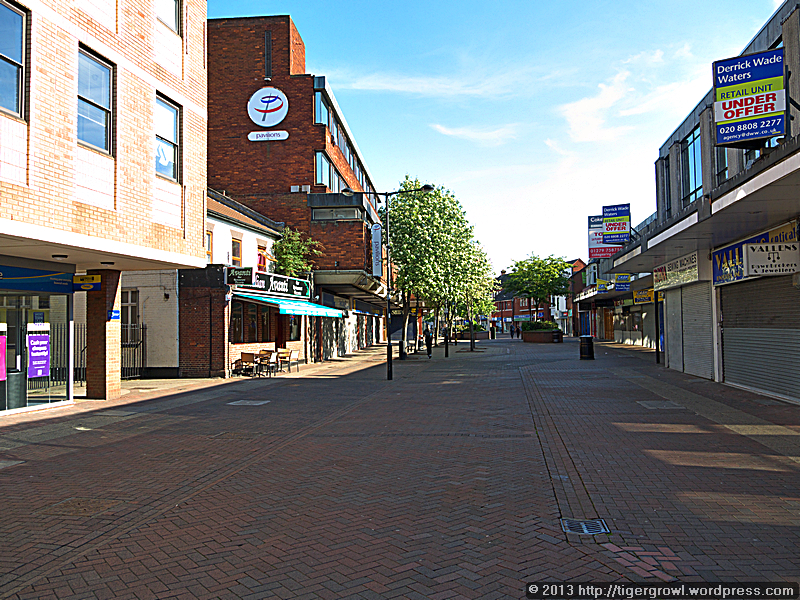 To many people, however, it will indicate that we had come to Waltham Cross. We thought we deserved a break and a treat as it was the last day of the staycation, so we went into a nearby pub and ordered coffee and cake. When we emerged, we found that a hush had fallen over the town. The shops had all closed and there was an end-of-day feeling in the air. We decided to call it a day too, and look for a bus to take us home. We had had a good day out, albeit a little more relaxed than usual, and a good staycation altogether. All I can say is… here’s to the next one! Copyright © 2013 SilverTiger, https://tigergrowl.wordpress.com, All rights reserved.